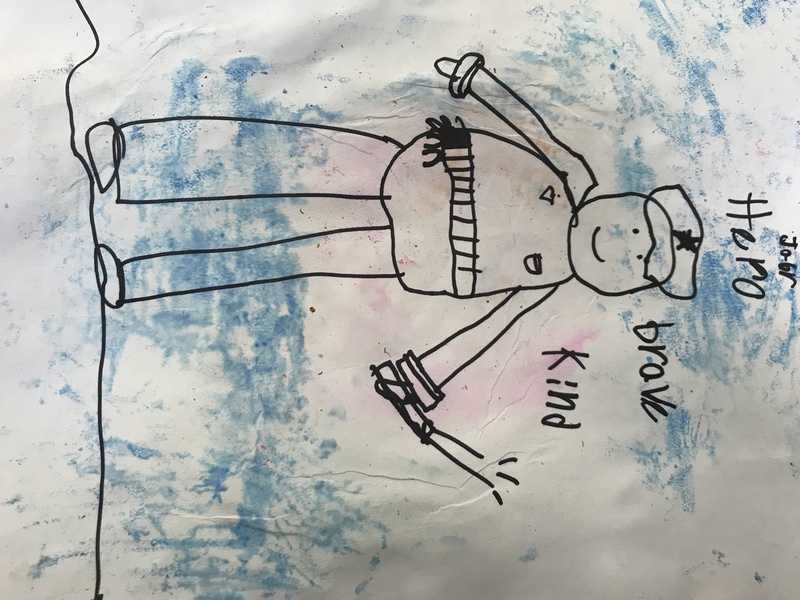 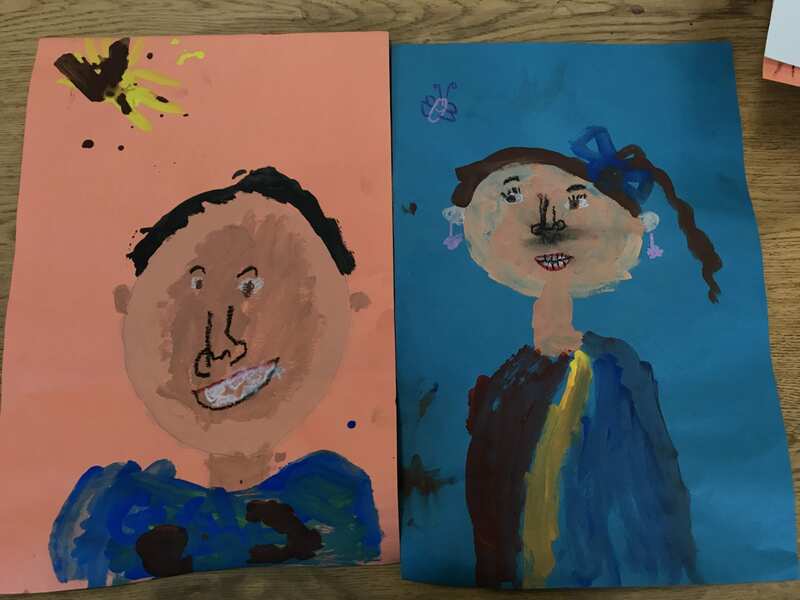 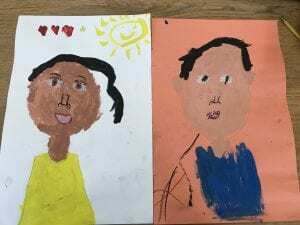 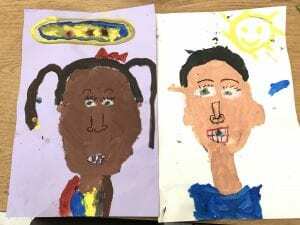 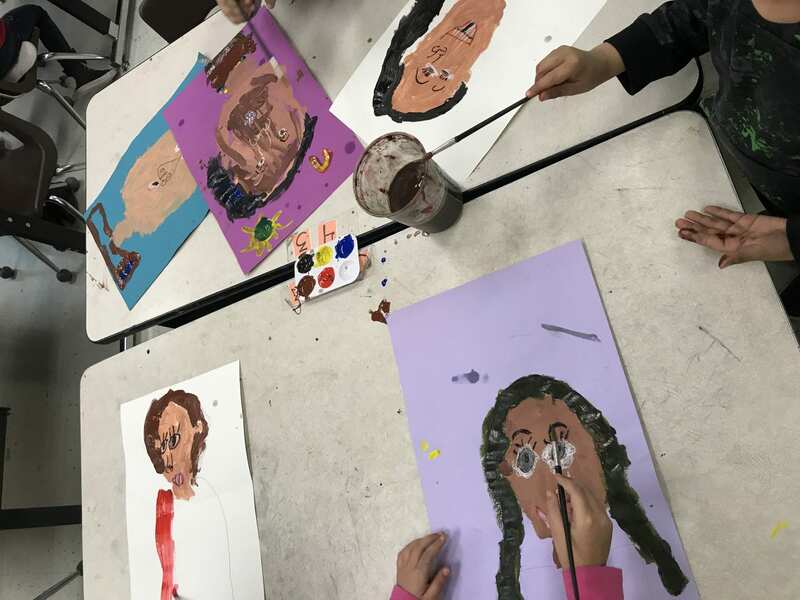 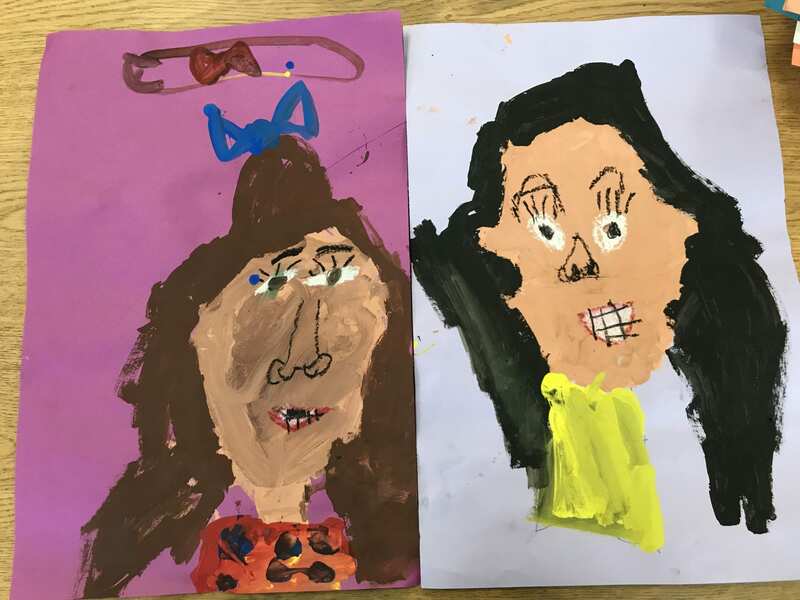 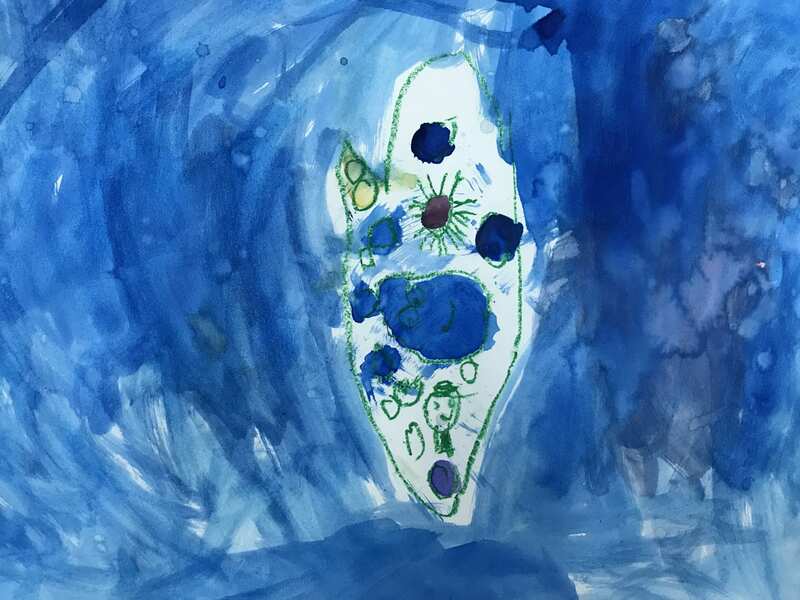 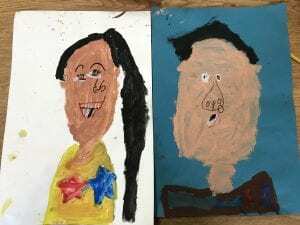 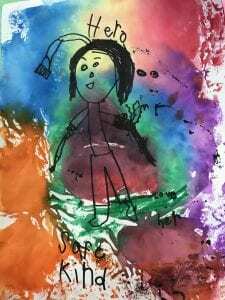 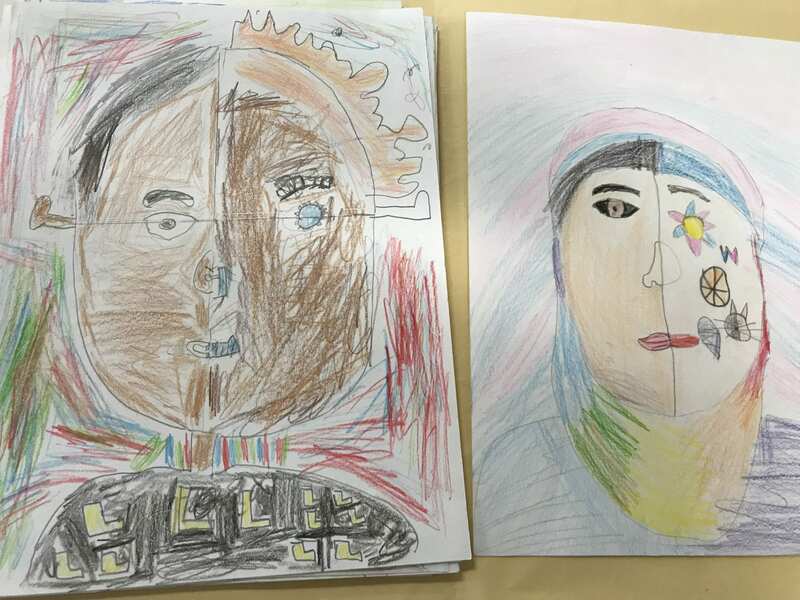 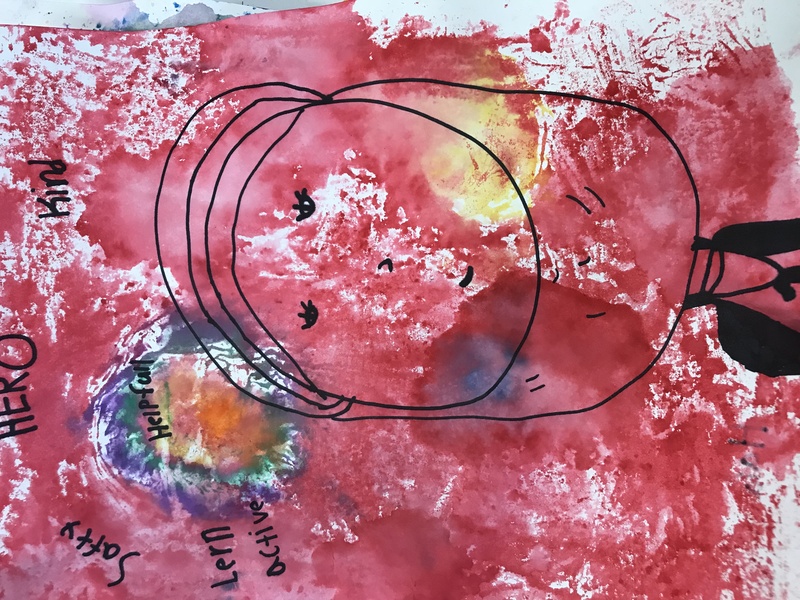 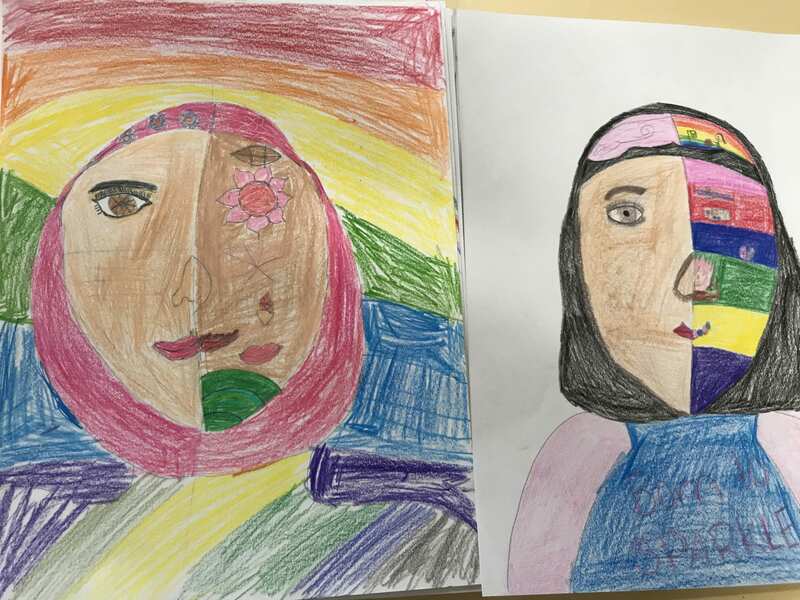 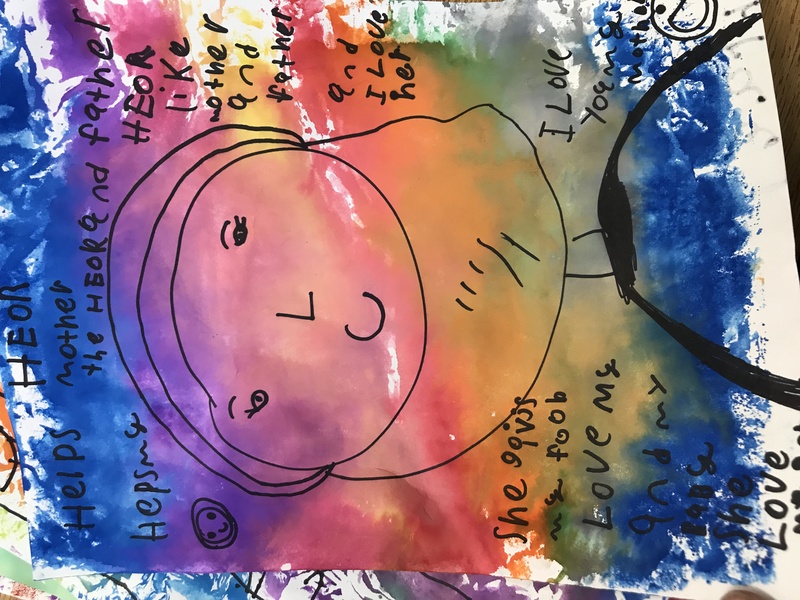 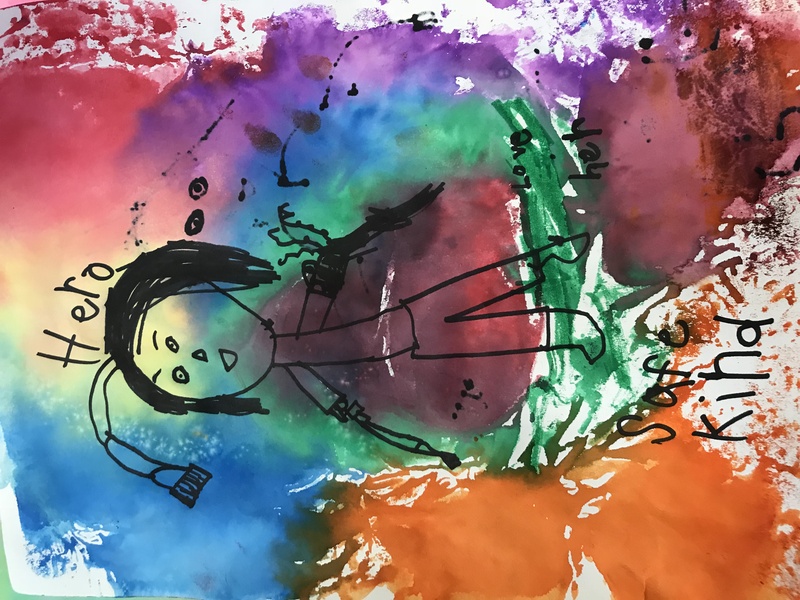 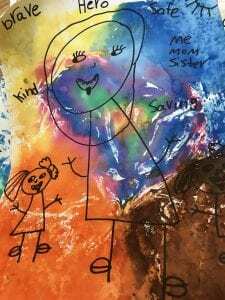 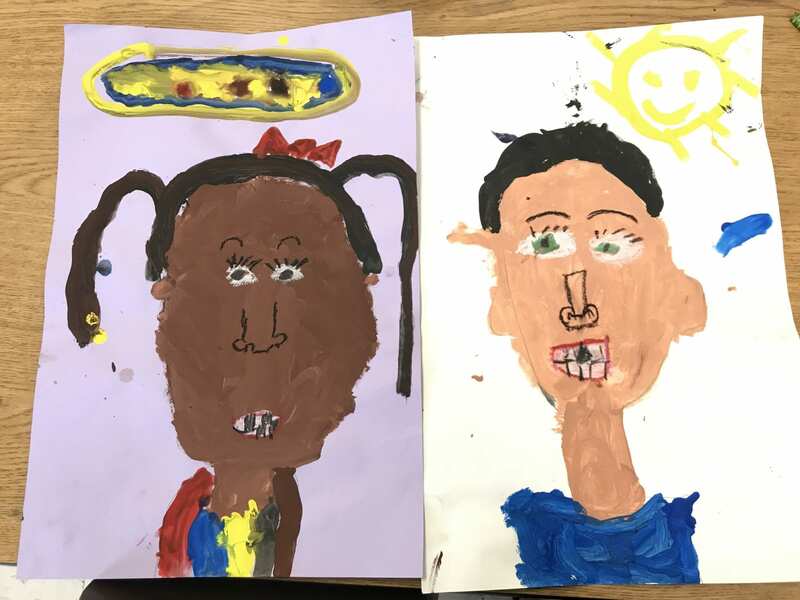 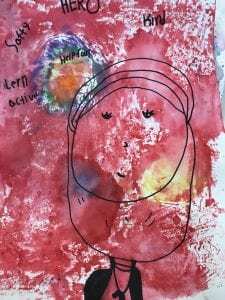 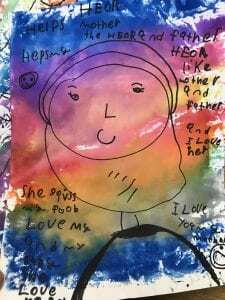 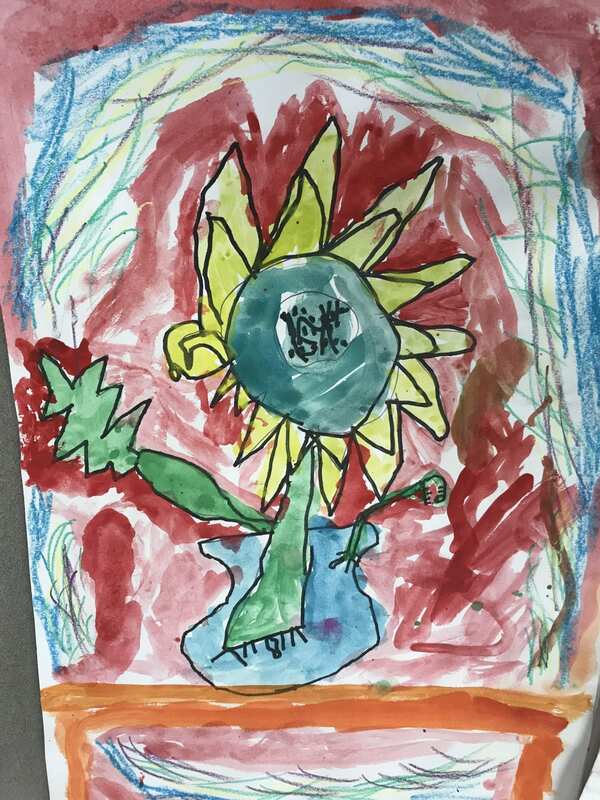 During the month of March Young 5 and Kindergarten artists finished their self-portraits! 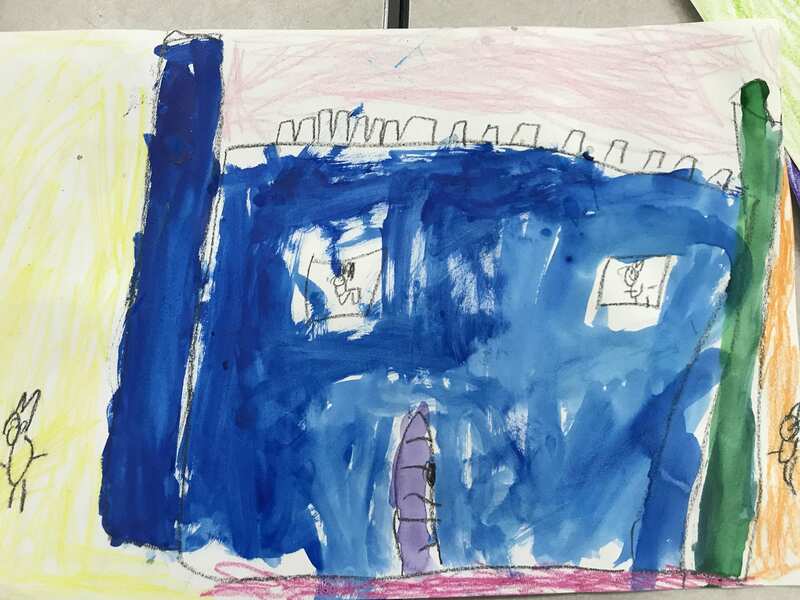 Then they created warm/cool colored castle paintings! 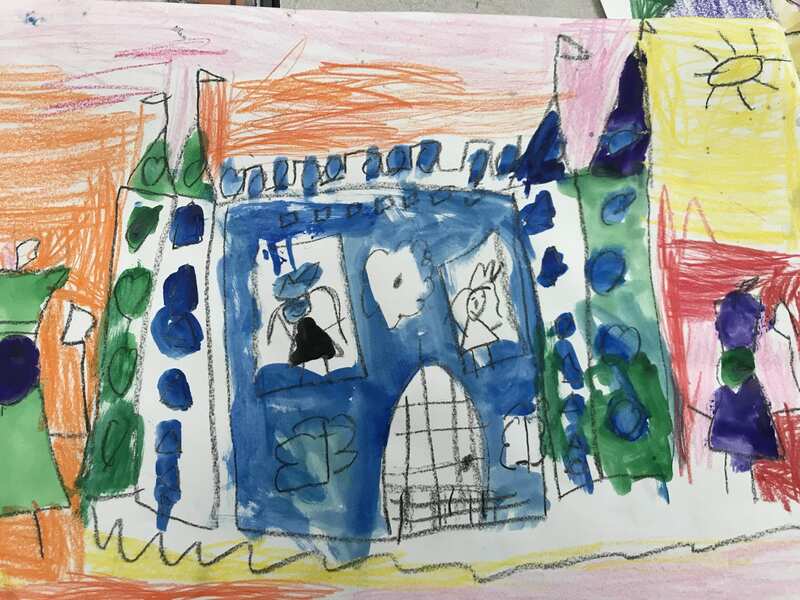 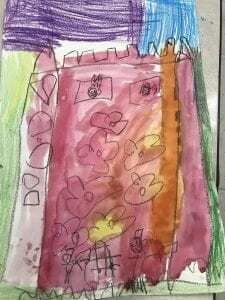 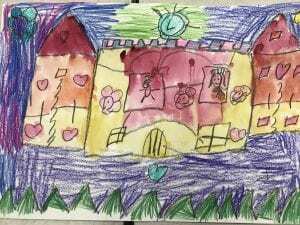 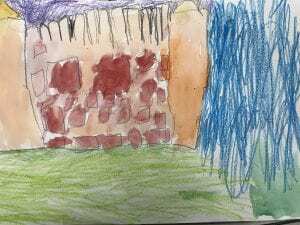 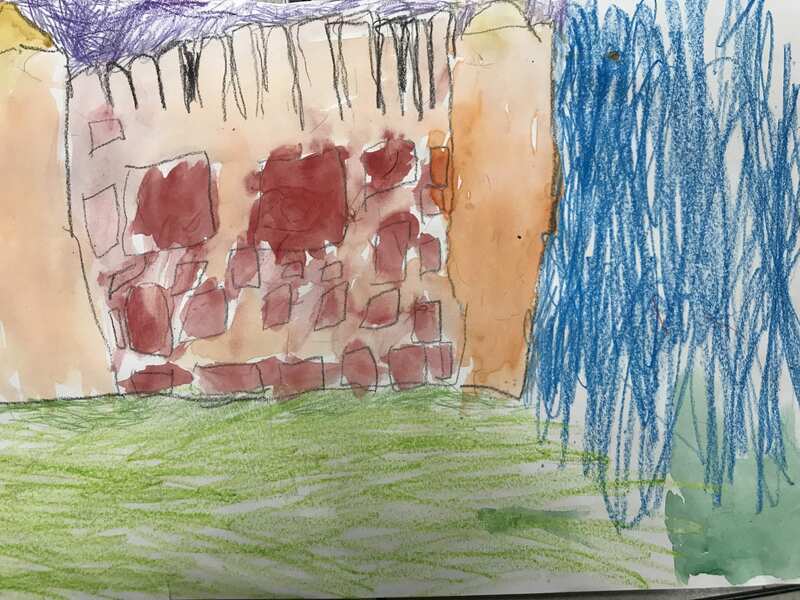 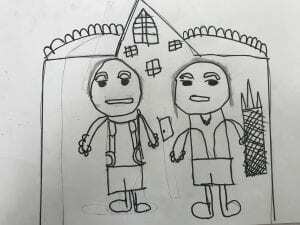 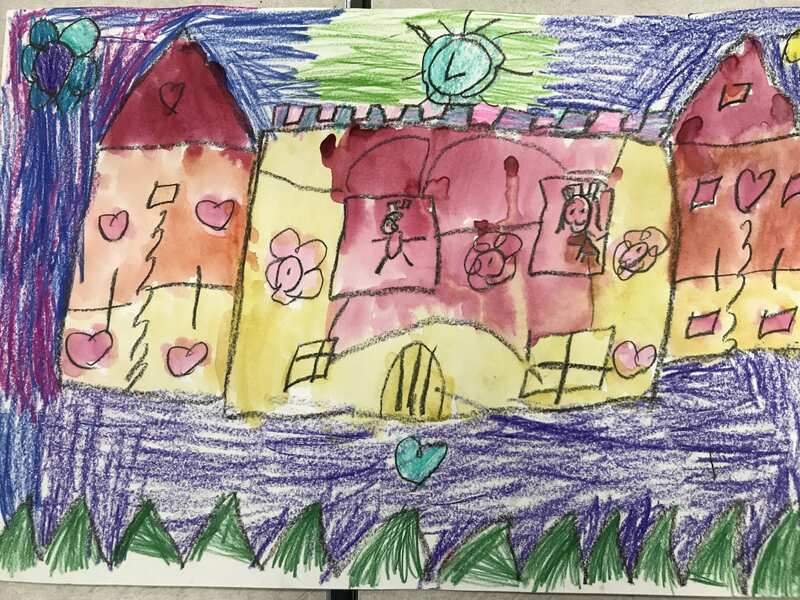 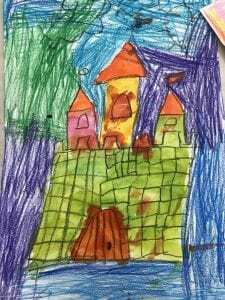 They drew their castles and colored the background with warm OR cool colors, and then painted their castle with the opposite color family. 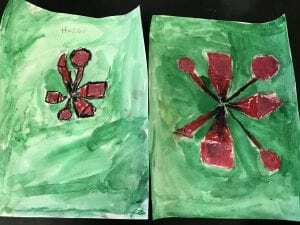 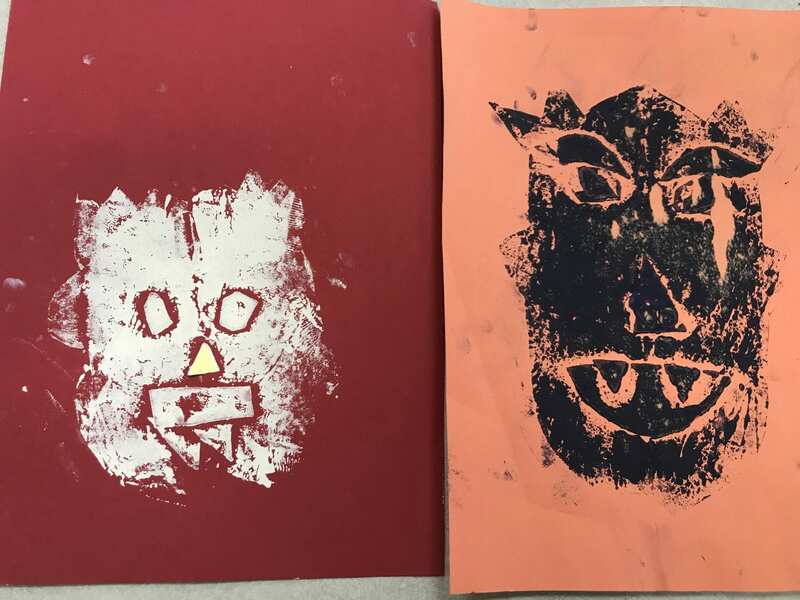 First grade artists created a collagraph plate that resembled a mask and showed symmetry! 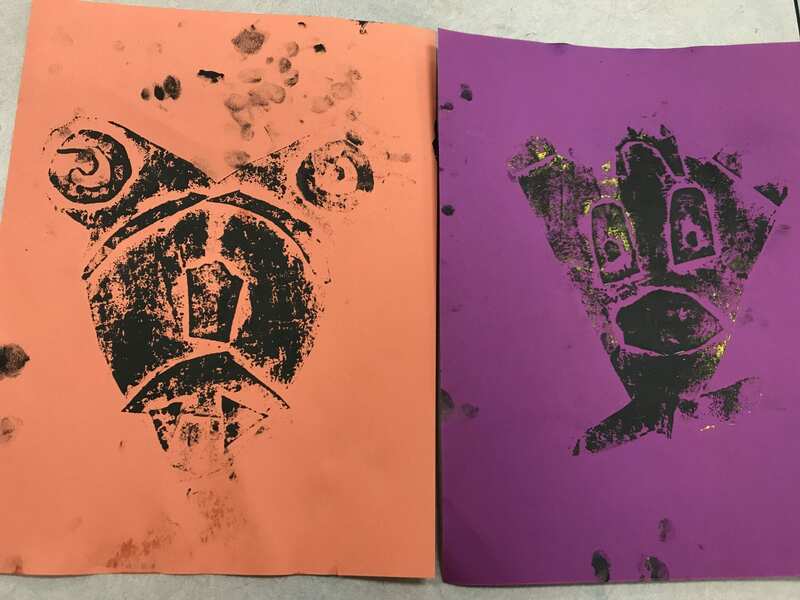 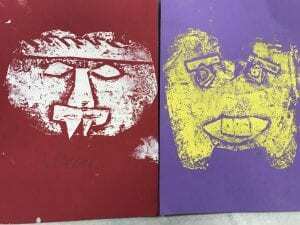 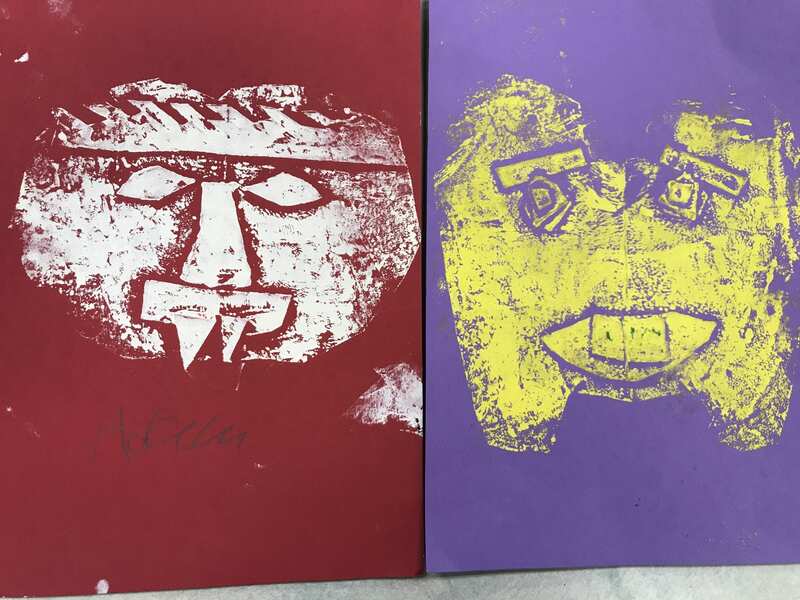 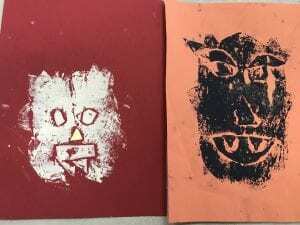 They printed copies of their mask using a brayer and ink. 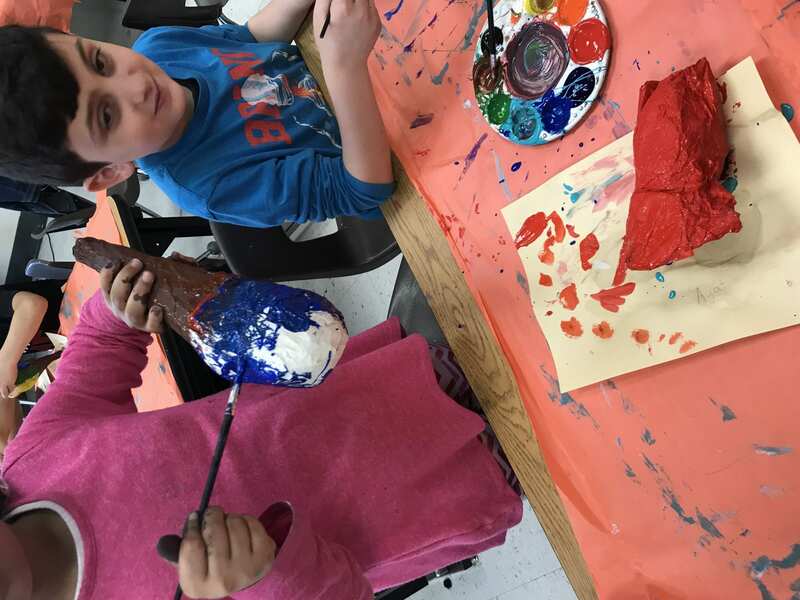 Third grade artists are each creating a paper mache food sculpture! They had to build their food form with newspaper and tape, paper mache all around it, and then paint it. 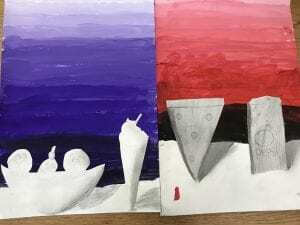 Fifth grade artists finished their notans! 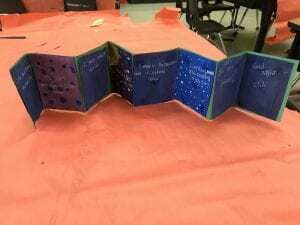 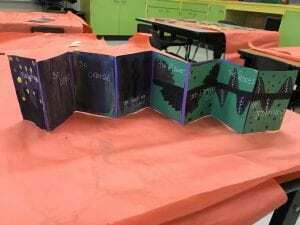 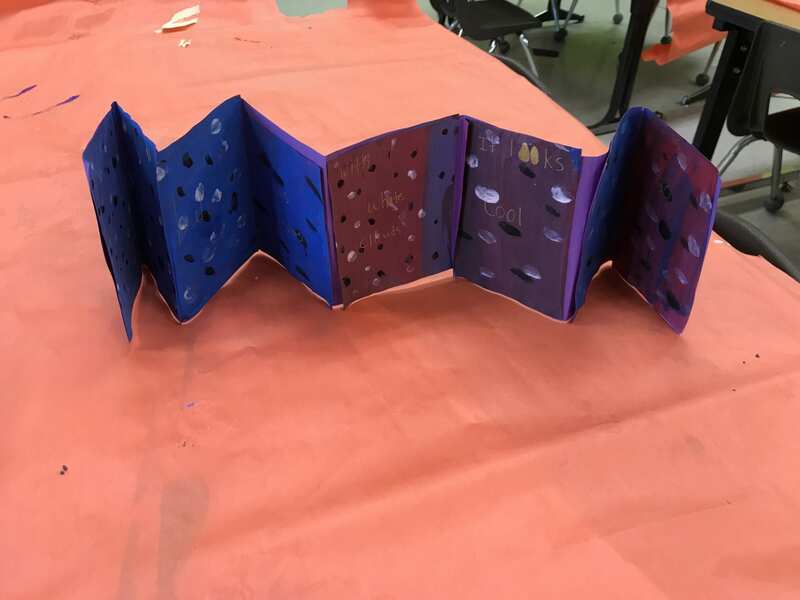 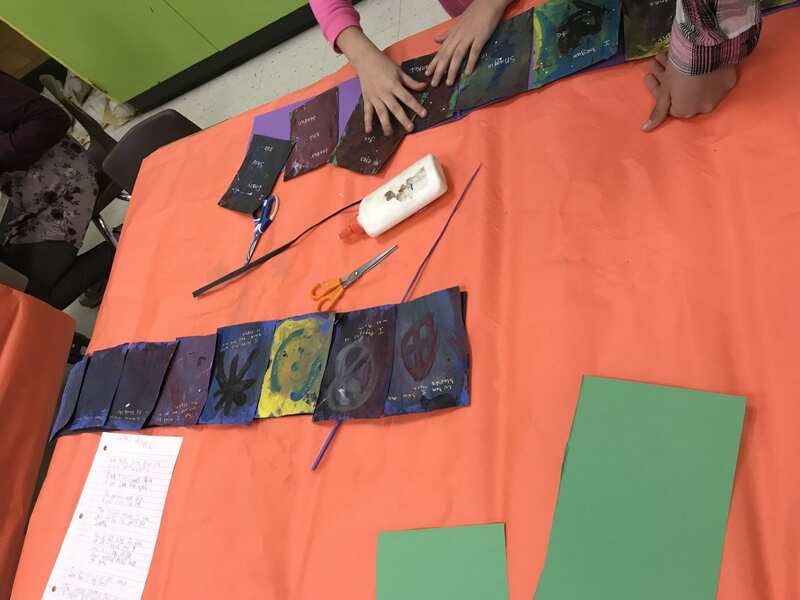 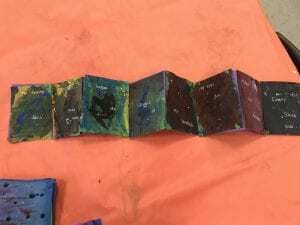 Then they created a series of 8 mini abstract paintings, turned them into an accordion book and wrote a free-verse poem on their book. 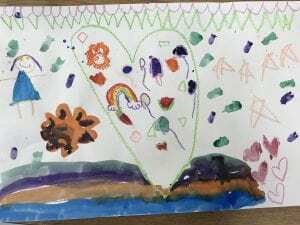 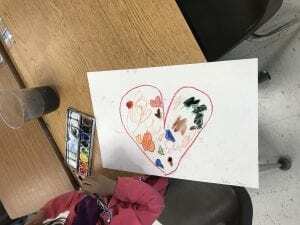 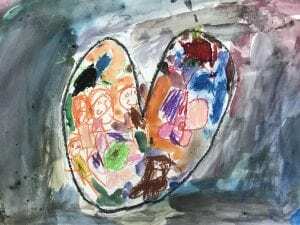 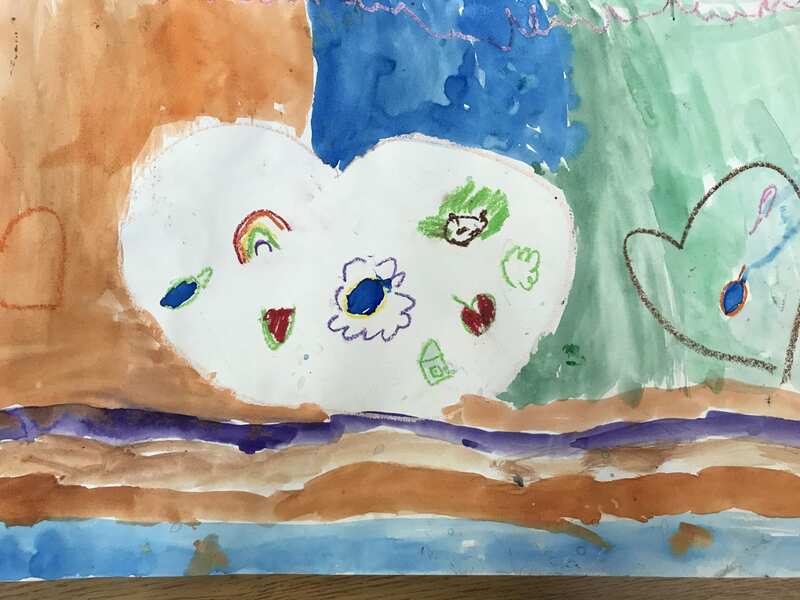 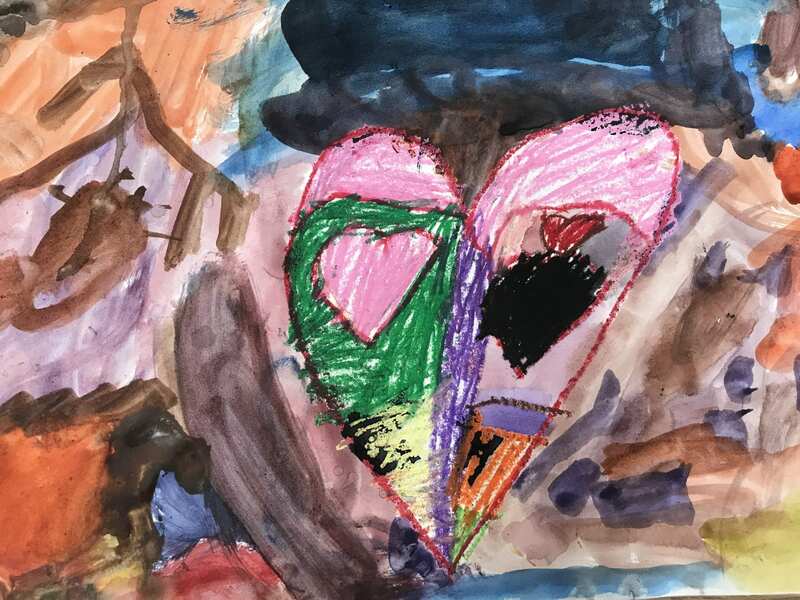 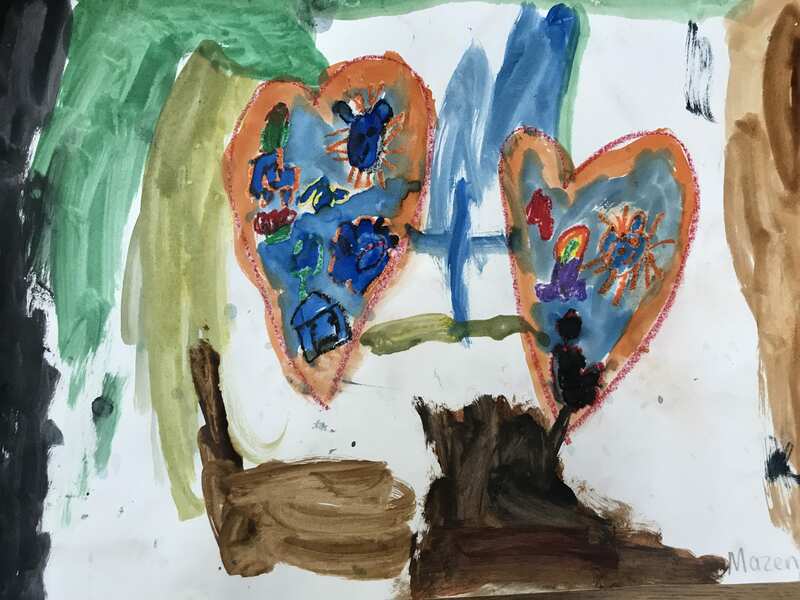 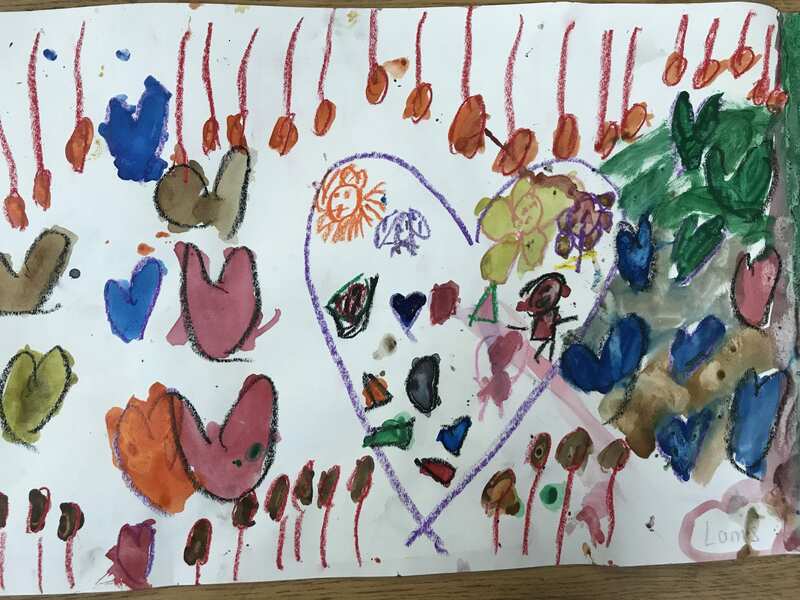 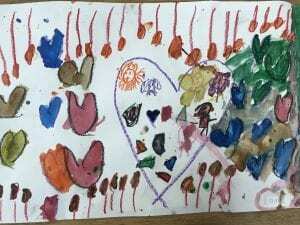 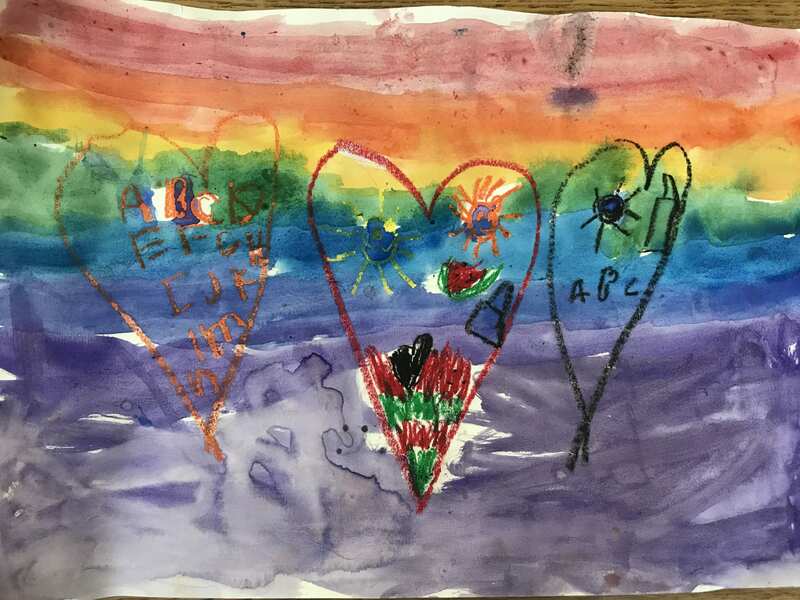 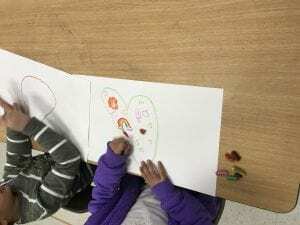 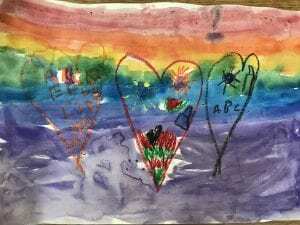 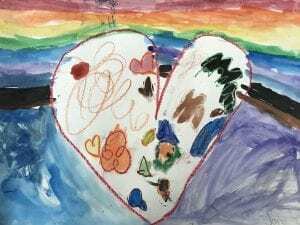 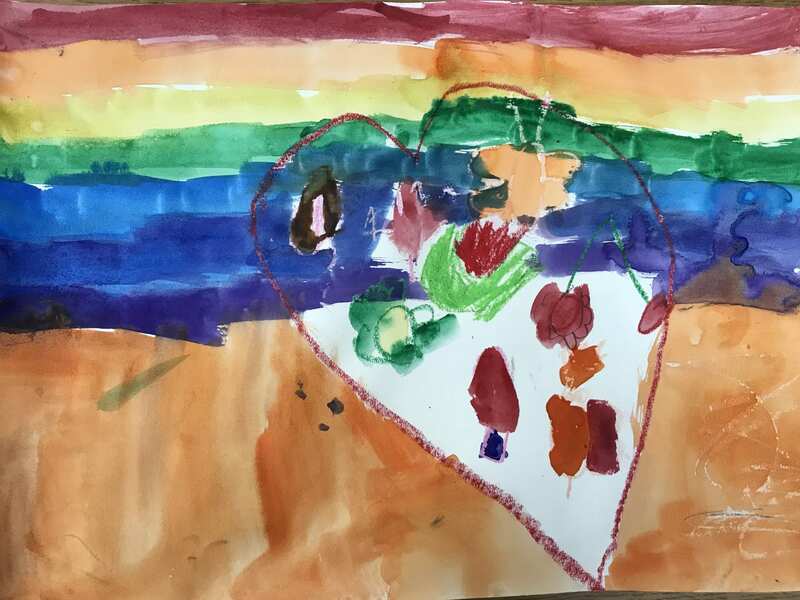 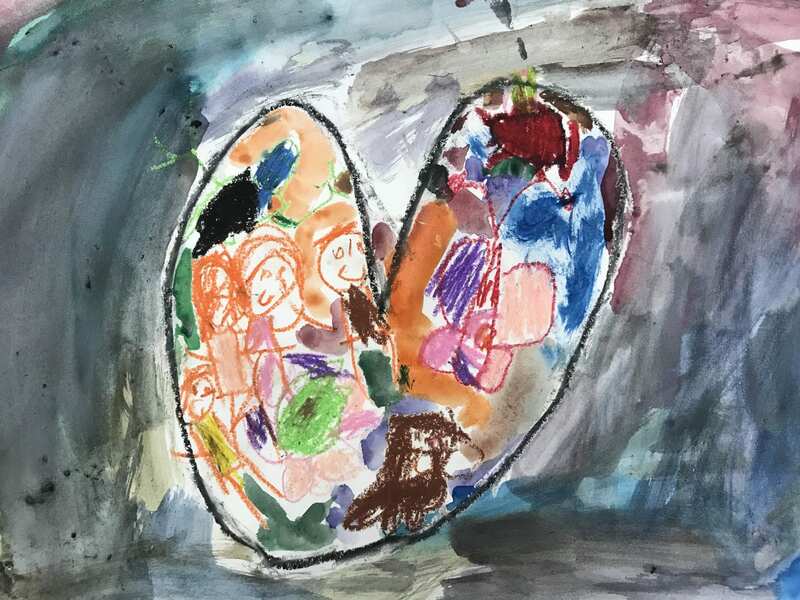 Young 5 and Kindergarten artists painted their heart drawings that they made back in January before all of our snow days! 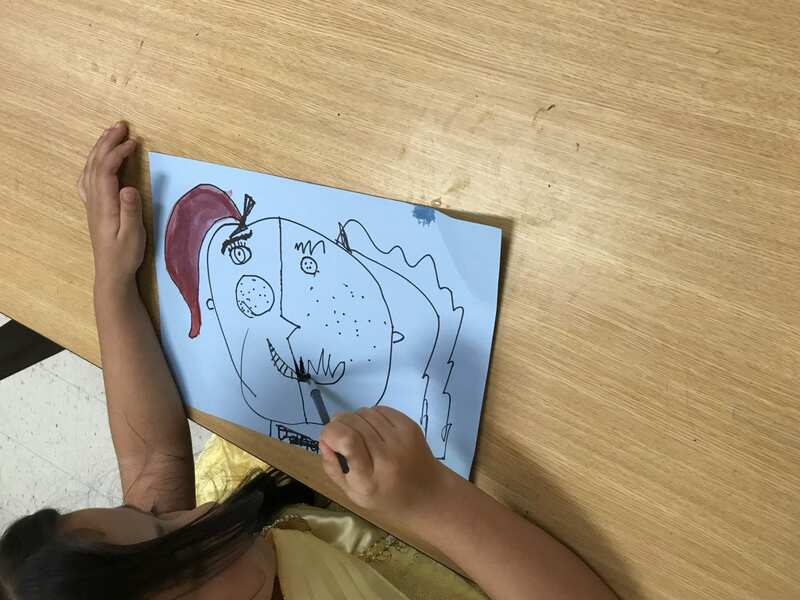 Then they started to create a self-portrait artwork! 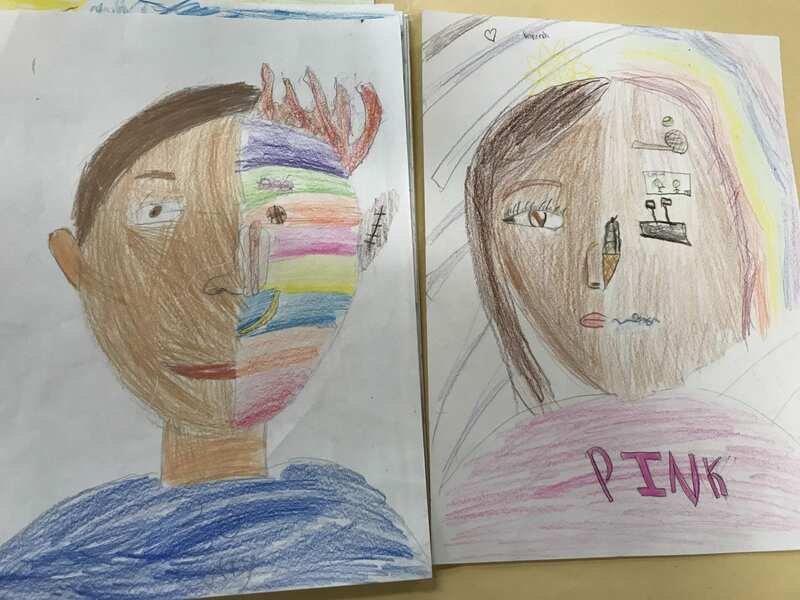 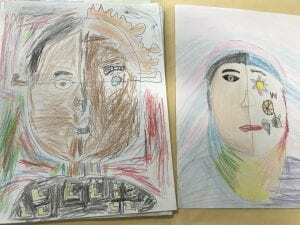 They mixed a skin color that they thought best matched their own skin and then have started to draw the parts of their face. 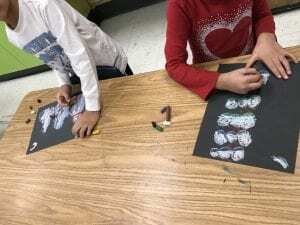 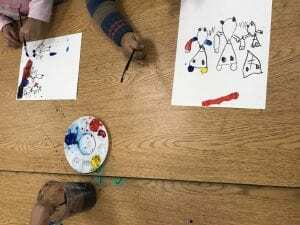 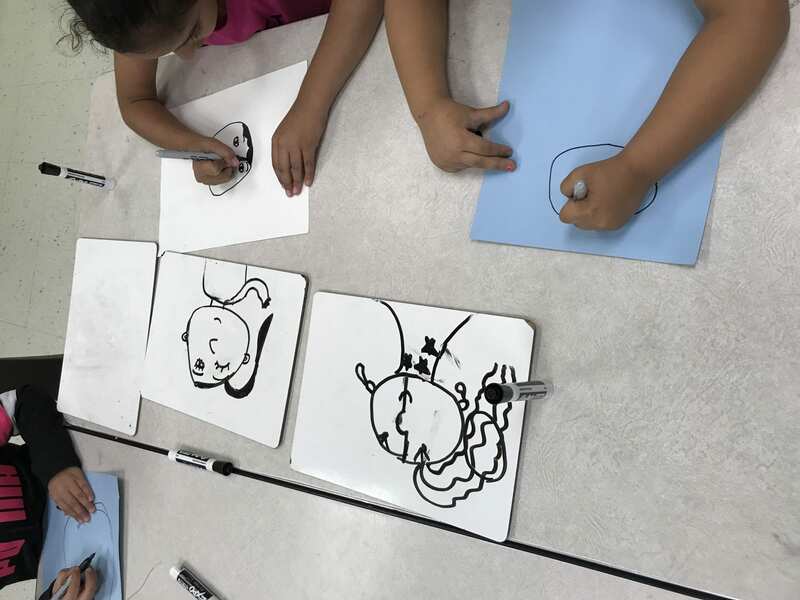 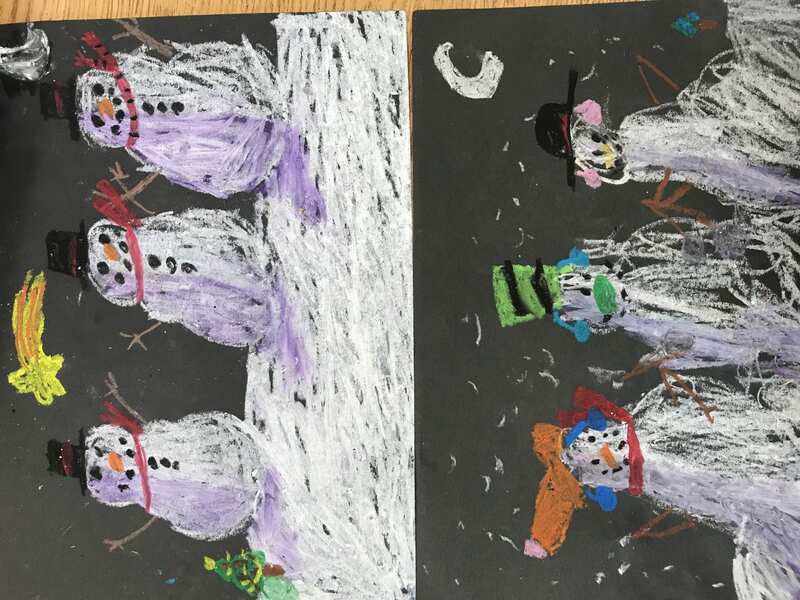 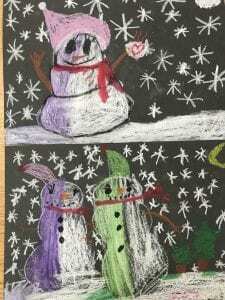 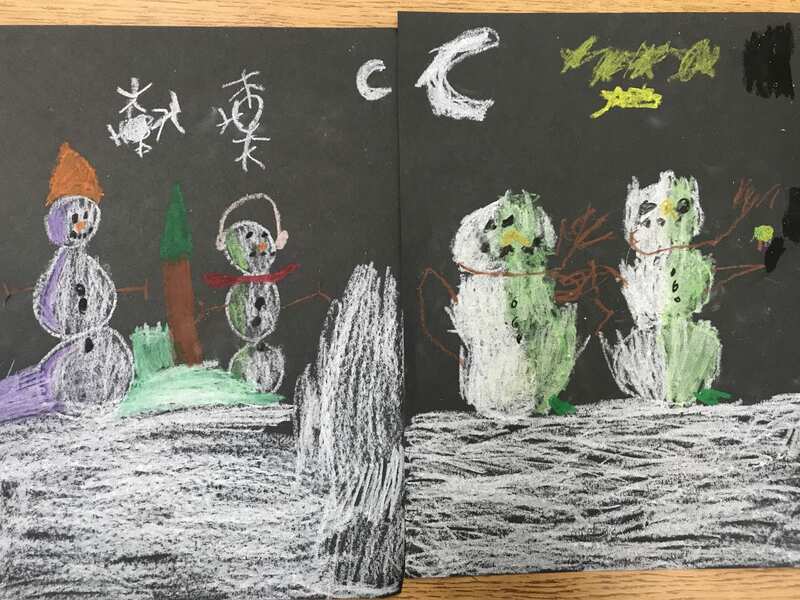 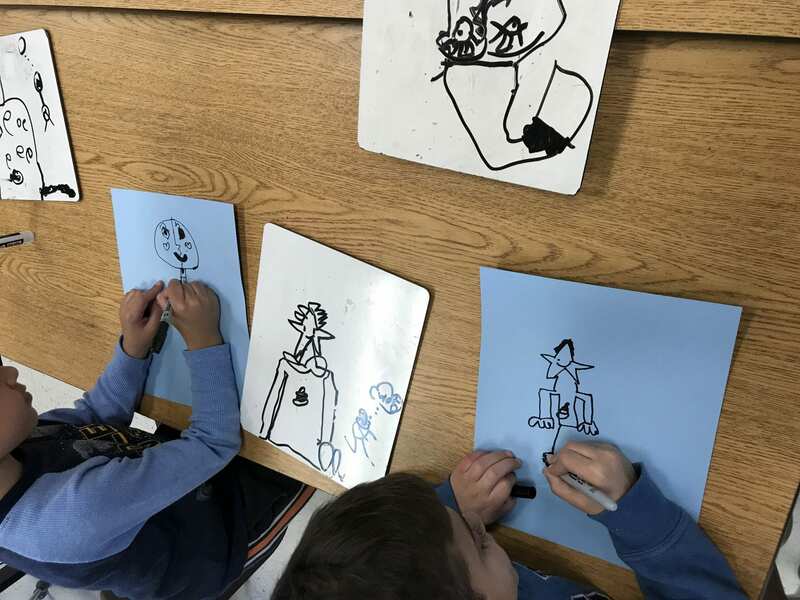 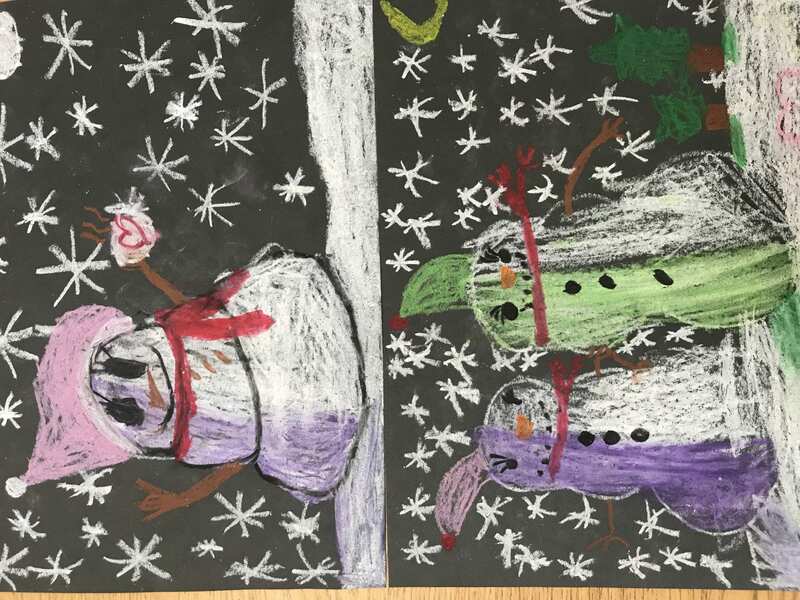 First grade artists finished their Snow People At Night drawings that have shadows to make their snow-people look more 3D. 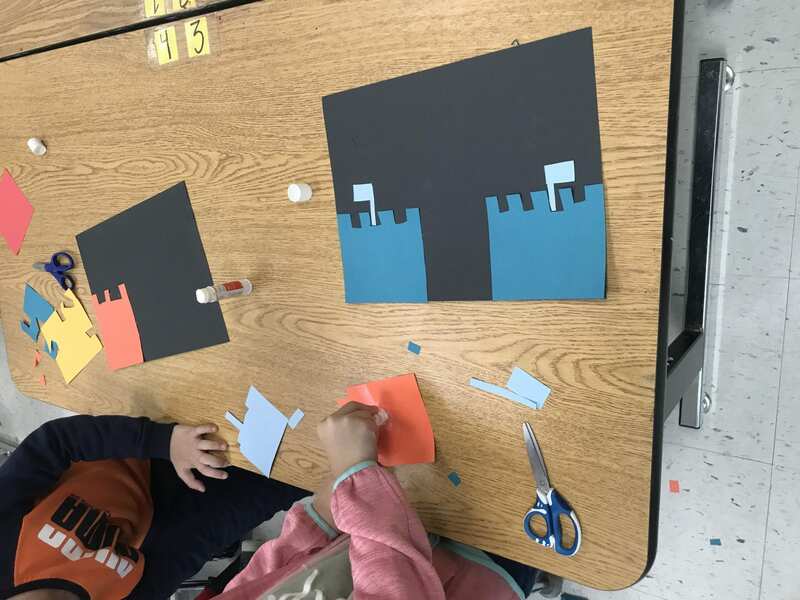 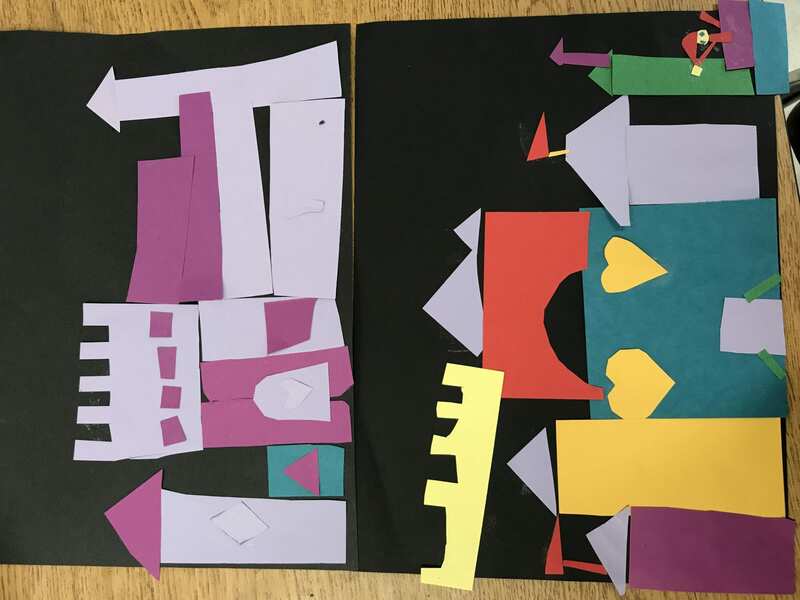 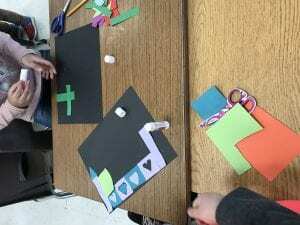 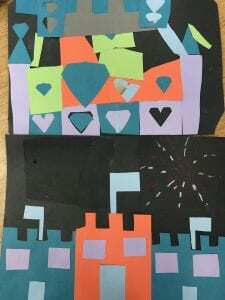 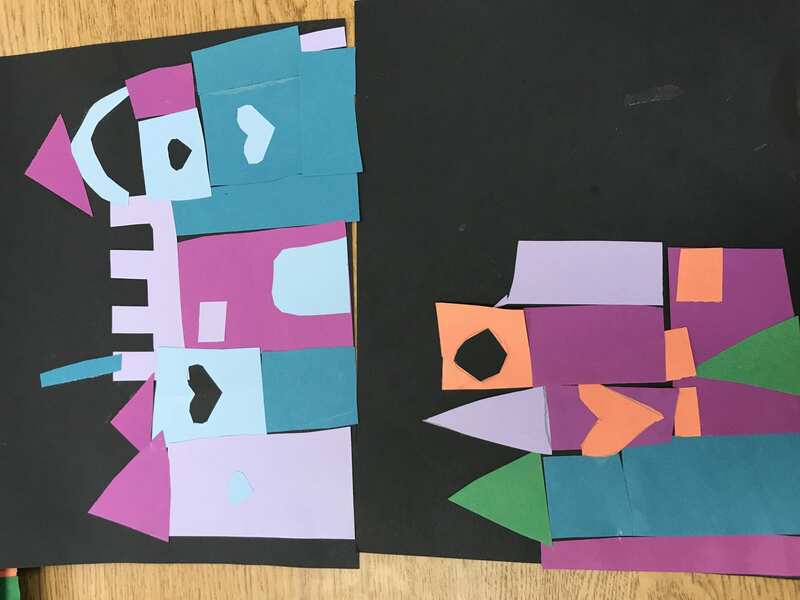 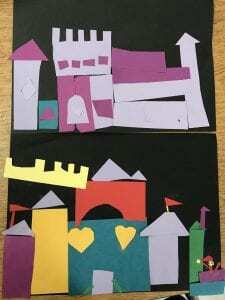 Then they learned about GEOMETRIC shapes, cut them out of paper, and created a castle collage out of them. 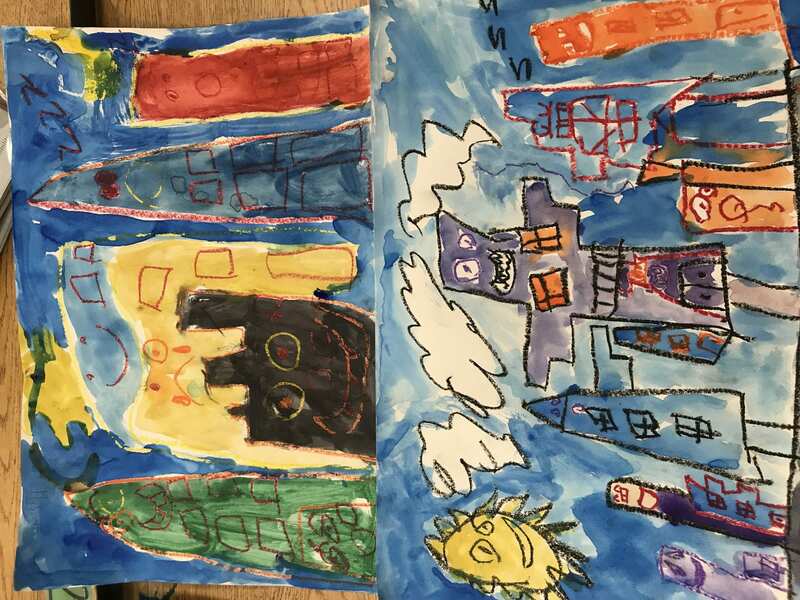 Third grade artists finished painting their James Rizzi inspired cityscapes! 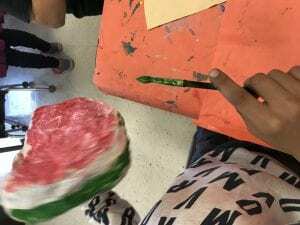 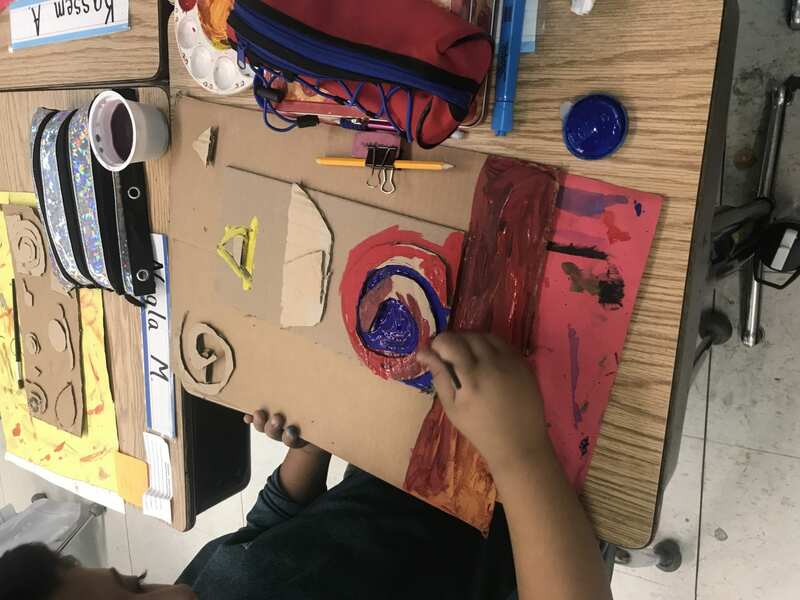 Fifth grade artists finished their value projects by gluing their objects to their painted background and adding cast shadows on the table. 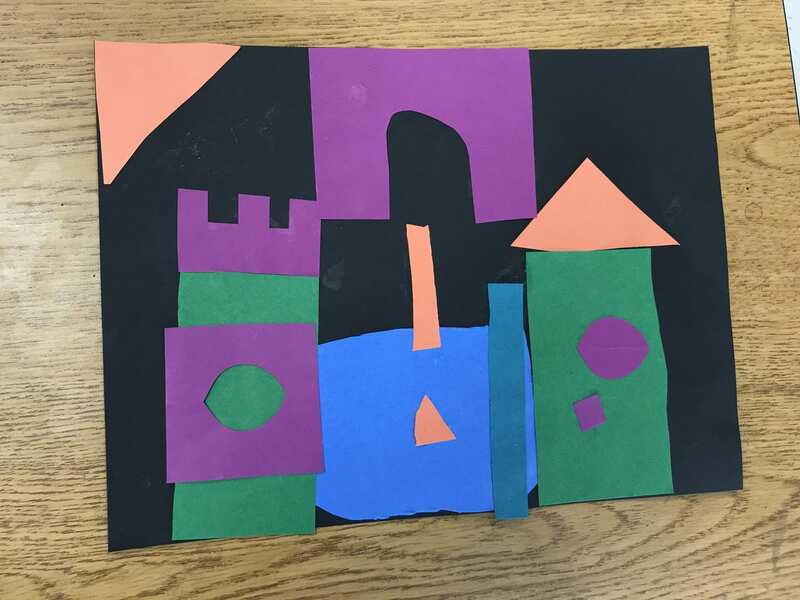 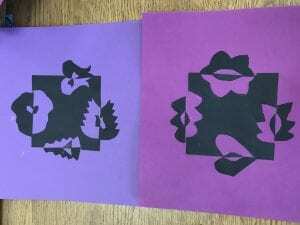 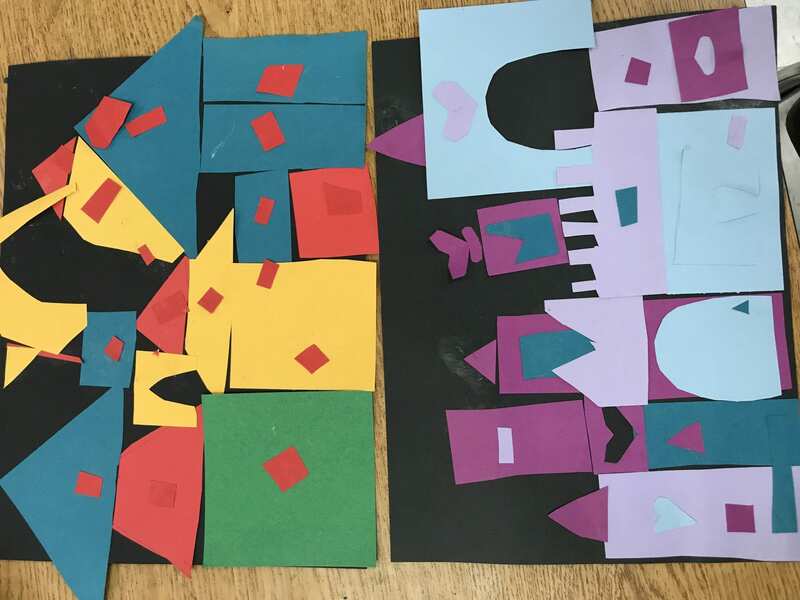 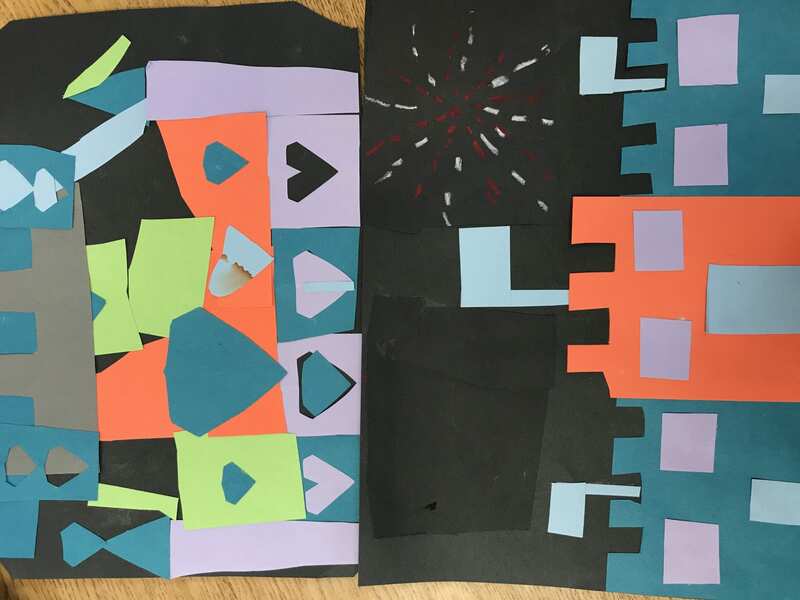 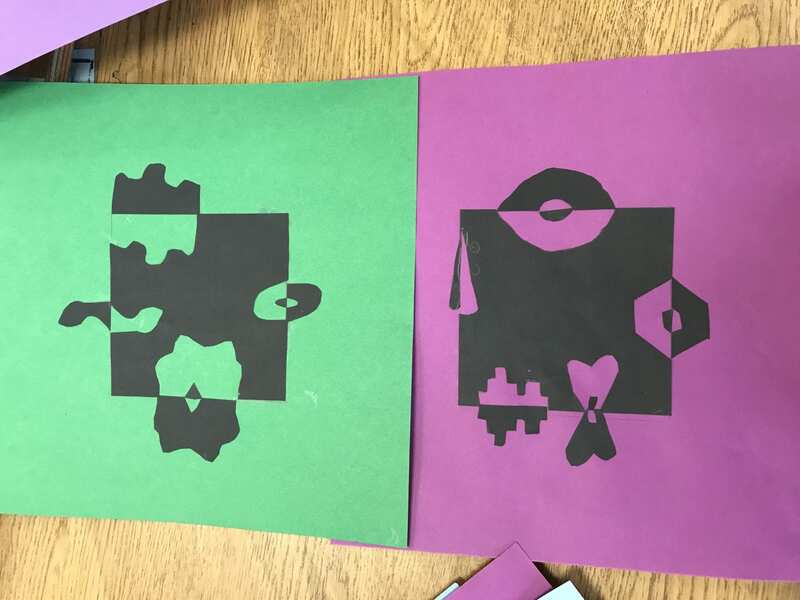 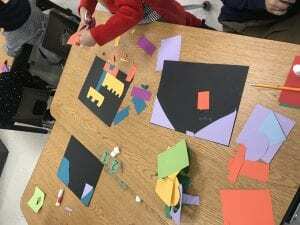 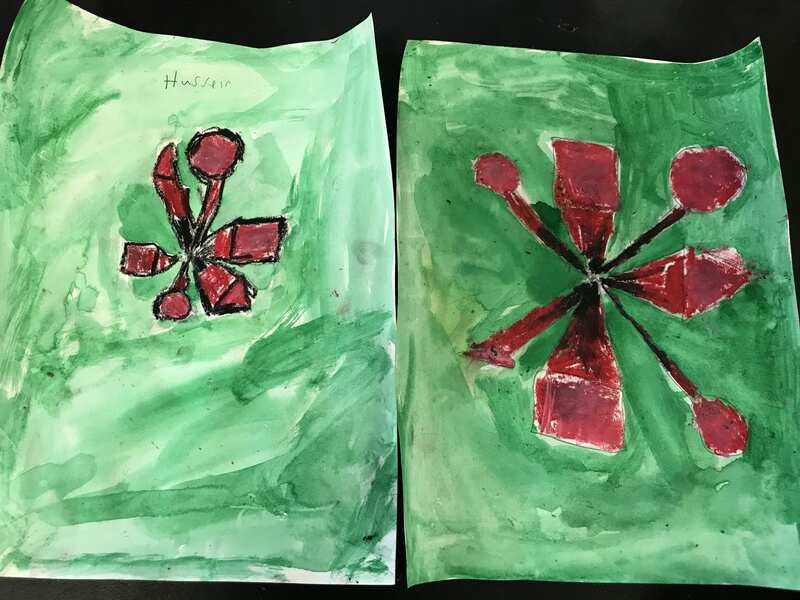 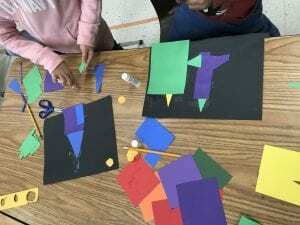 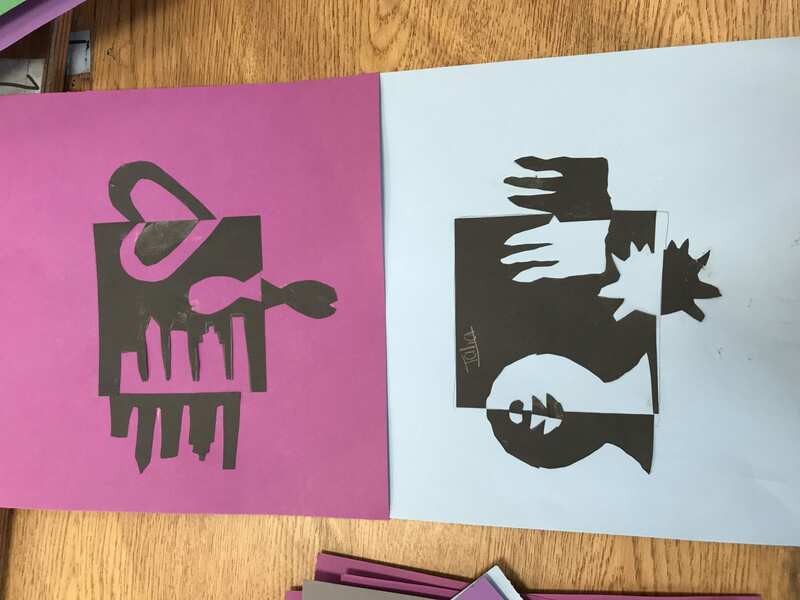 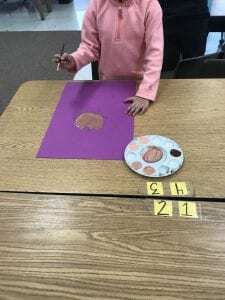 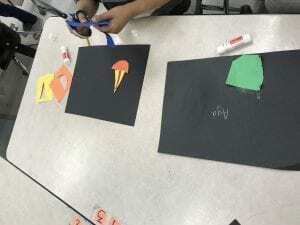 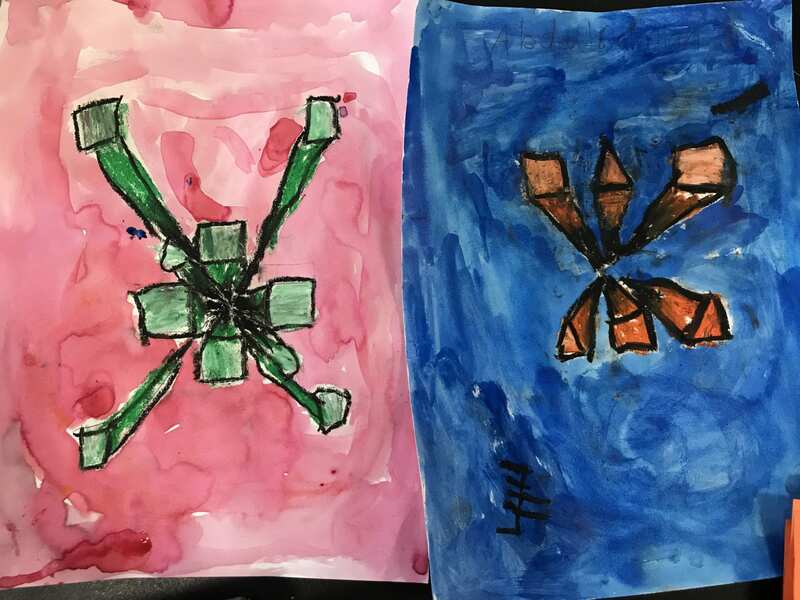 Kindergarten and Young 5 artists at Lowrey started off the new year by creating art that focused on SHAPES! 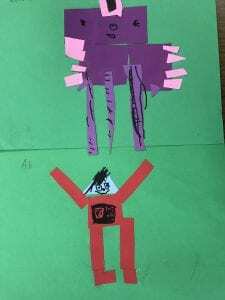 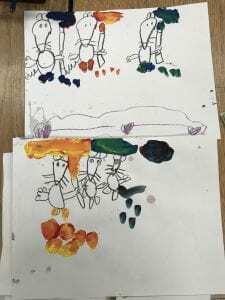 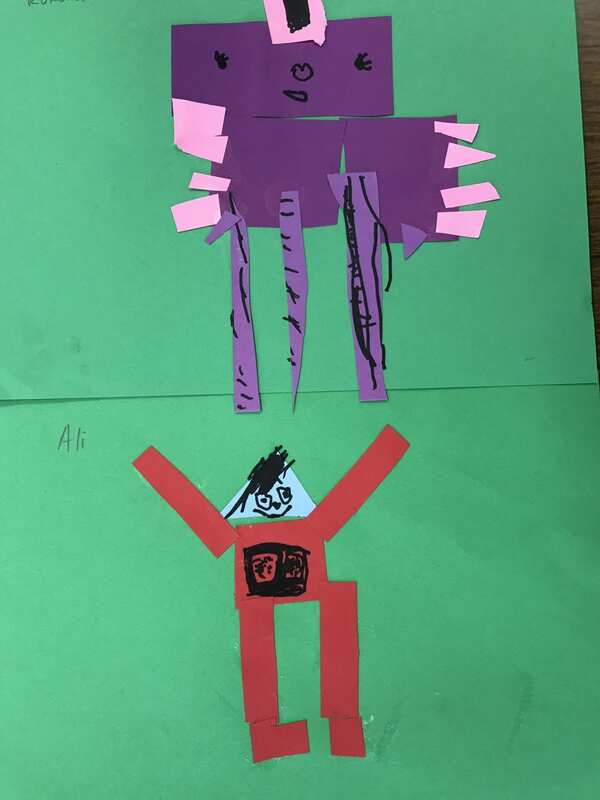 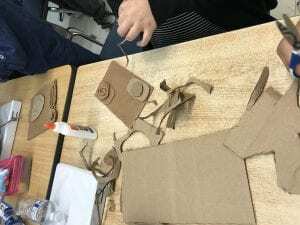 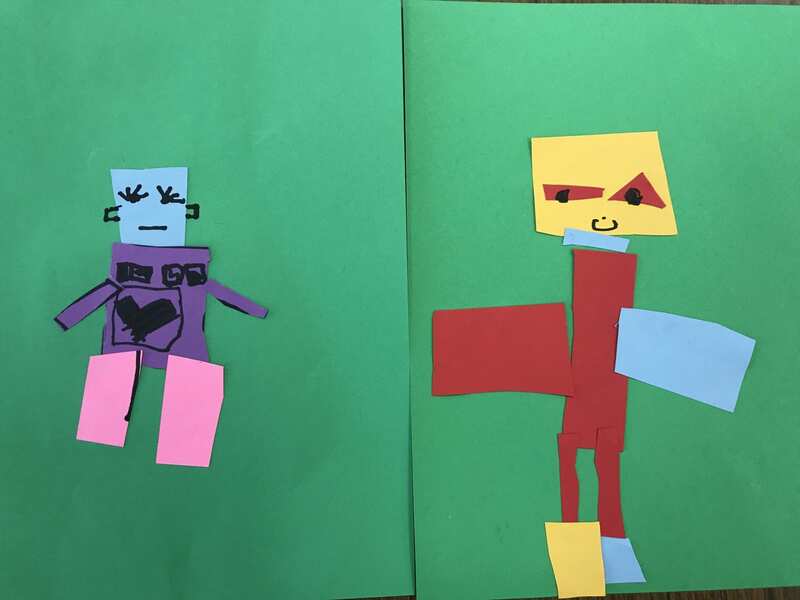 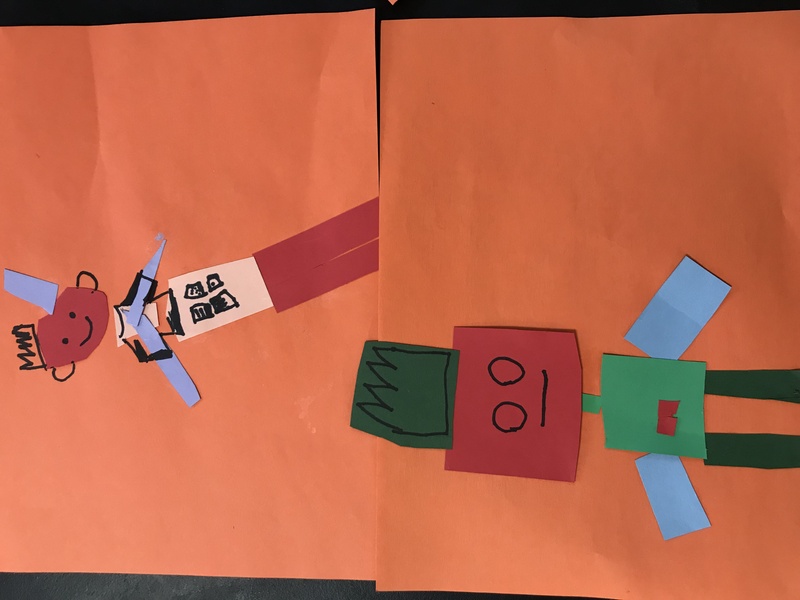 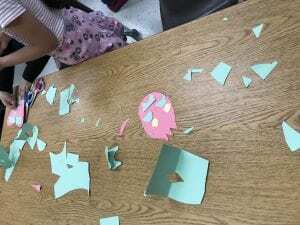 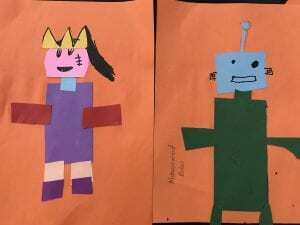 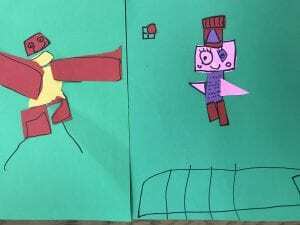 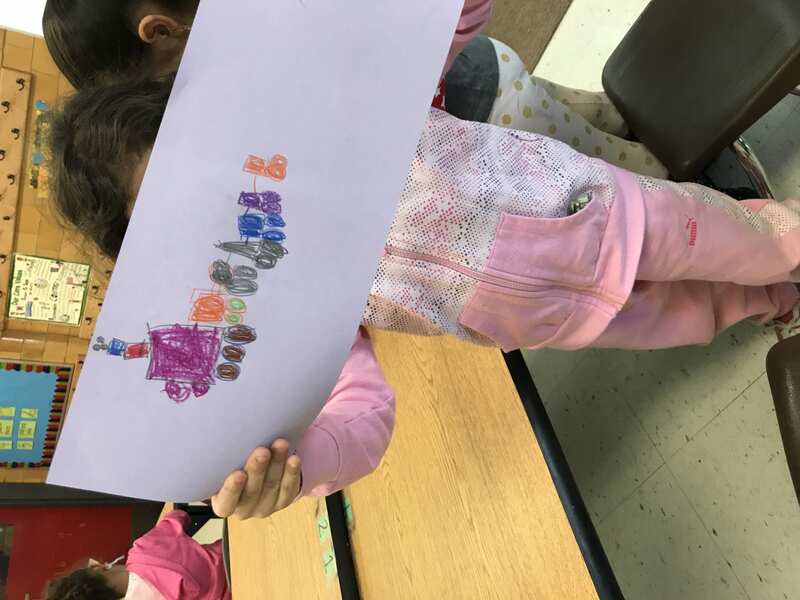 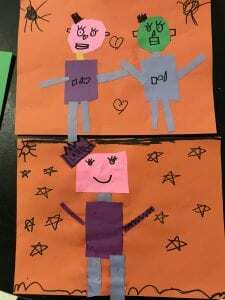 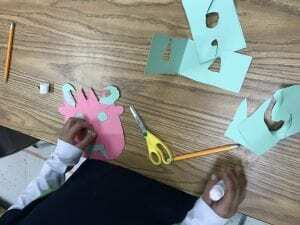 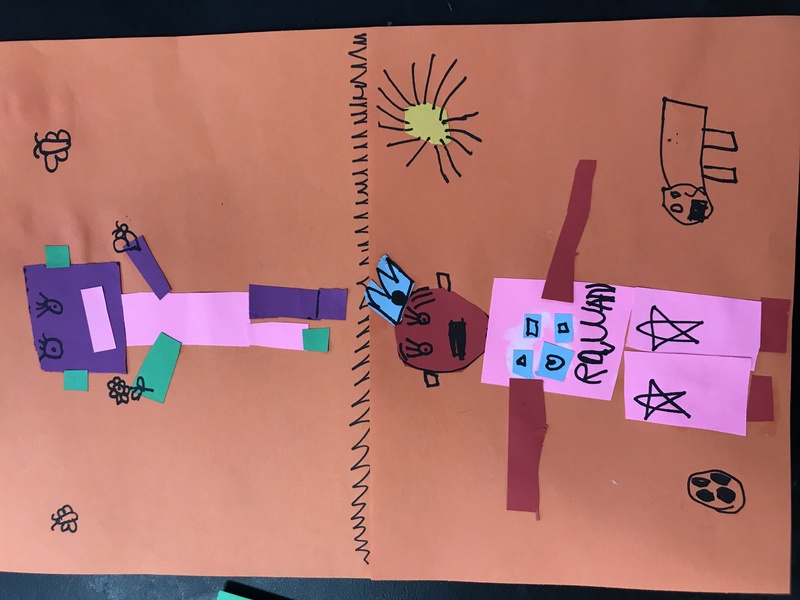 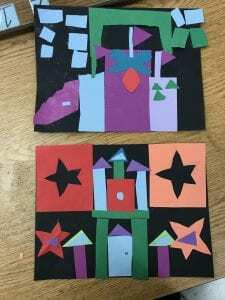 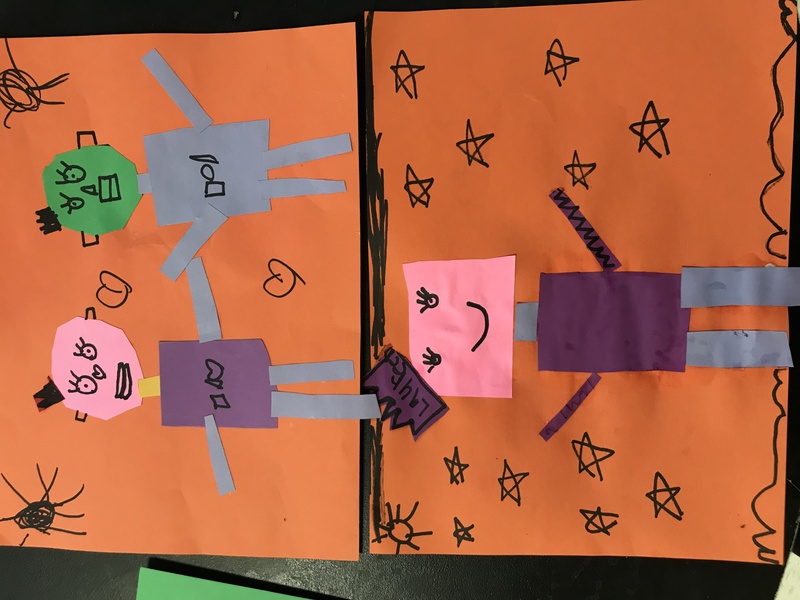 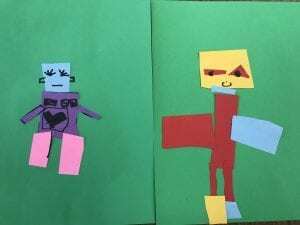 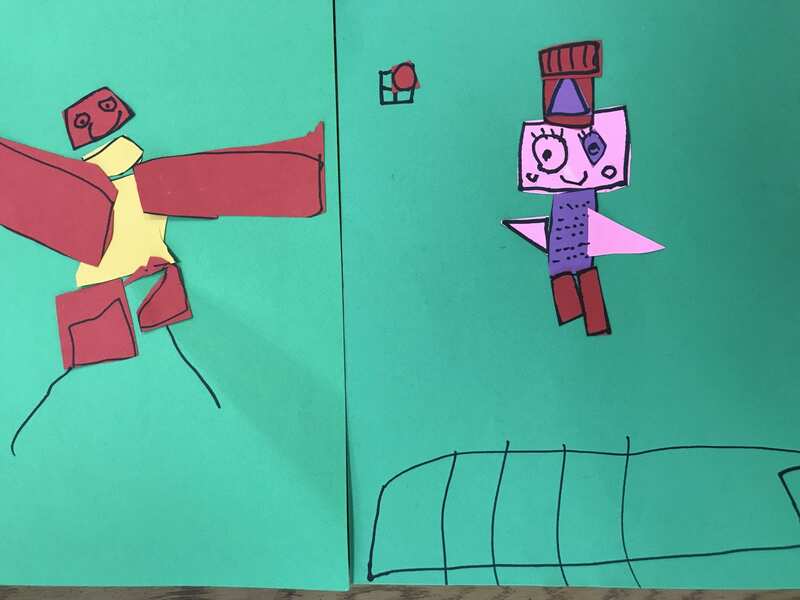 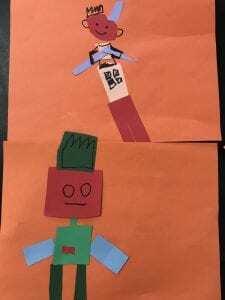 They created a robot shape collage one class. Then they read the book “The Shape of My Heart” and noticed how things around us are all made out of shapes! 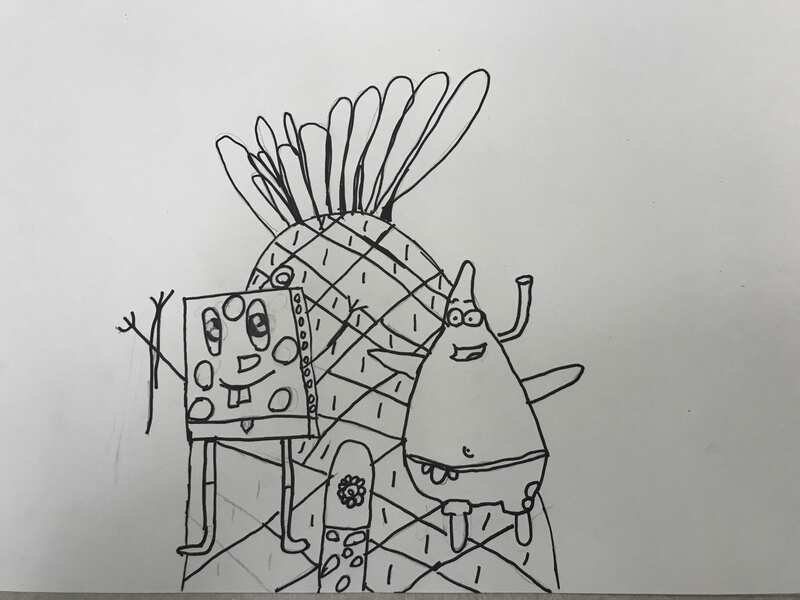 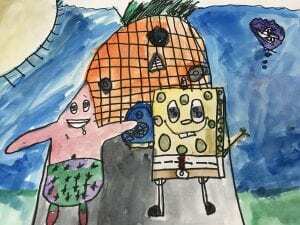 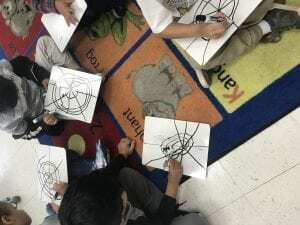 They drew a heart and filled it with drawings of things they love, using shapes. 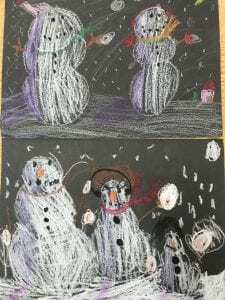 Because we had THREE Wednesday snow days we had to wait until February to finish these drawings. 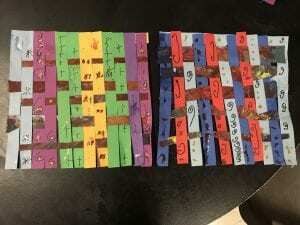 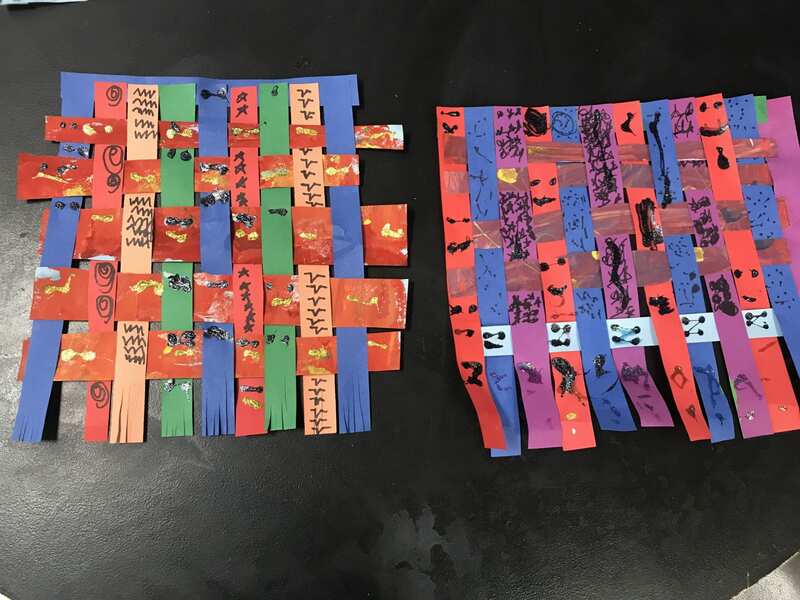 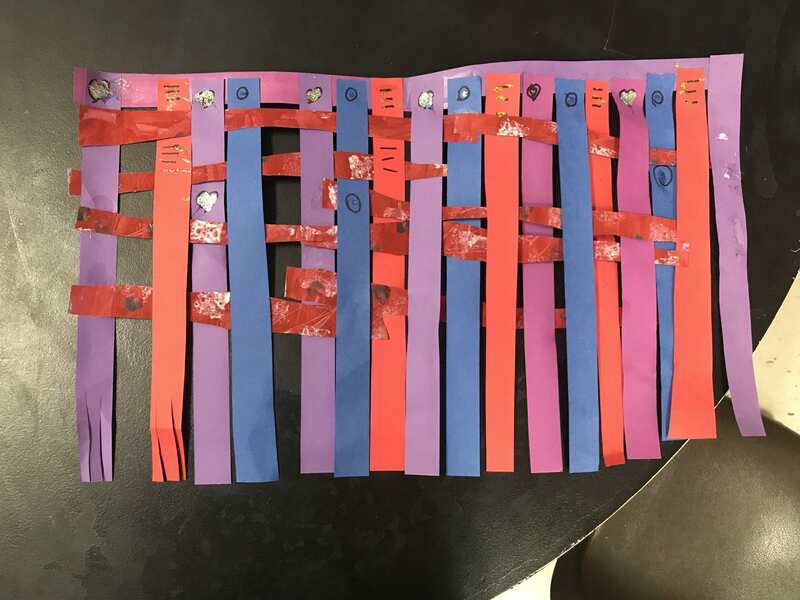 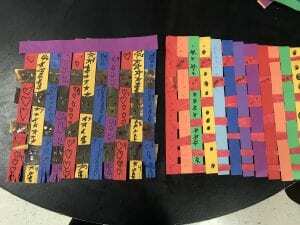 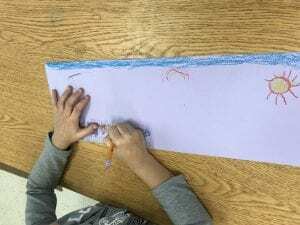 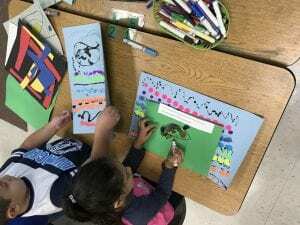 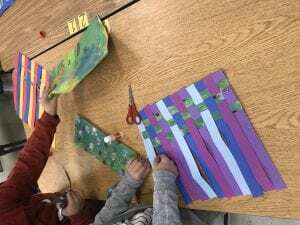 First grade artists finished their paper weavings! 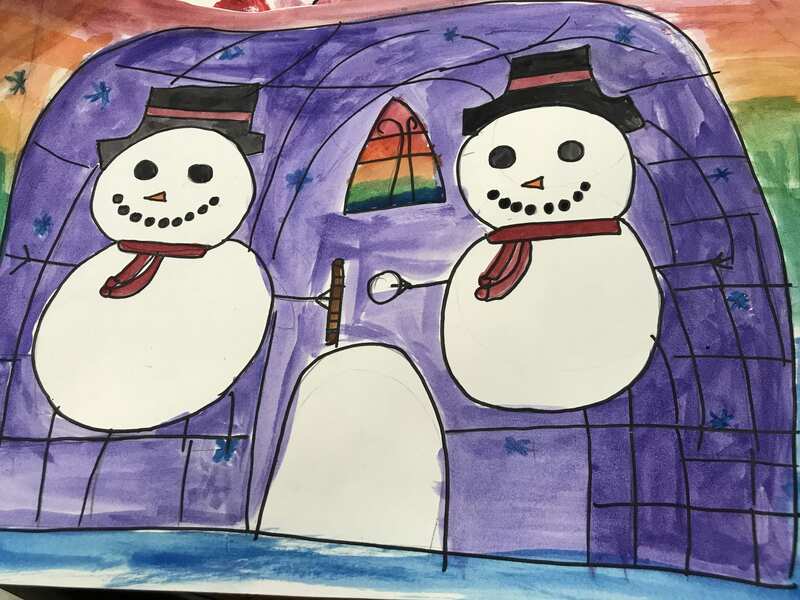 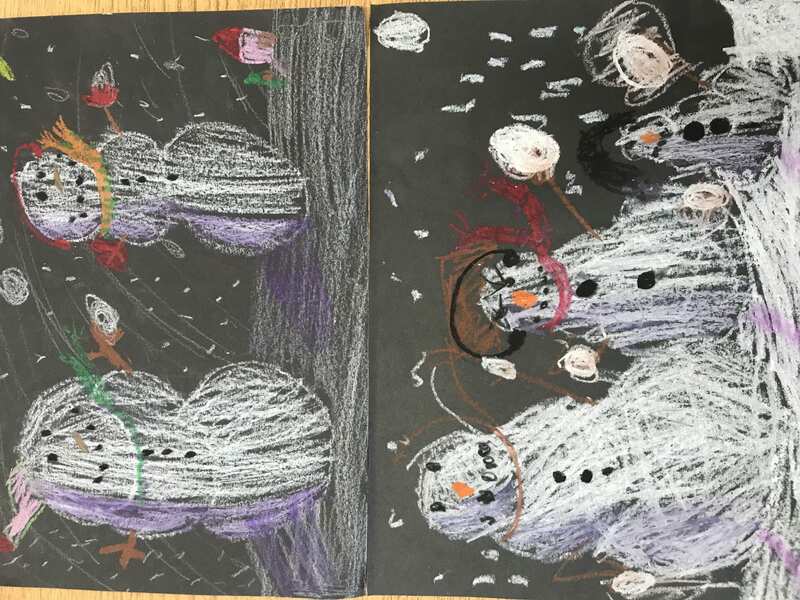 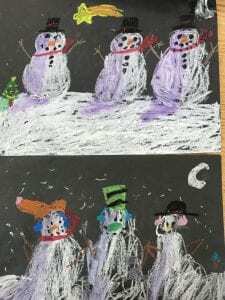 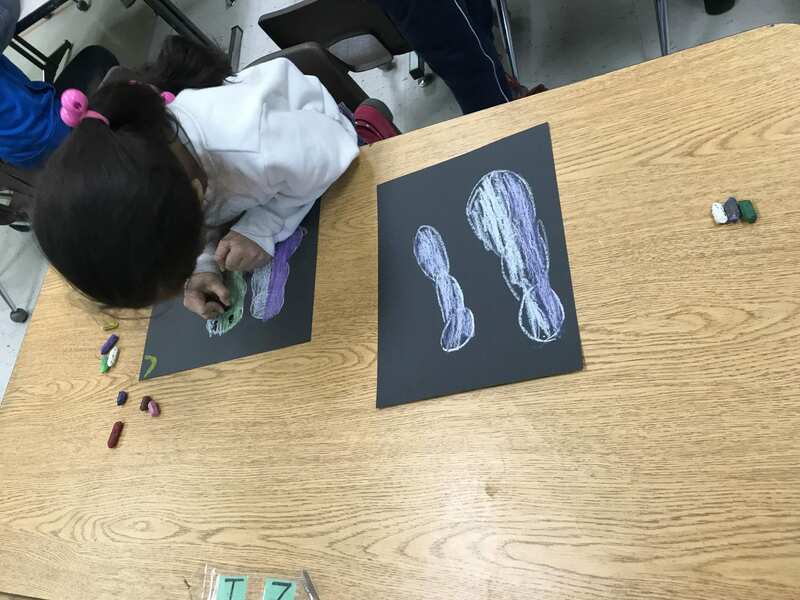 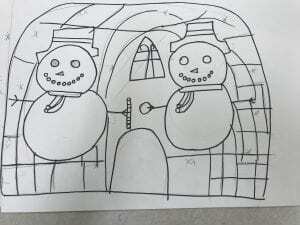 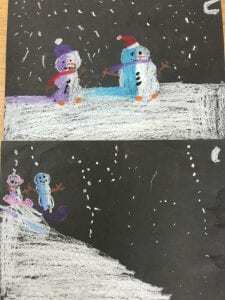 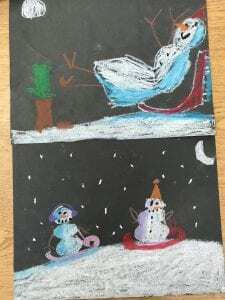 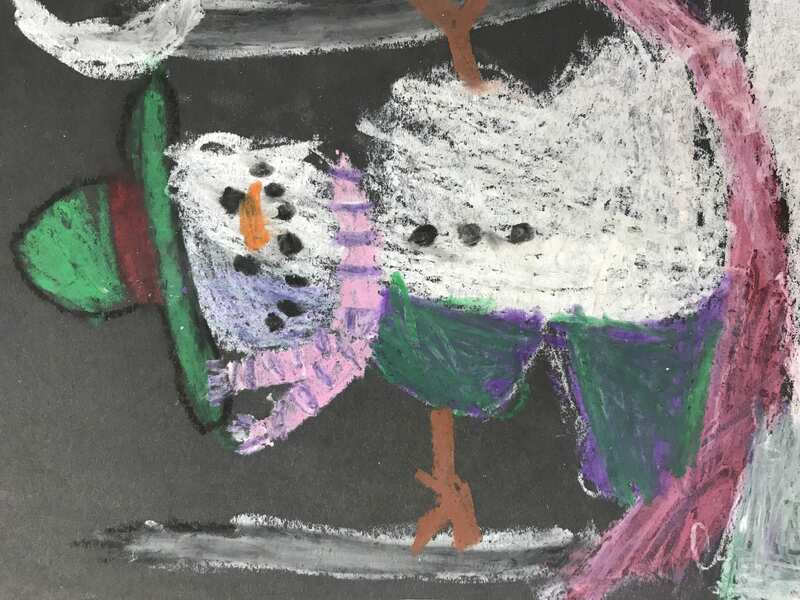 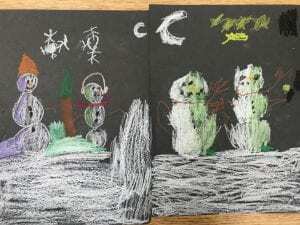 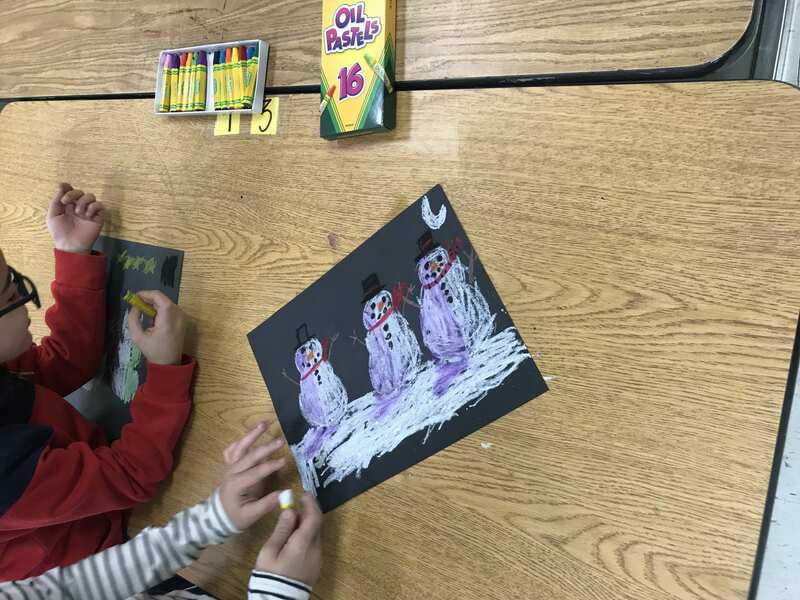 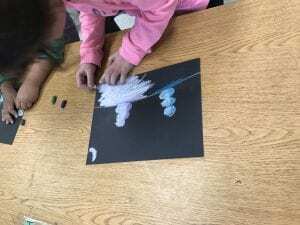 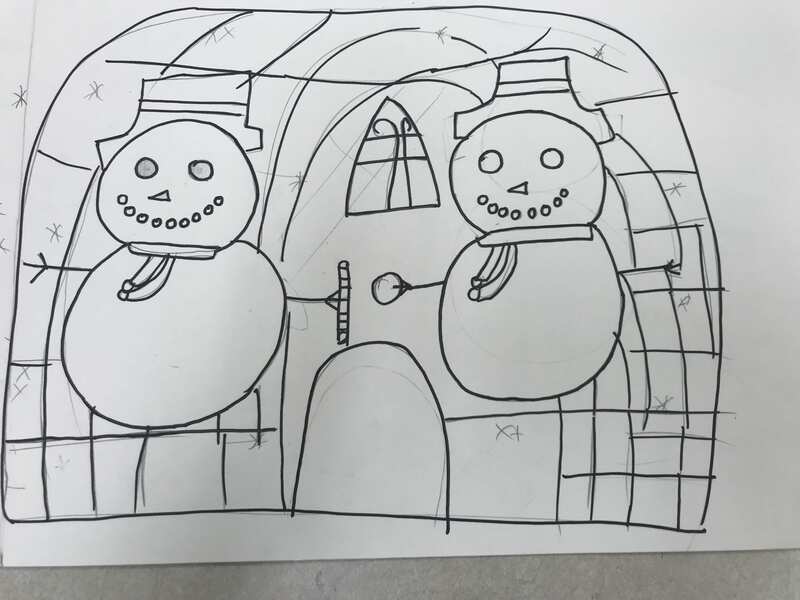 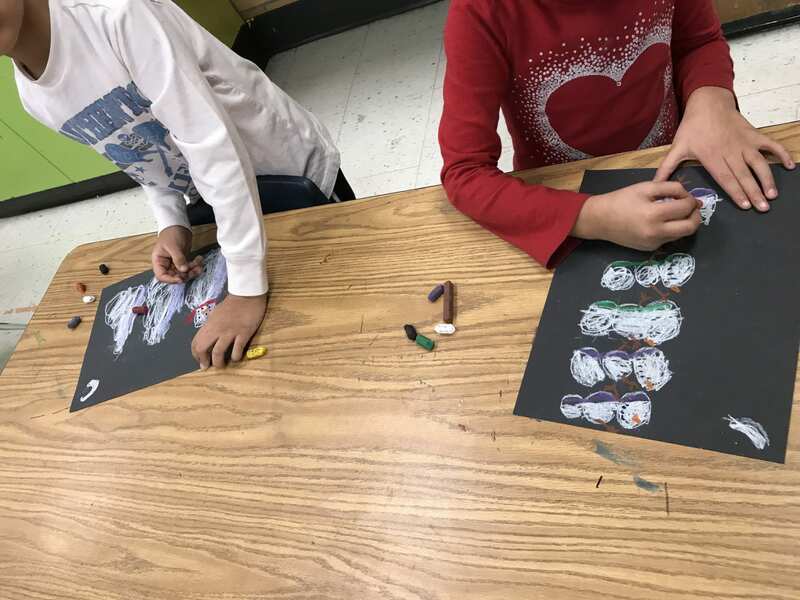 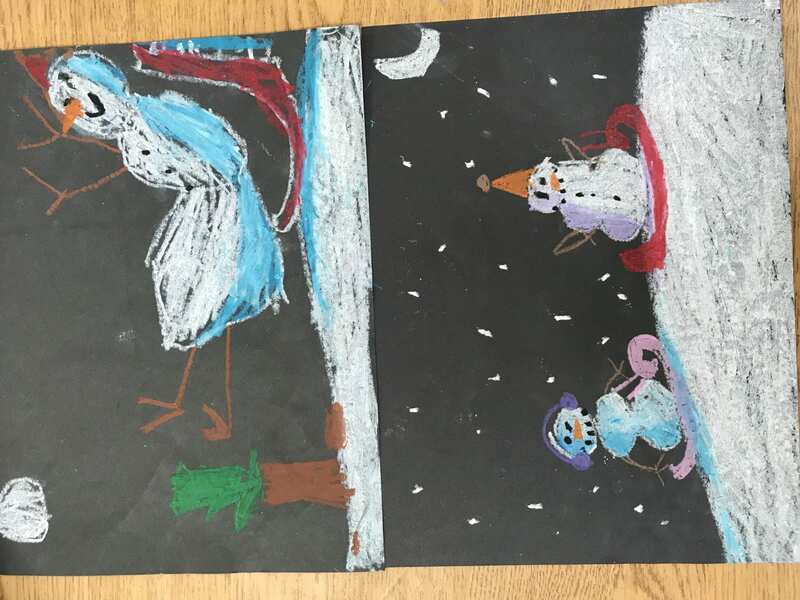 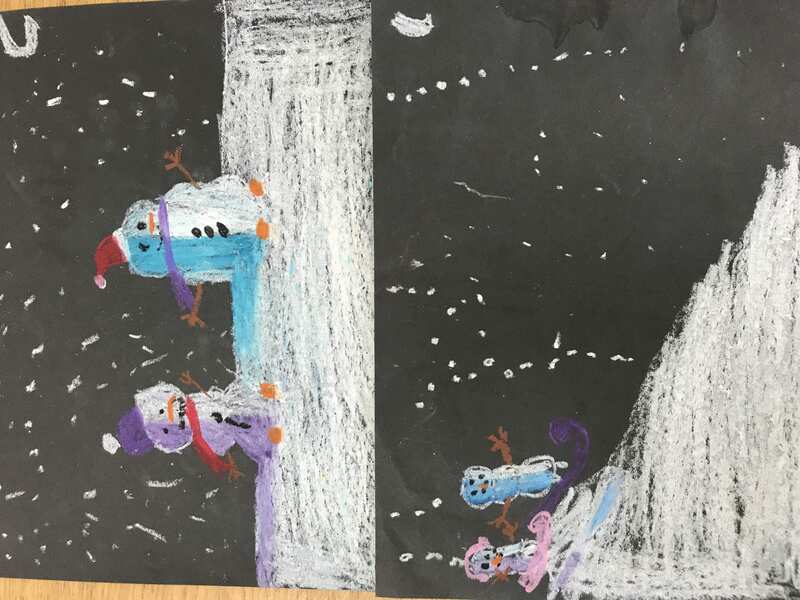 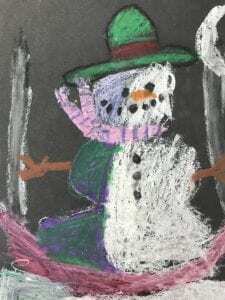 Then they read the book “Snowmen at Night” and created a snowman or snow-woman drawing that showed a shadow on their snow person to make it look more 3D. 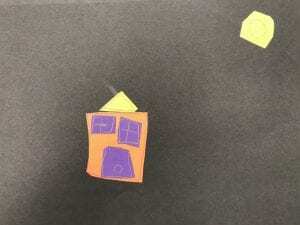 Third grade artists finished their one-point perspective shapes! 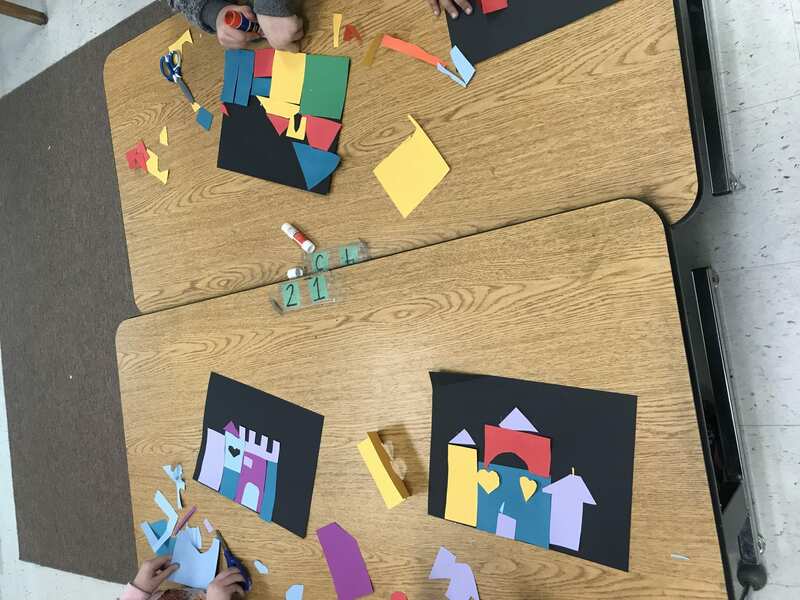 They painted their backgrounds with the opposite color that they had used to color their shapes with. 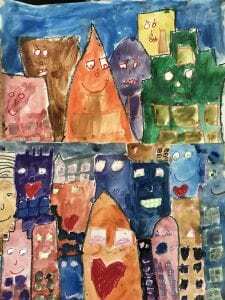 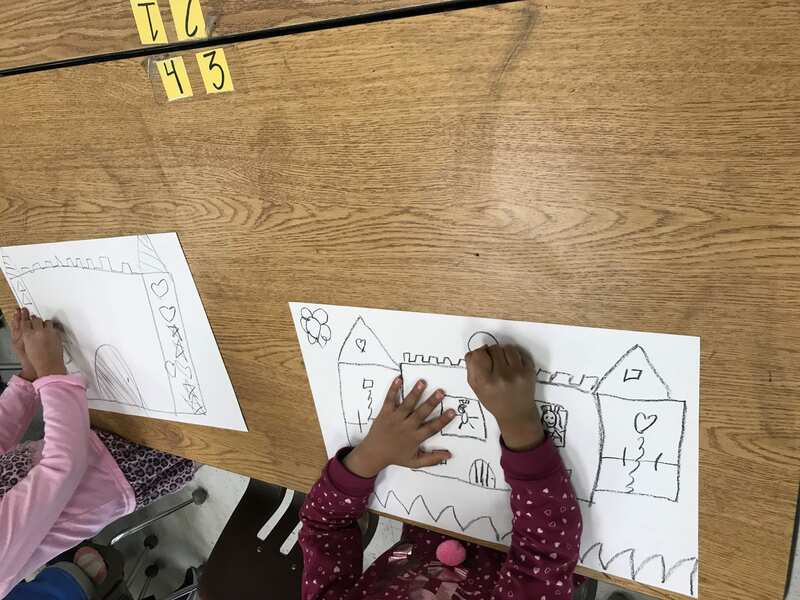 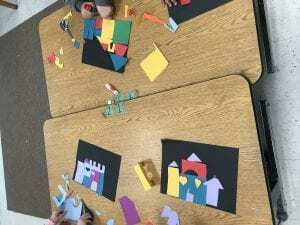 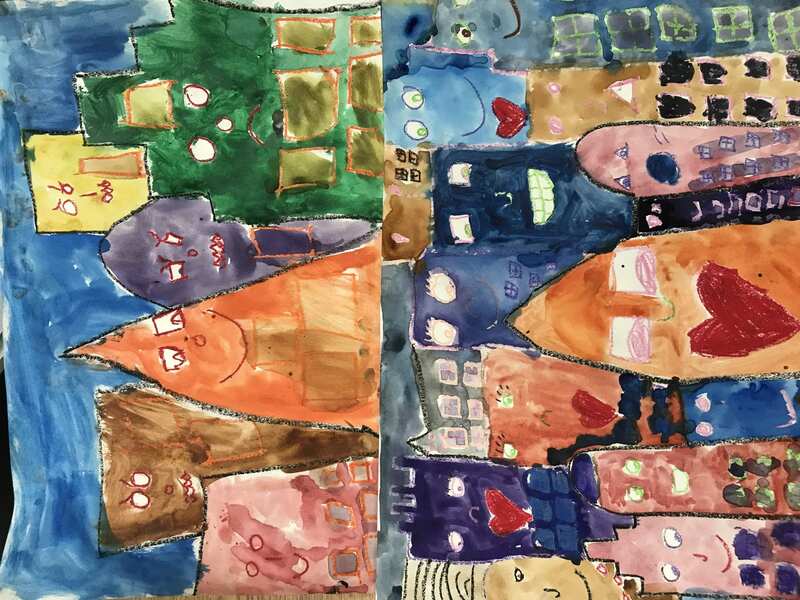 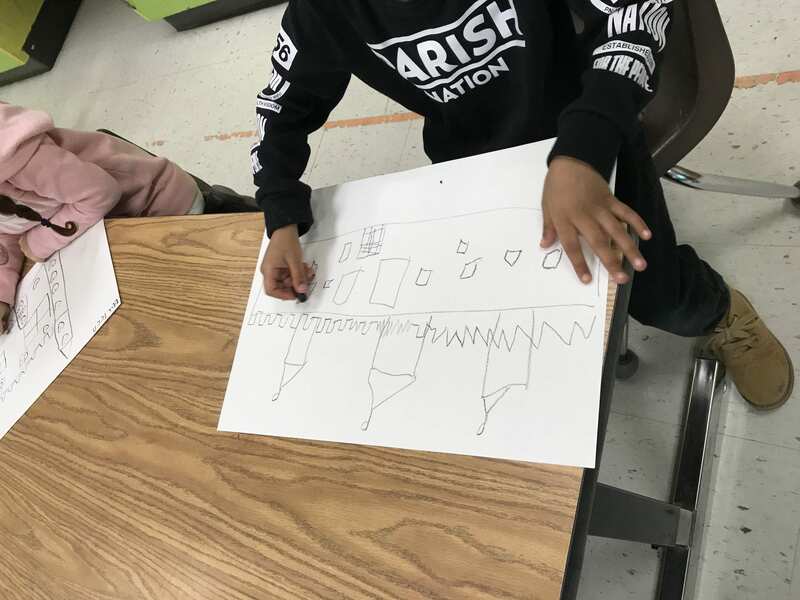 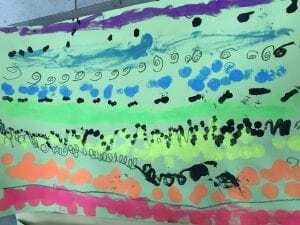 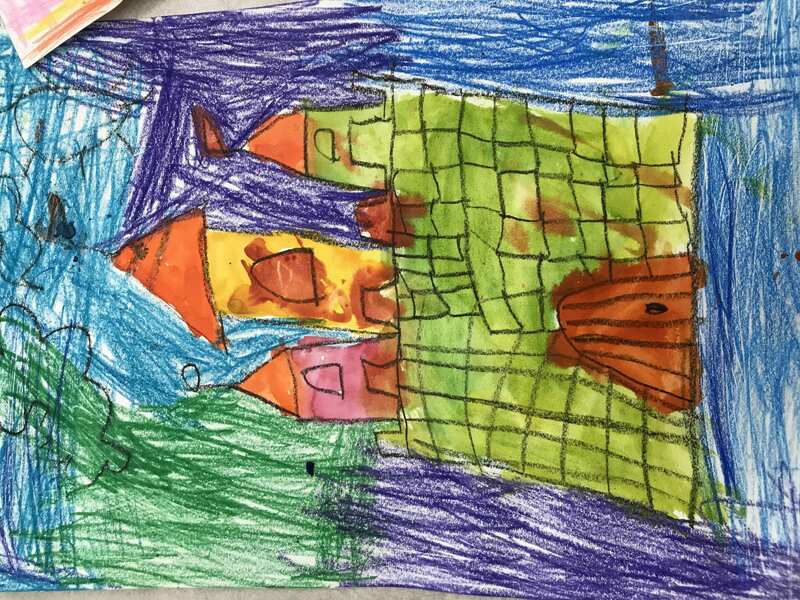 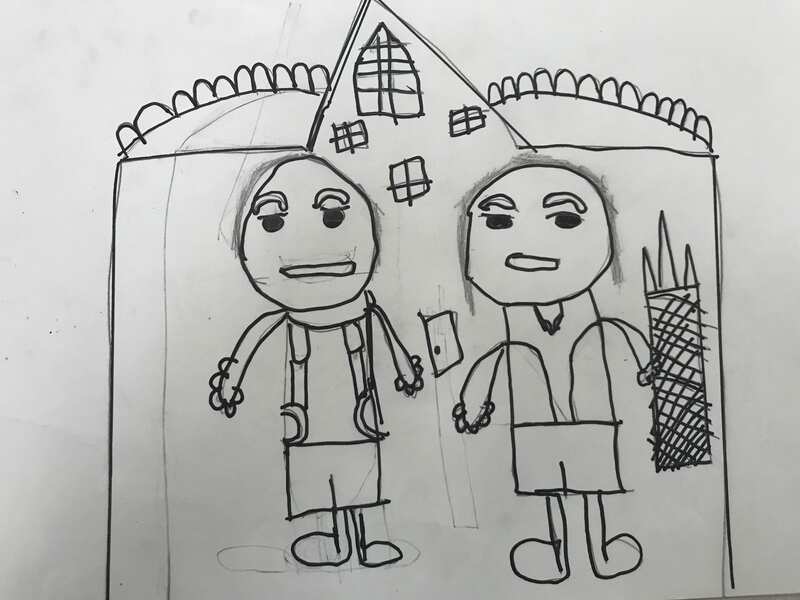 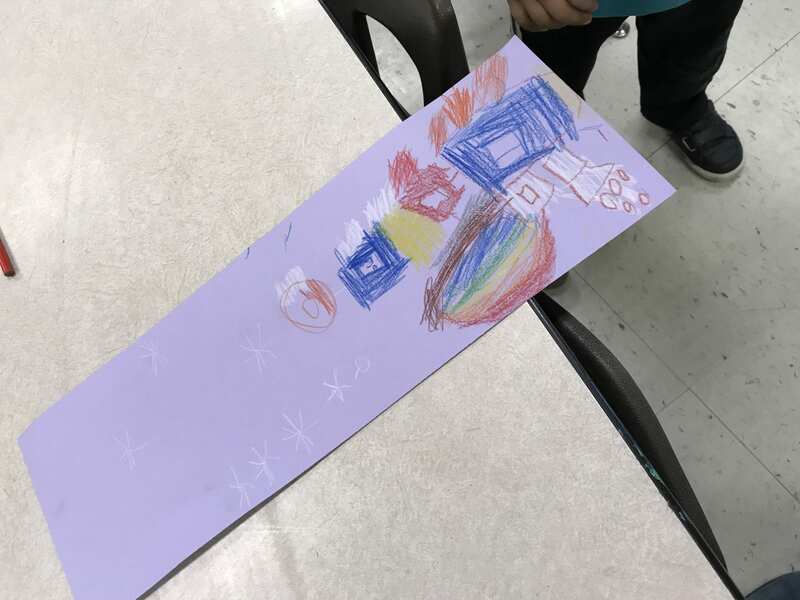 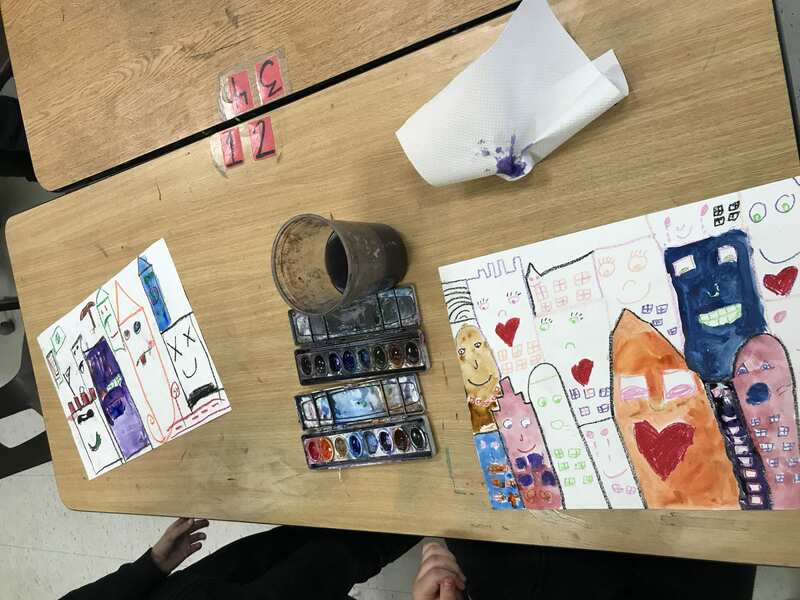 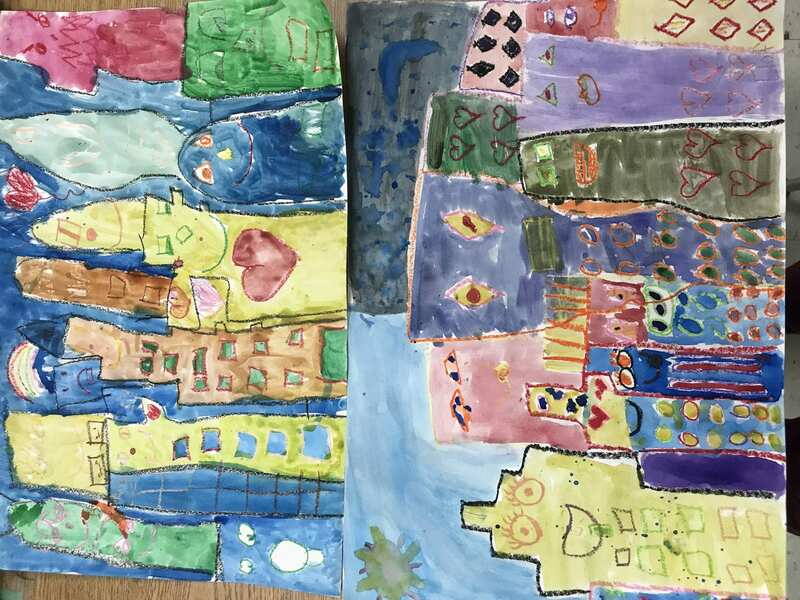 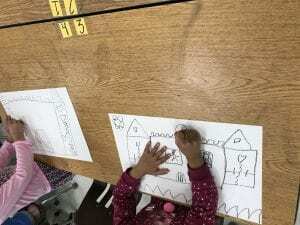 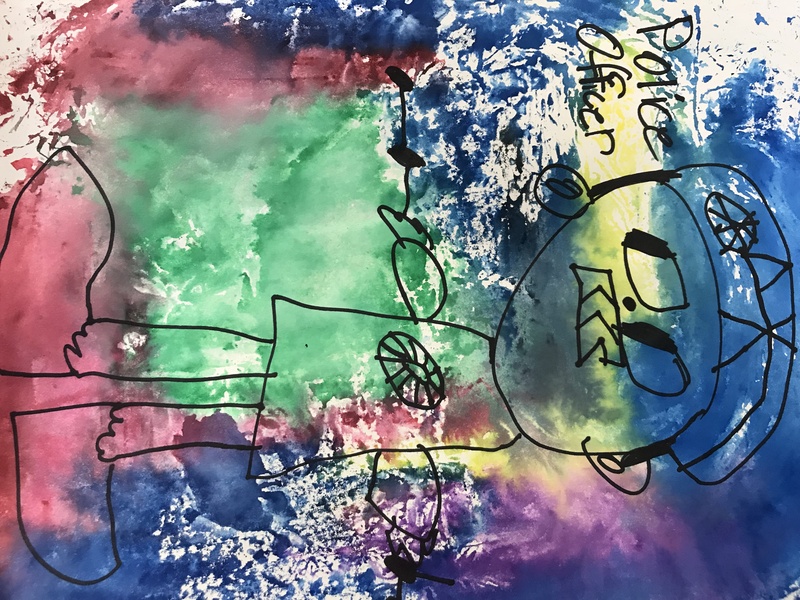 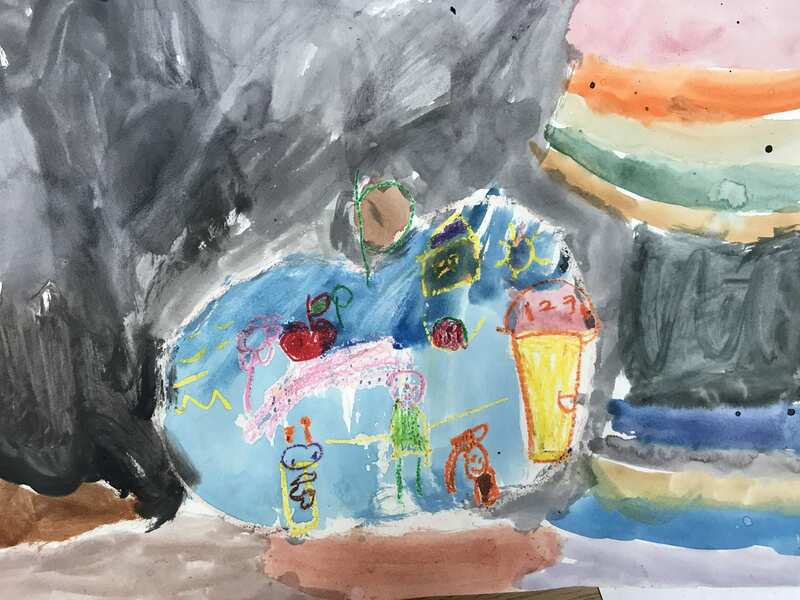 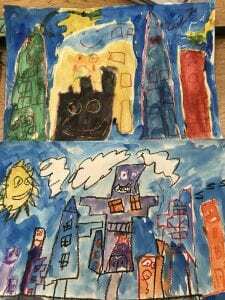 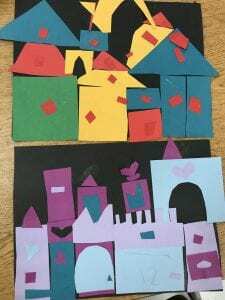 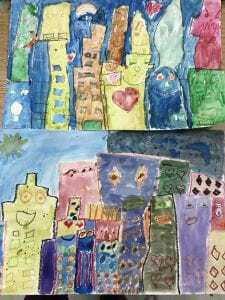 Then they looked at the artwork of James Rizzi and began drawing their own city-scape that showed emotion and buildings that were overlapping. 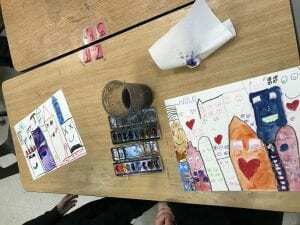 Fifth grade artists have been working on projects related to VALUE. 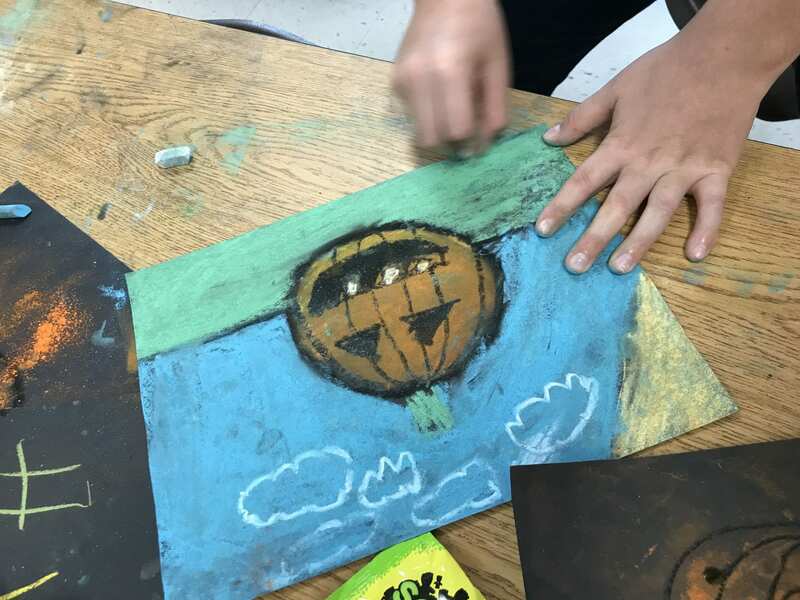 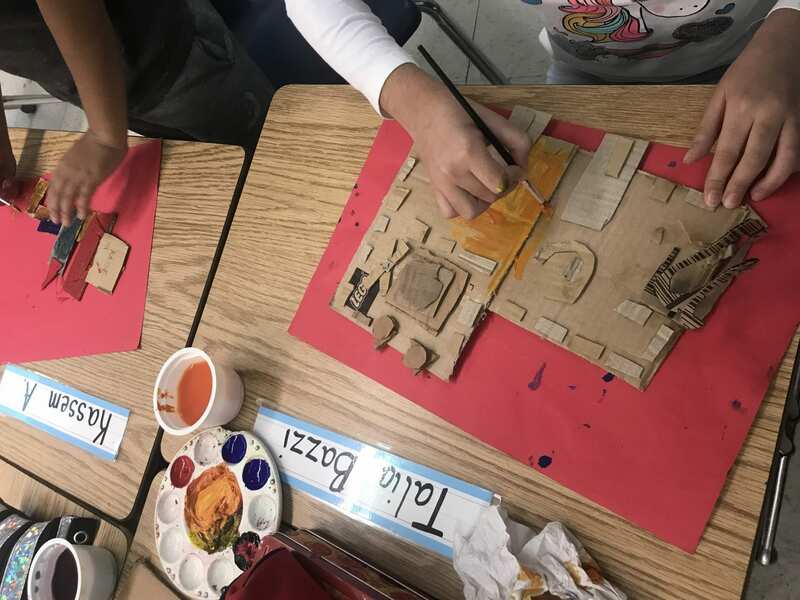 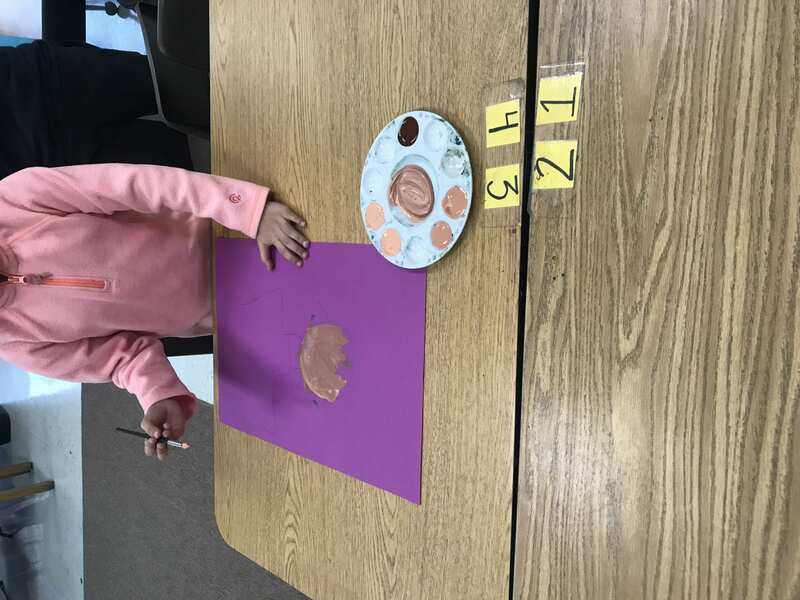 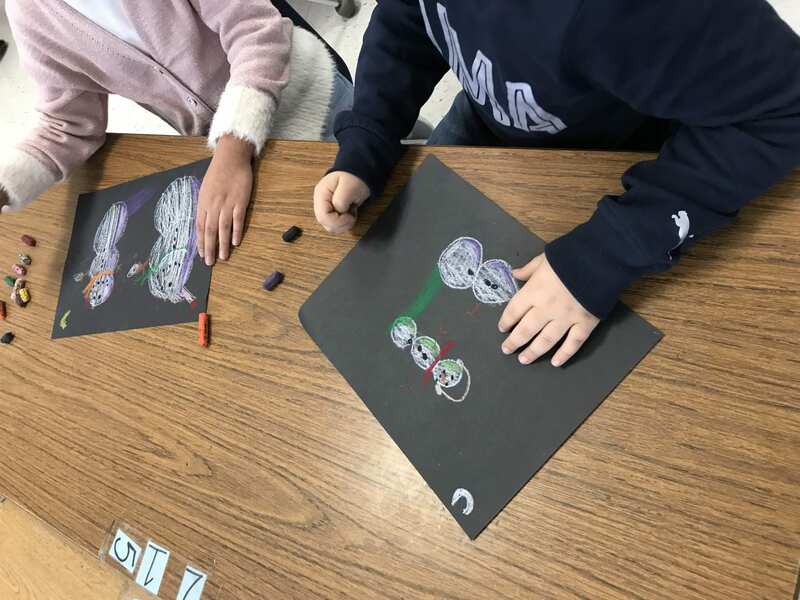 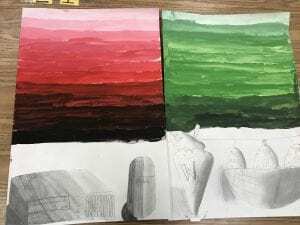 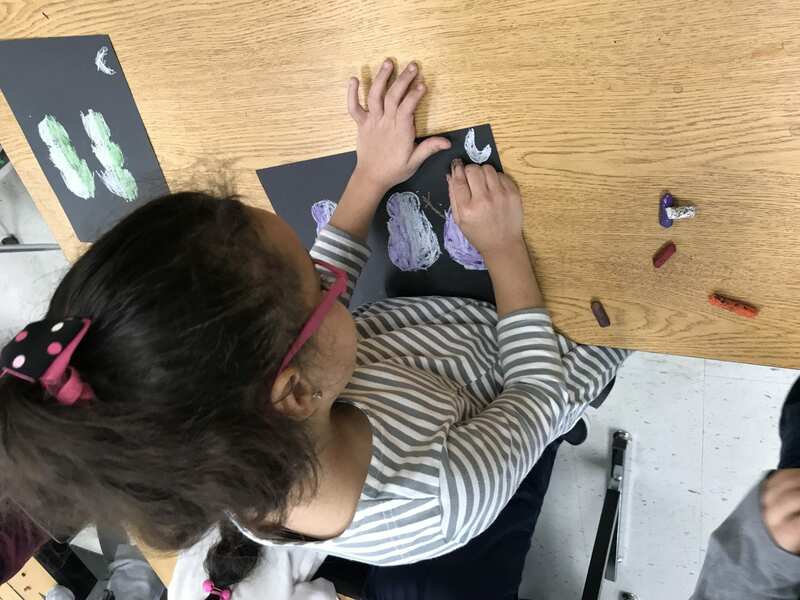 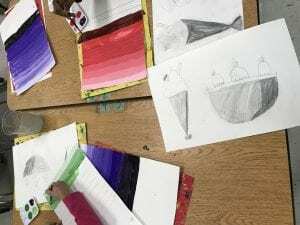 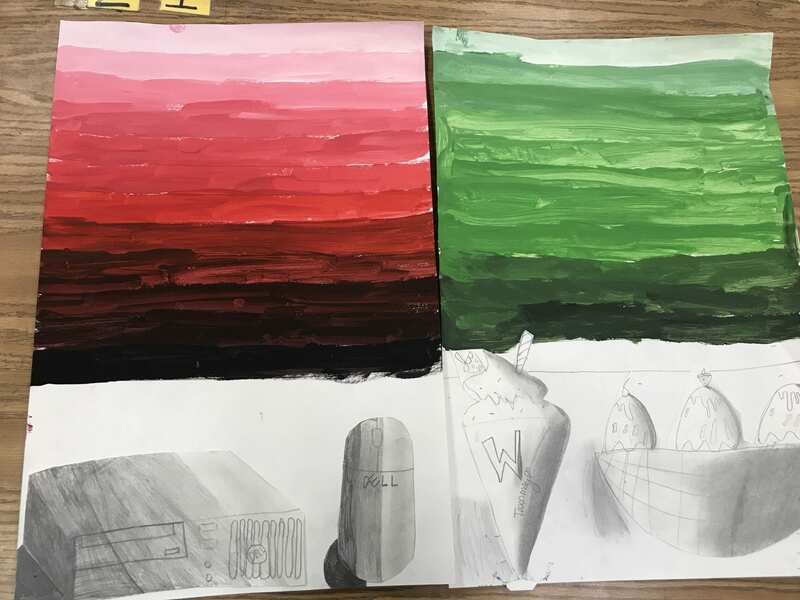 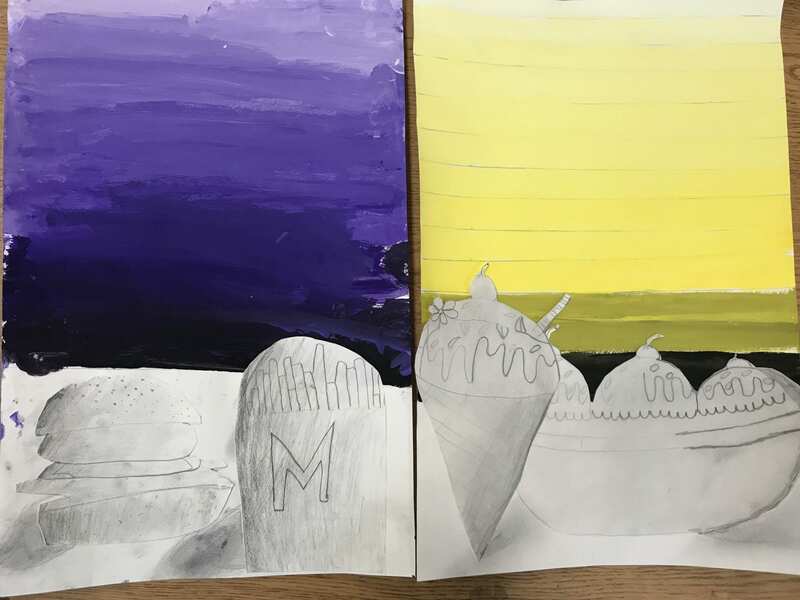 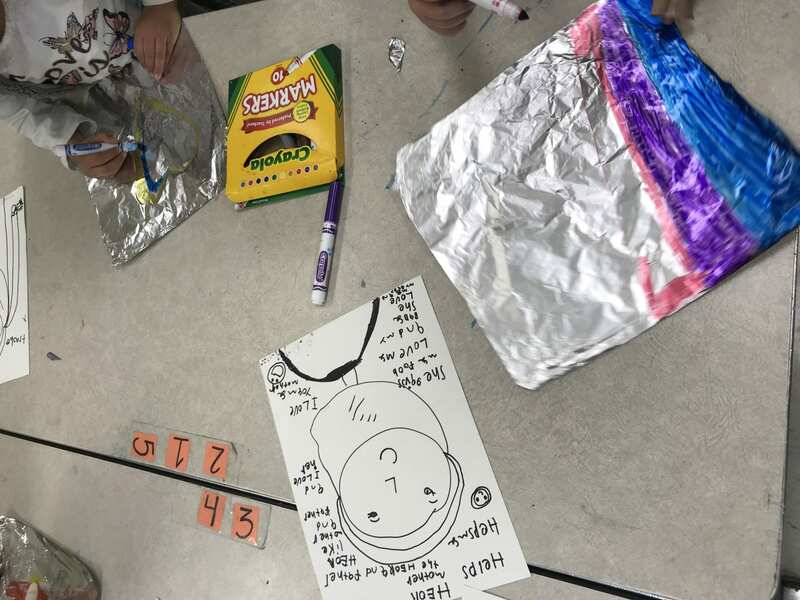 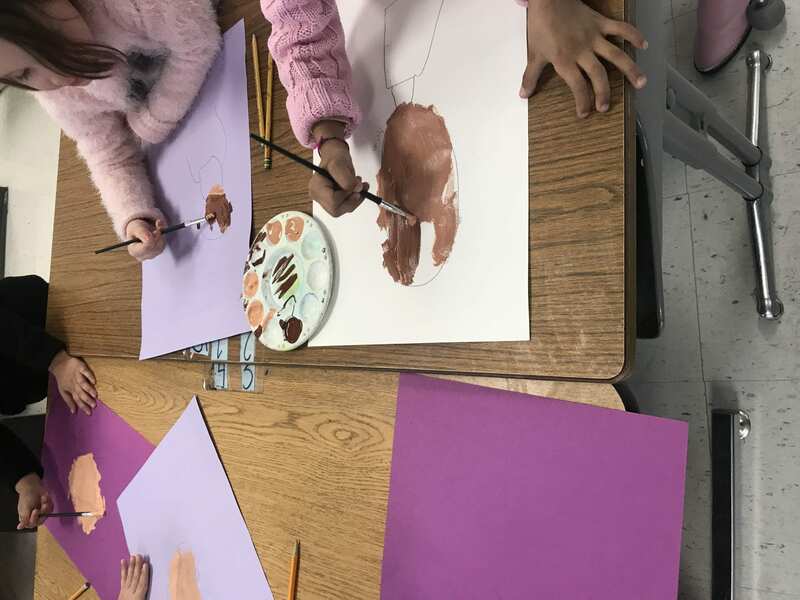 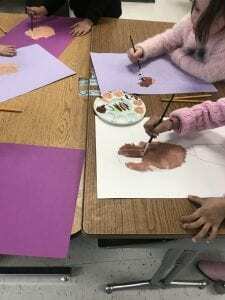 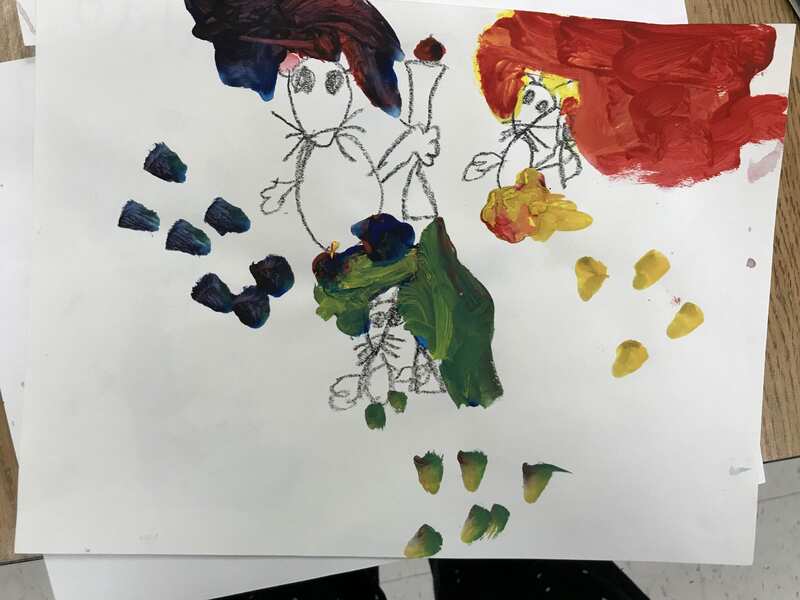 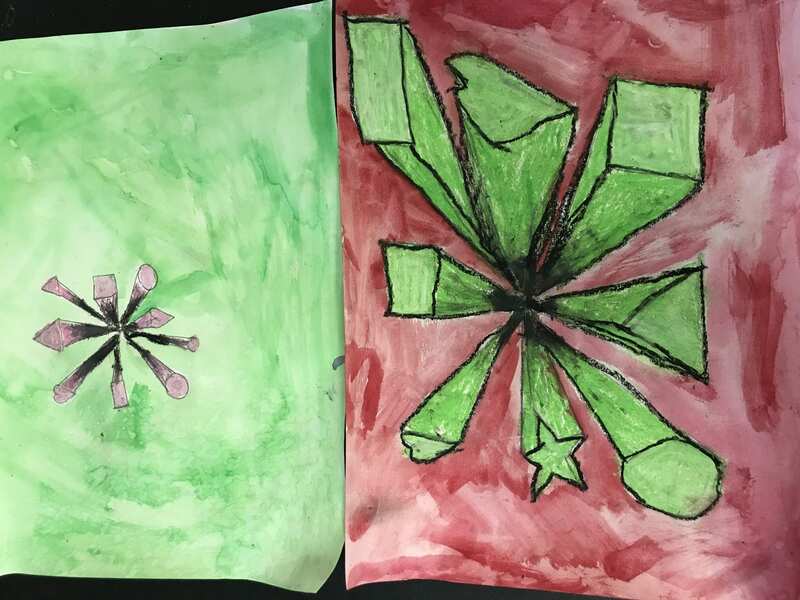 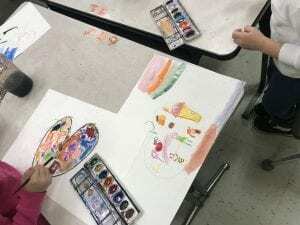 They finished painting their tints and shades of a color, they drew two or more objects and shaded them in to make them look more 3d and then glued everything together. 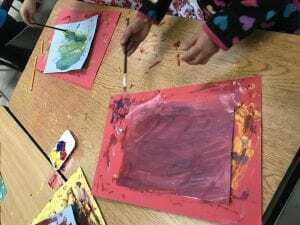 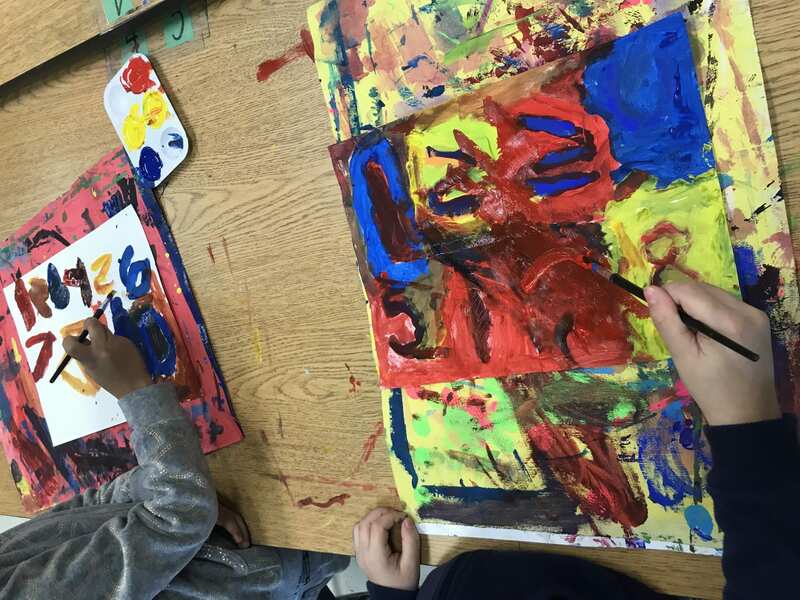 Kindergarten and Young 5 artists continued to mix the primary colors in the beginning of December! 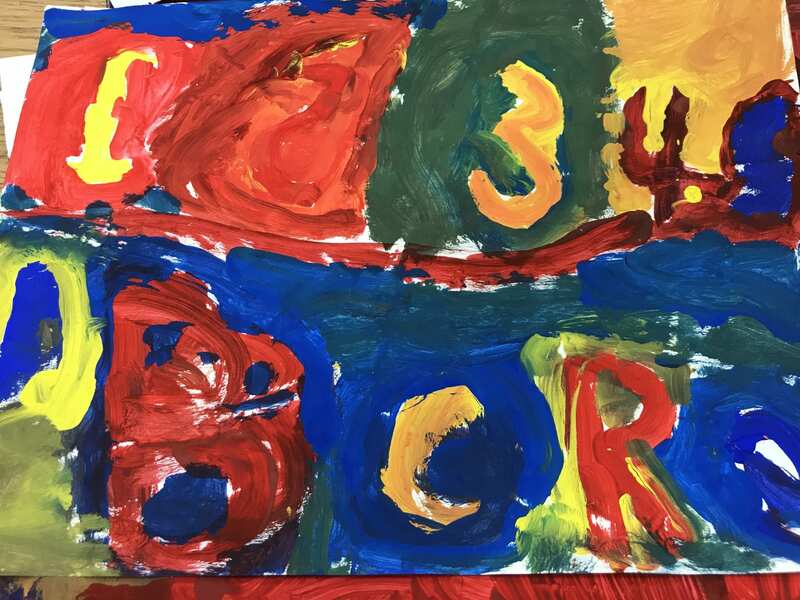 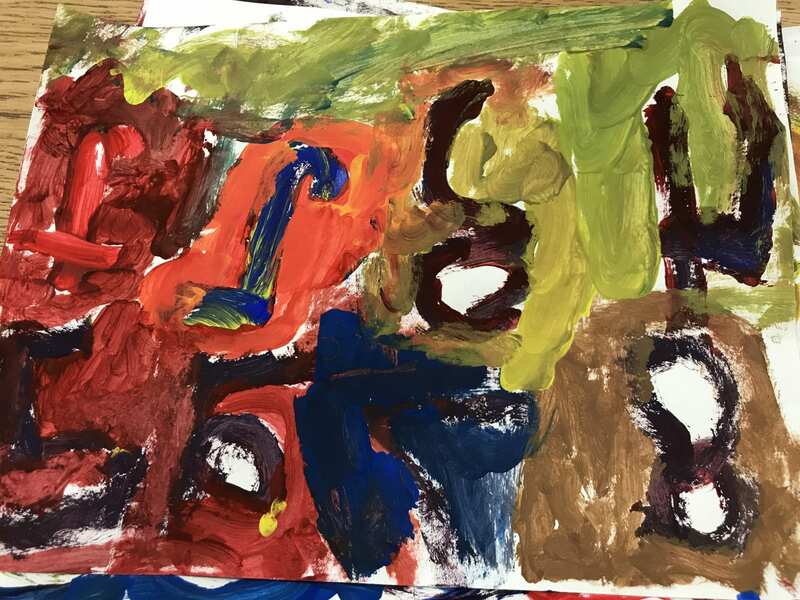 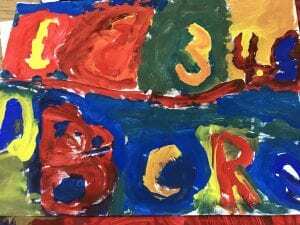 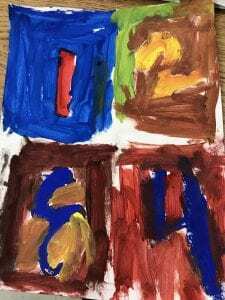 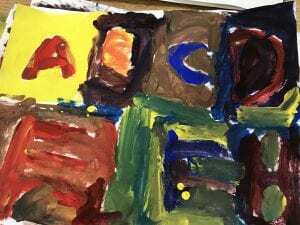 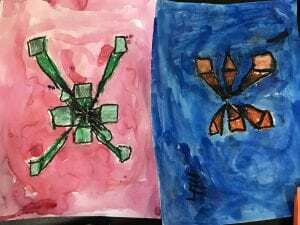 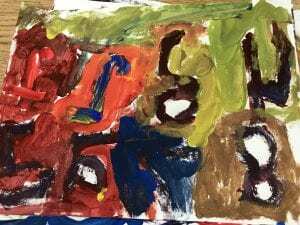 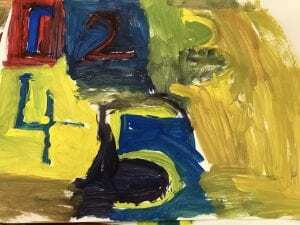 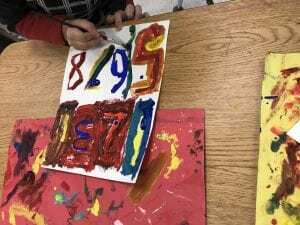 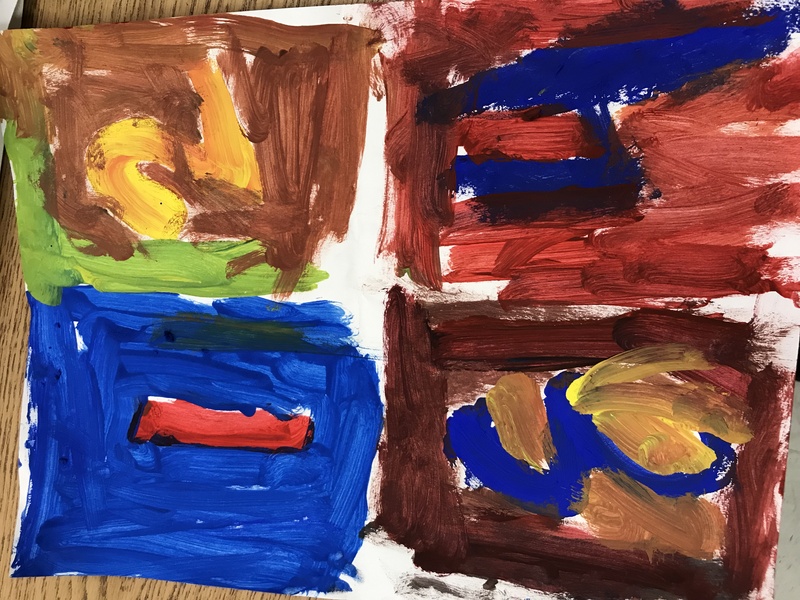 They created number or letter paintings inspired by Jasper Johns. 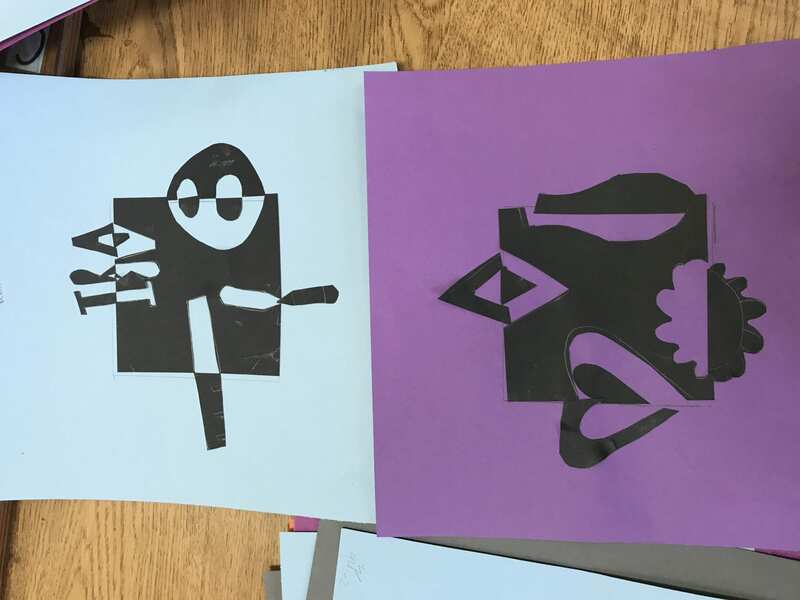 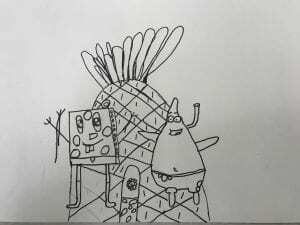 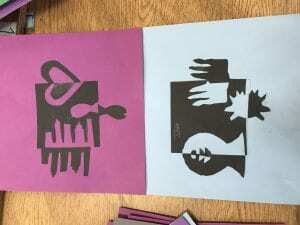 Then they began to use SHAPES in their artwork! 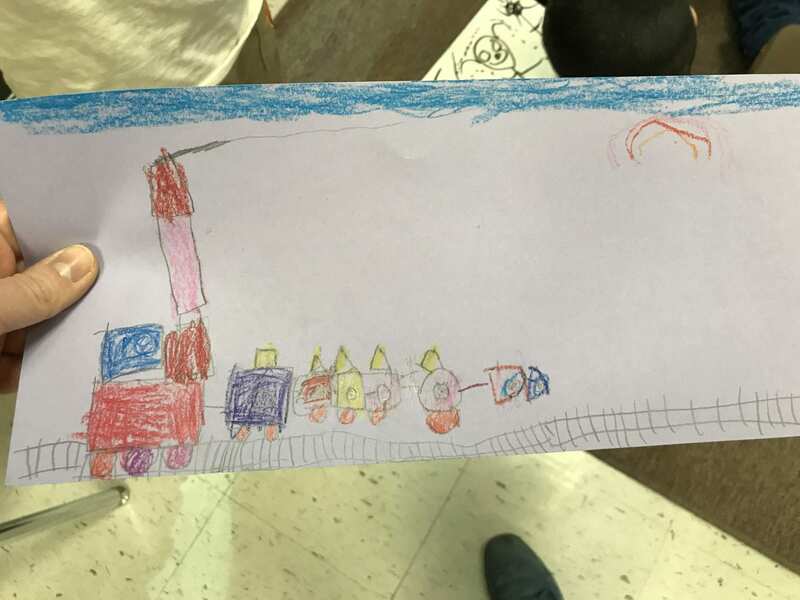 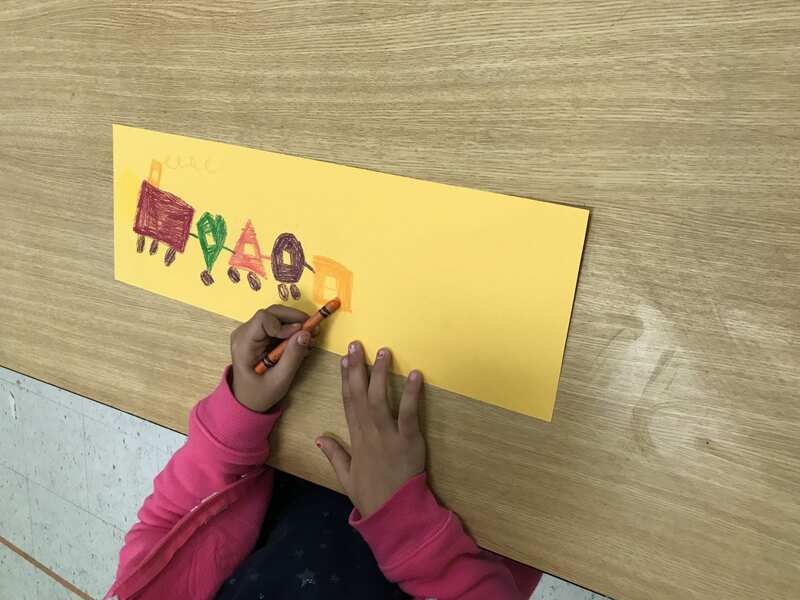 They created a shape collage and drew shape trains! 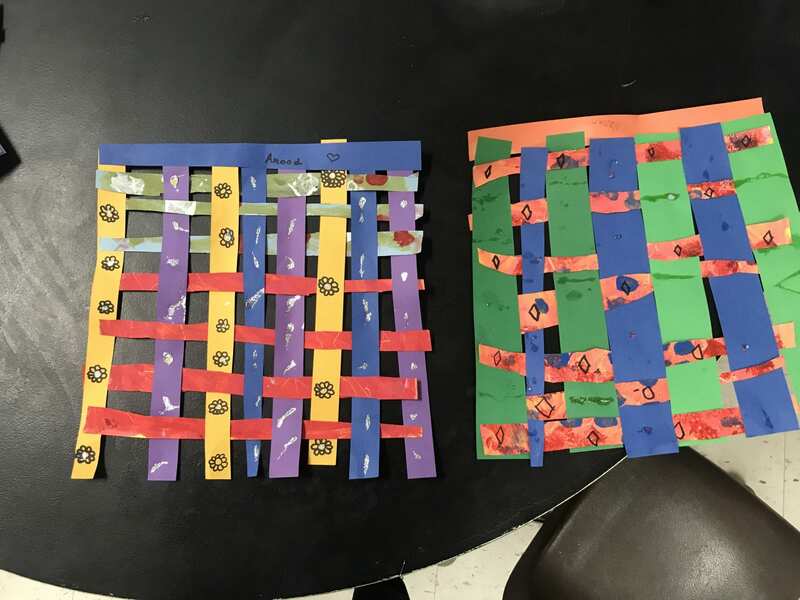 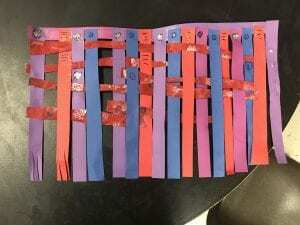 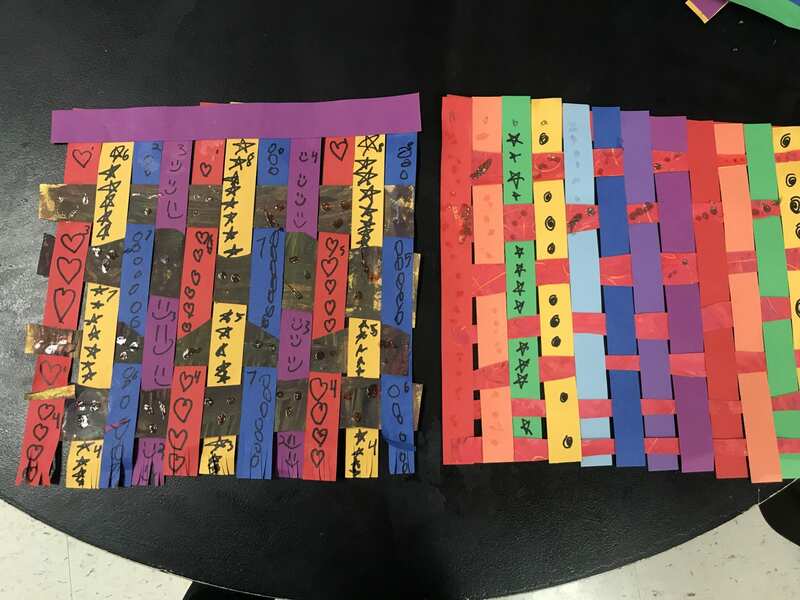 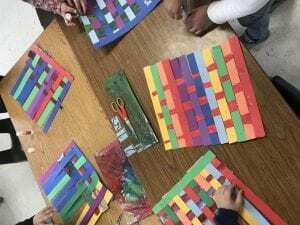 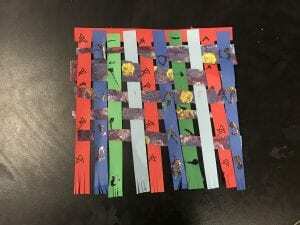 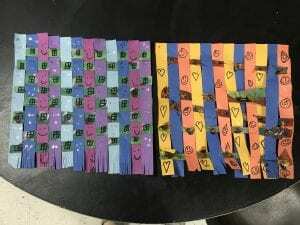 First grade artists have been busy weaving in the art room! 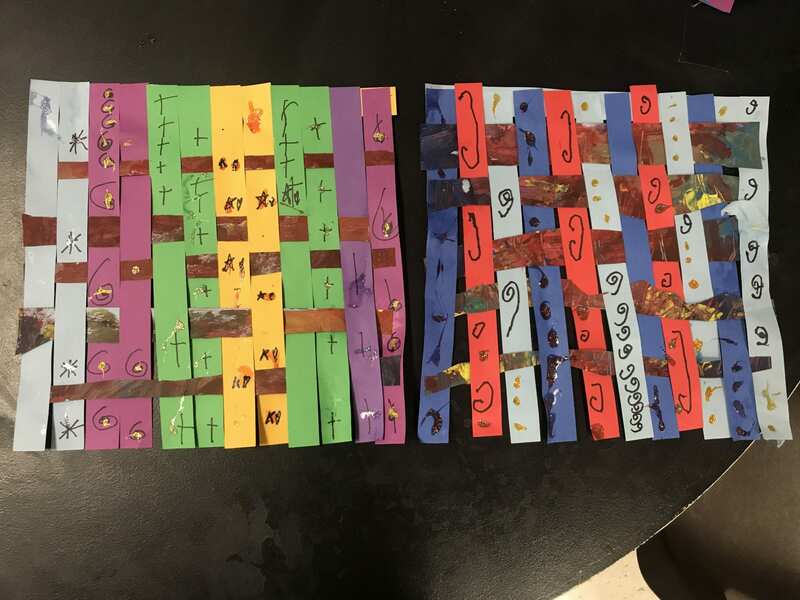 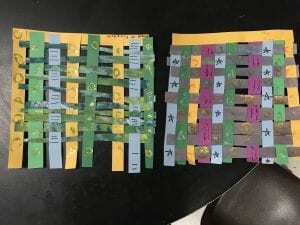 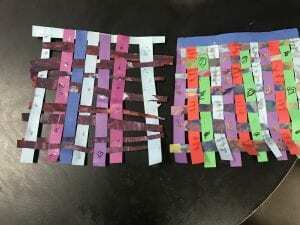 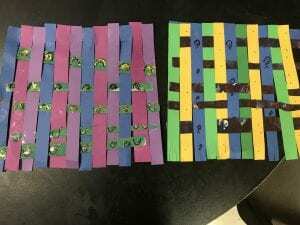 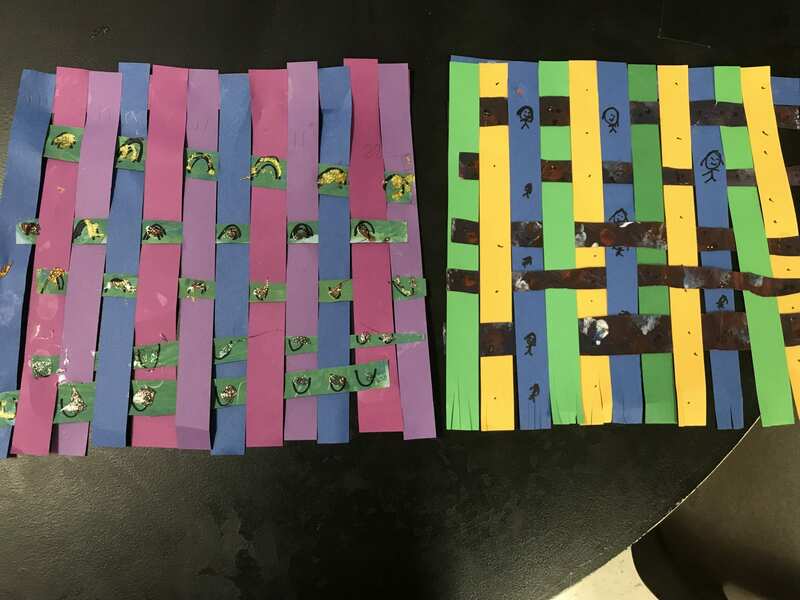 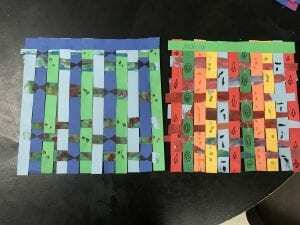 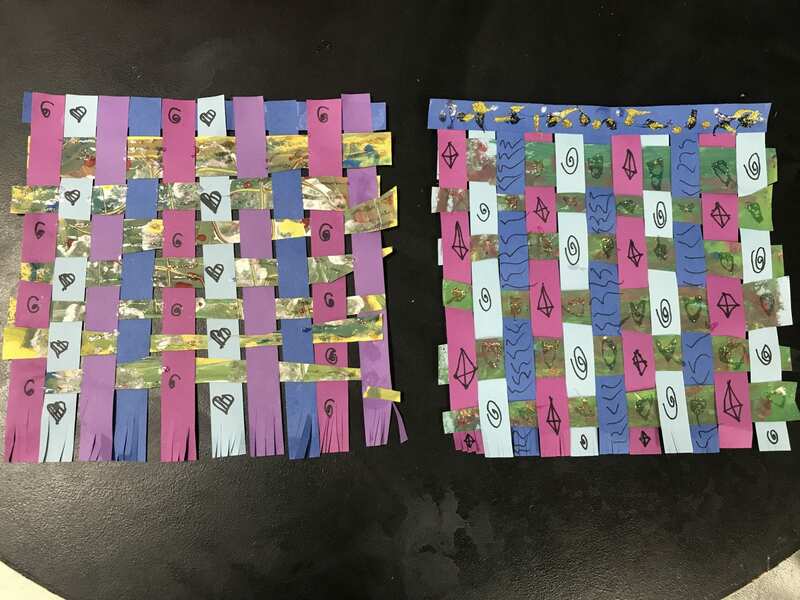 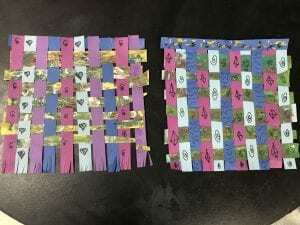 They created a pattern of colors for their warp papers, painted a new paper to be used for the weft of their weaving, and then wove the two together! 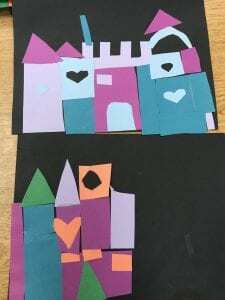 They are still working on adding details and more patterns. 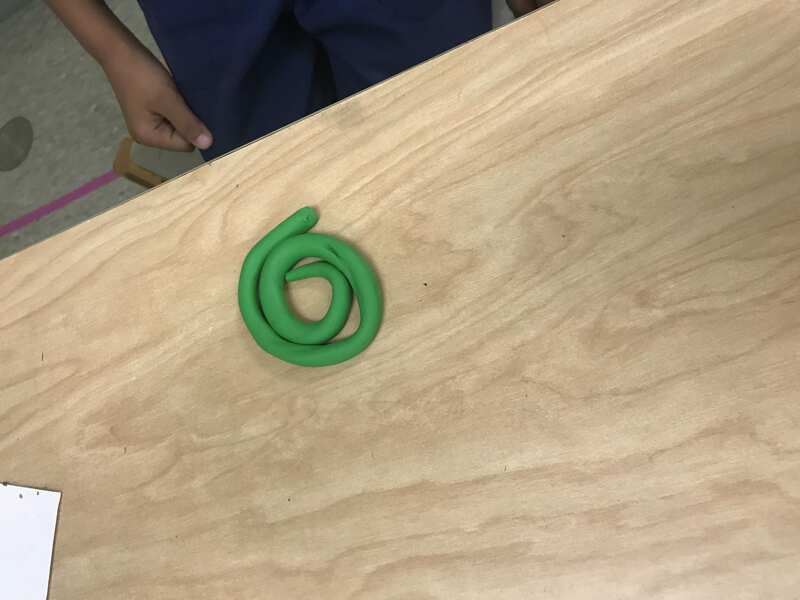 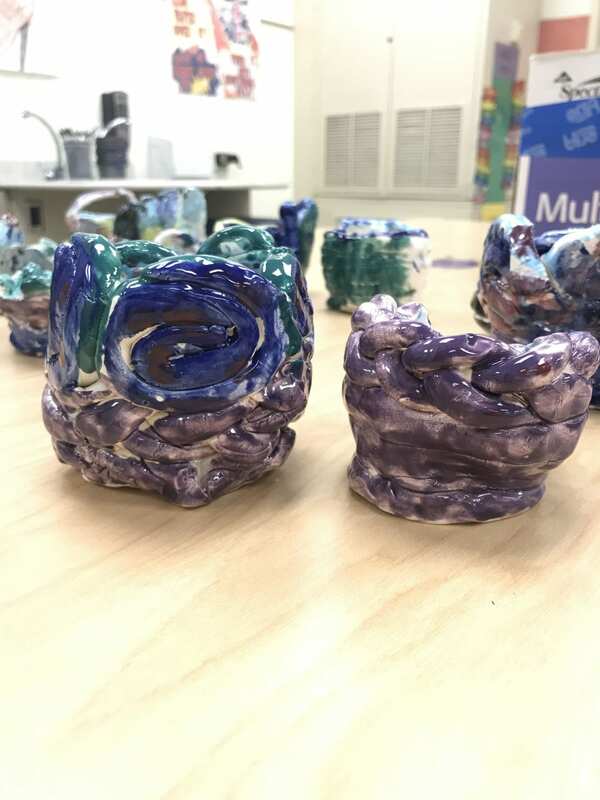 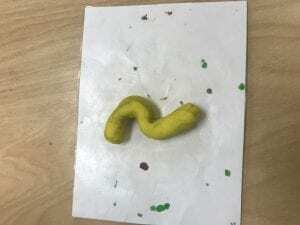 Third grade artists have been learning about clay building with coils! 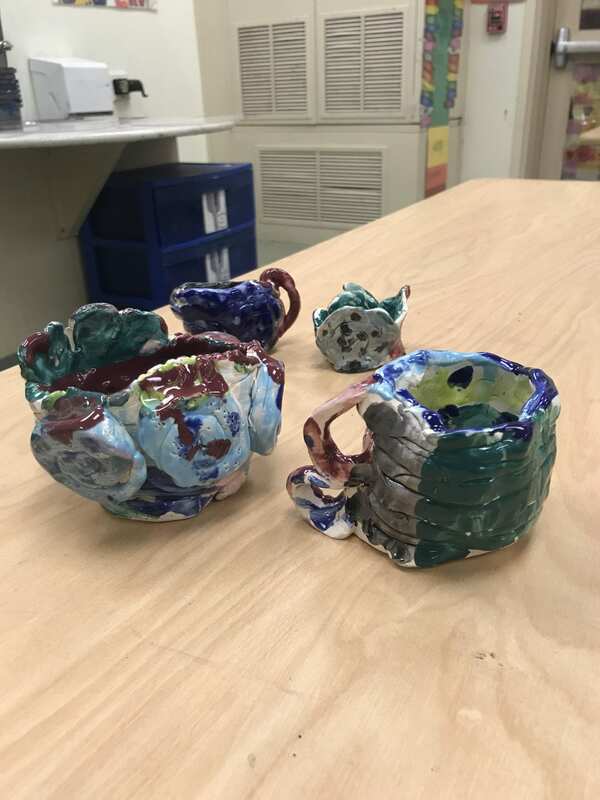 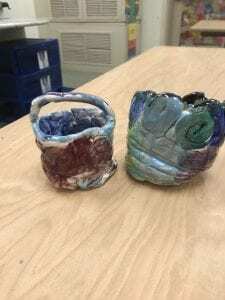 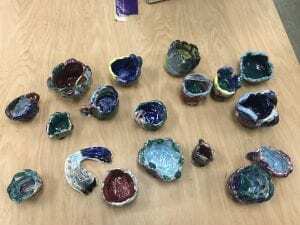 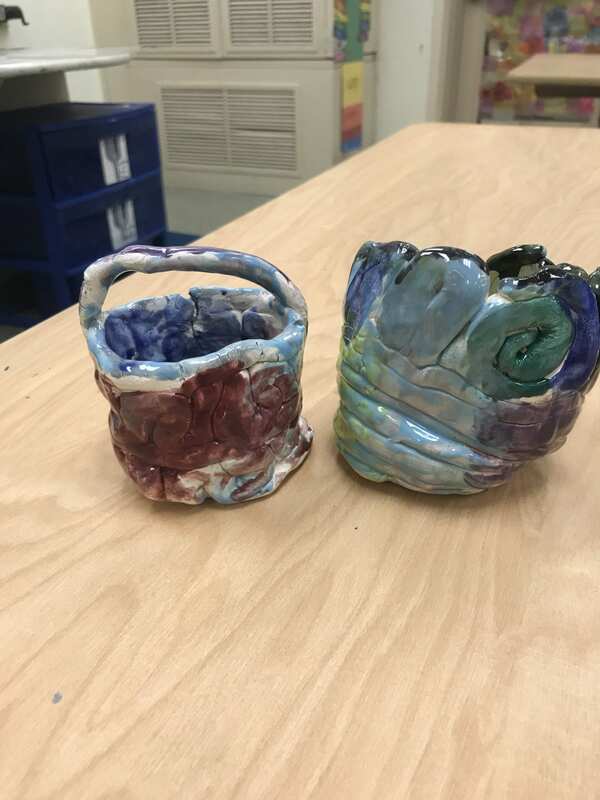 They each used a variety of coil designs to create their own bowls or cups and then glazed them to add color. 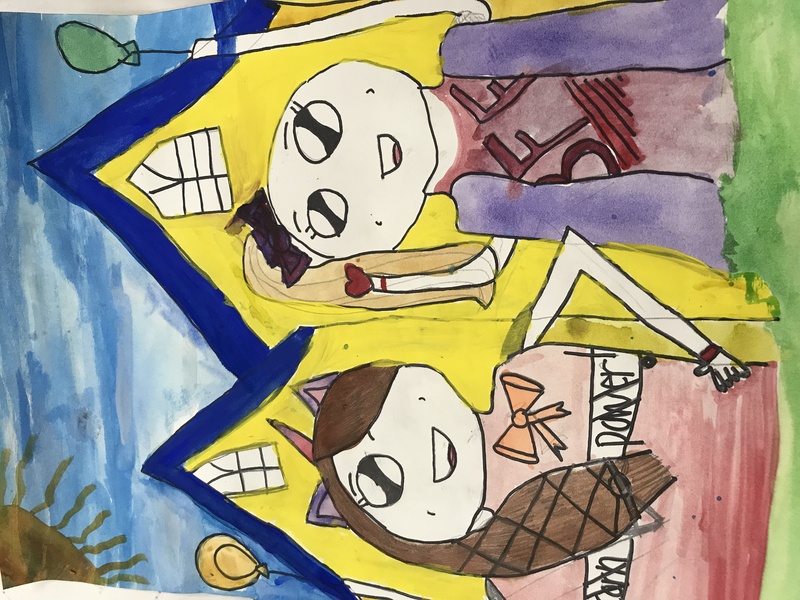 Fifth grade artists finished painting their American Gothic parodies! They have now begun a value project. 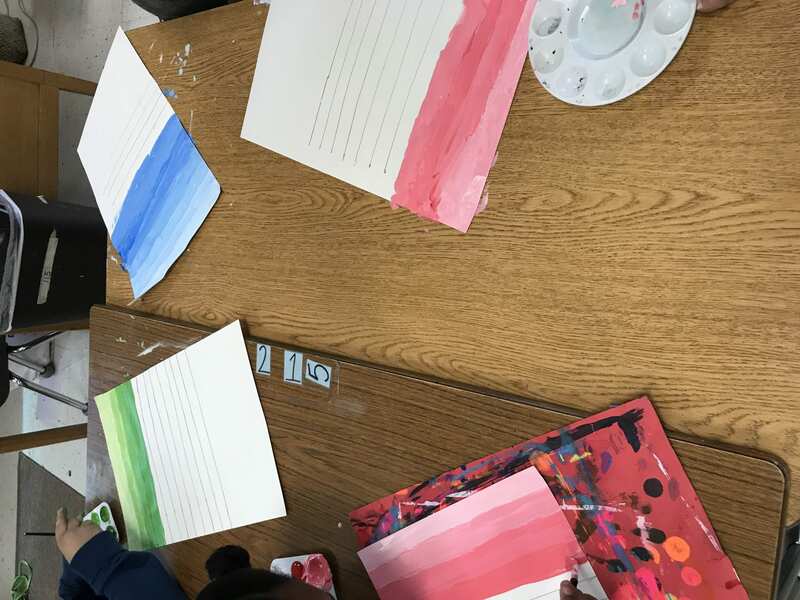 So far they have created tints and shades of a color for their background! 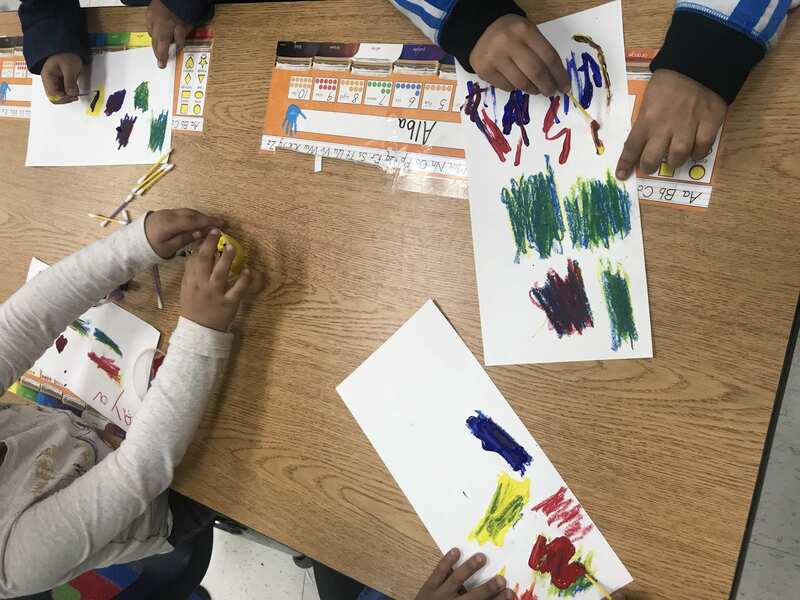 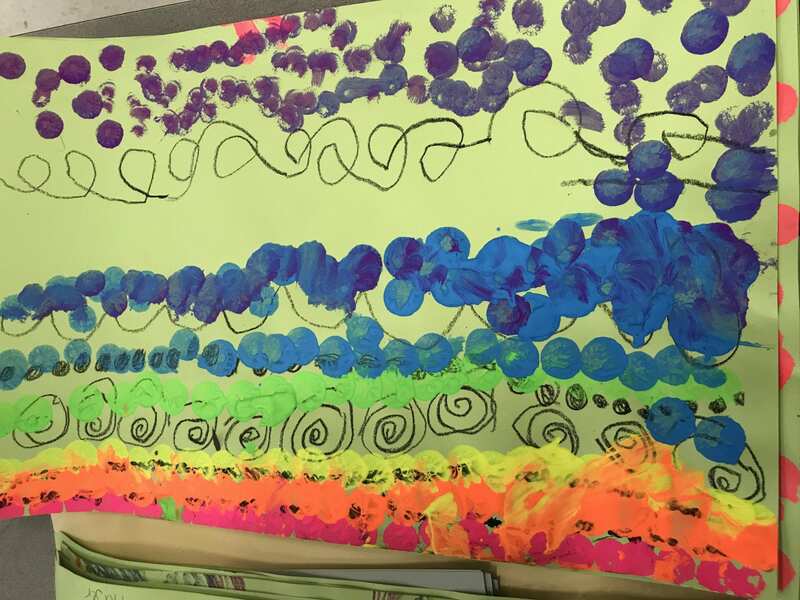 During the month of November Kindergarten artists continued mixing the primary colors to create secondary colors! 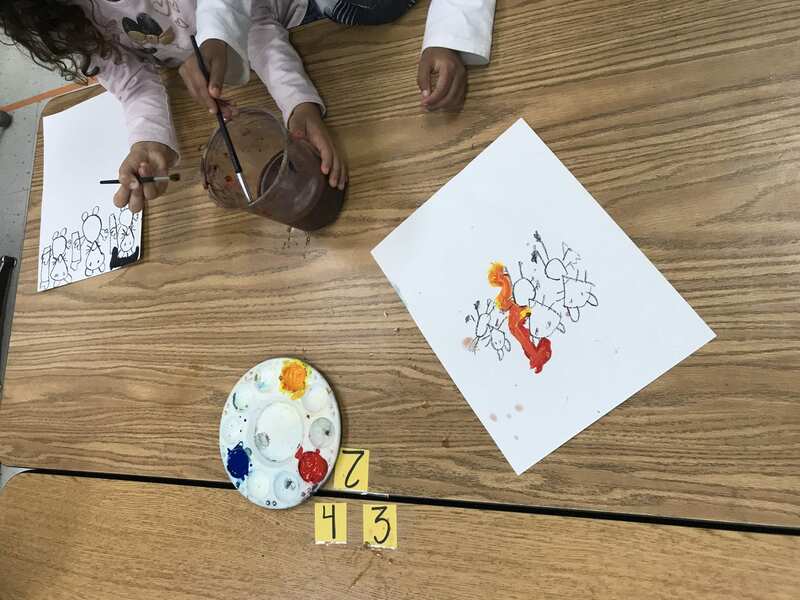 They read the book “Mice Paint” and then drew mice painting. 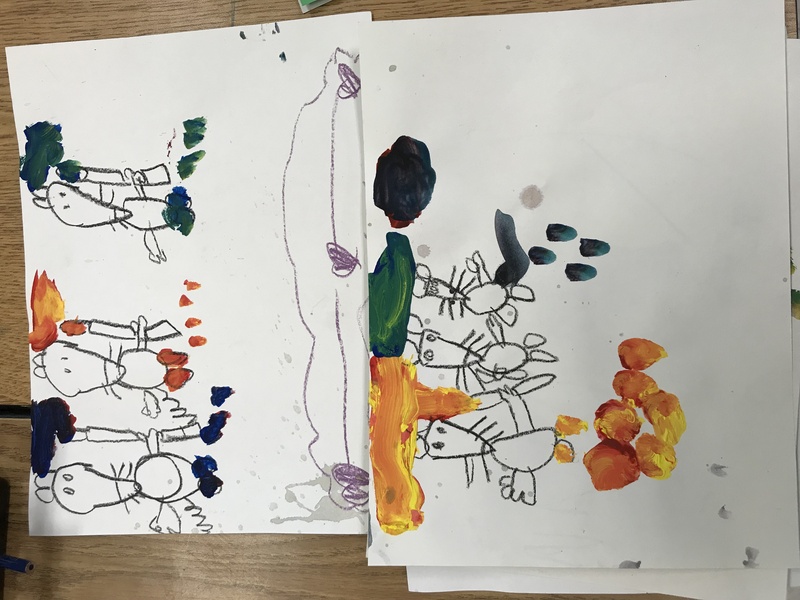 They mixed the primary colors together above each mouse, just like they did in the story. 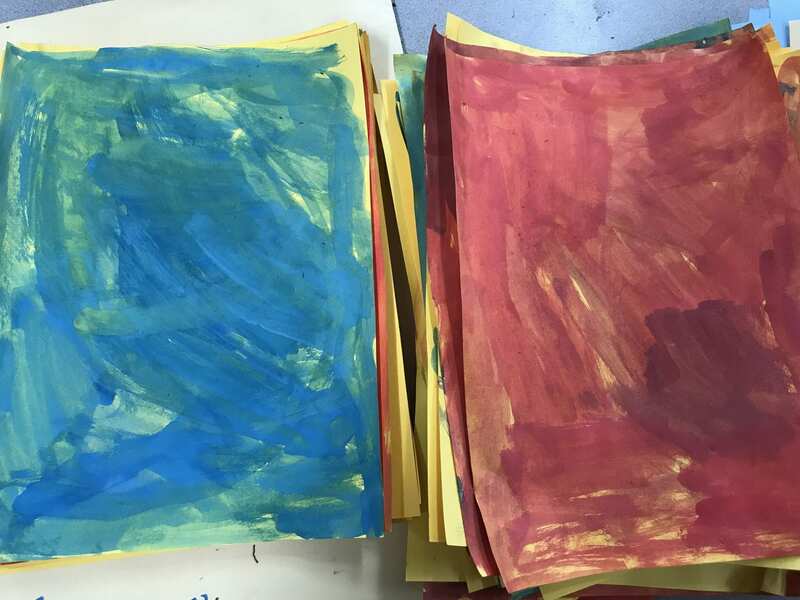 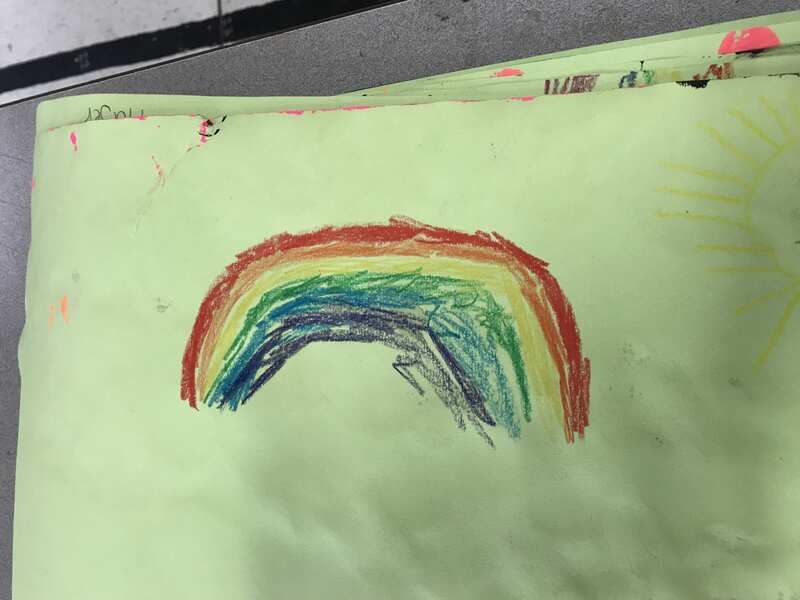 At the end of the card-marking every Kindergarten artist created a portfolio-folder to take their 2D artwork home in. 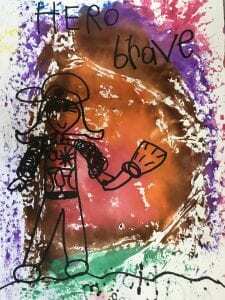 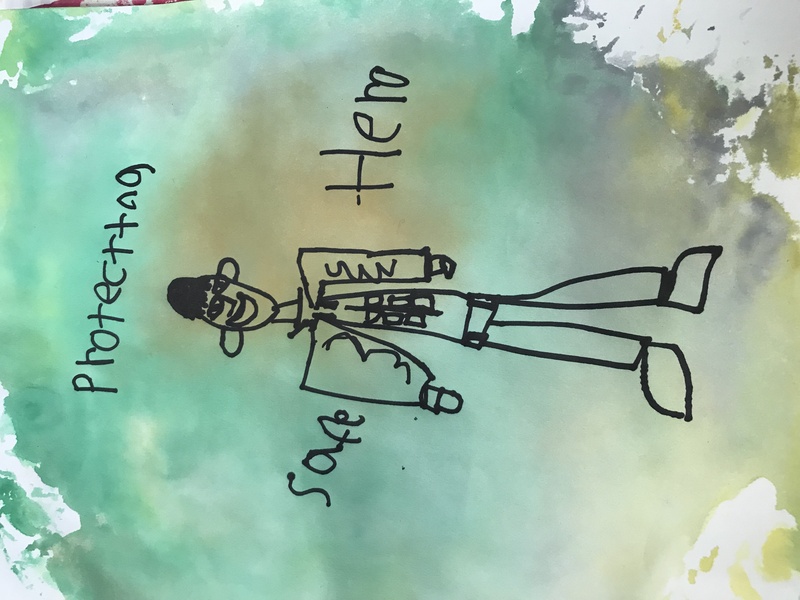 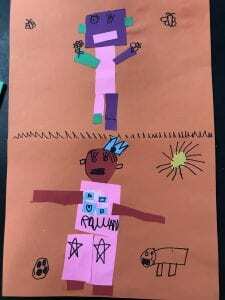 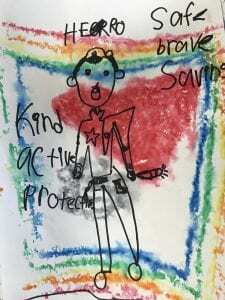 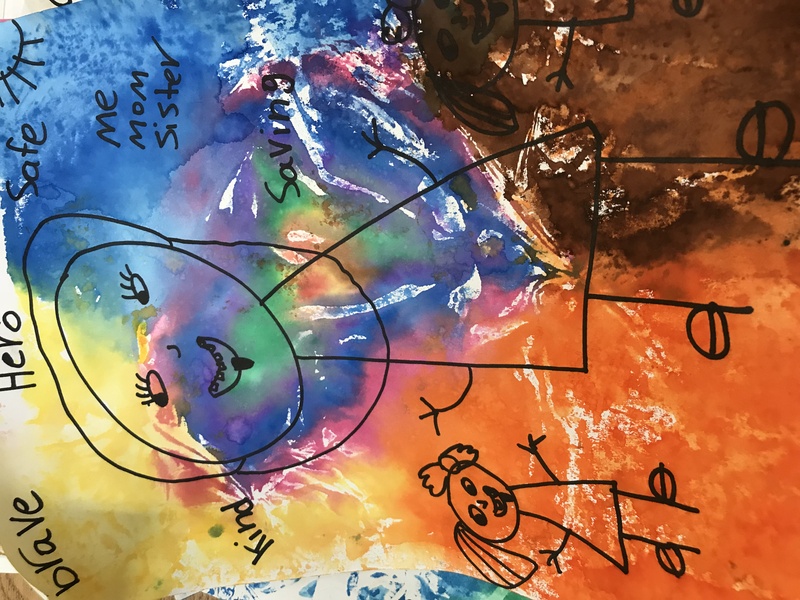 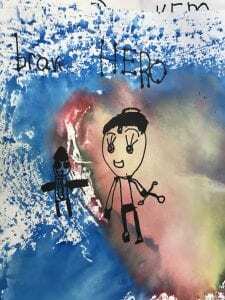 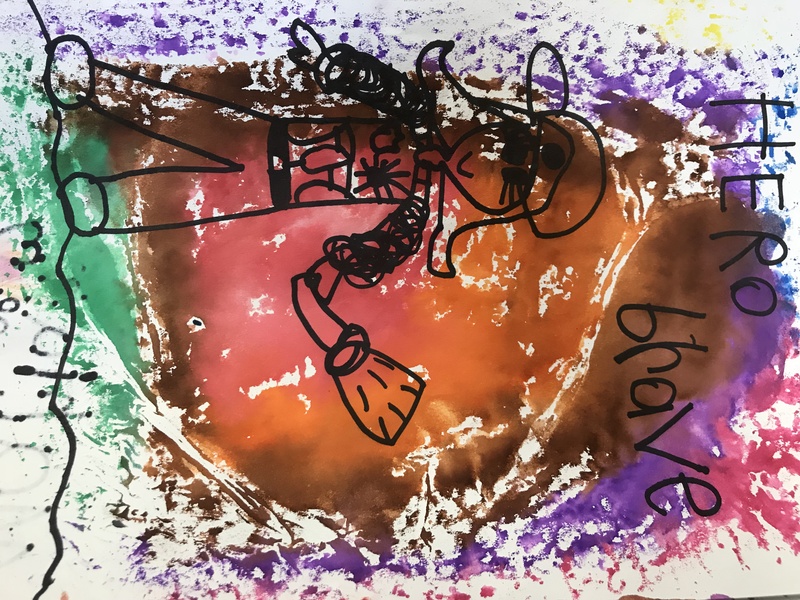 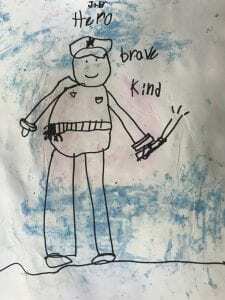 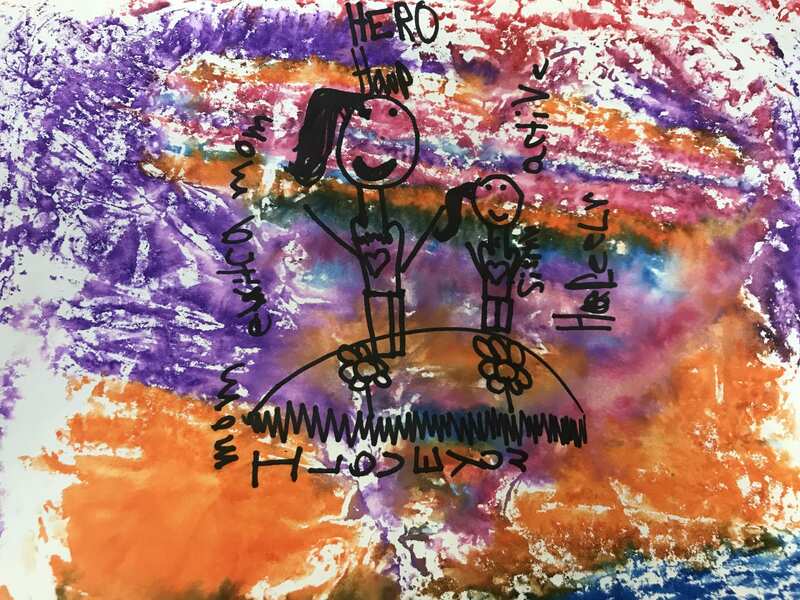 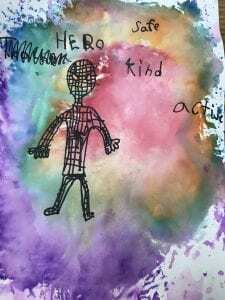 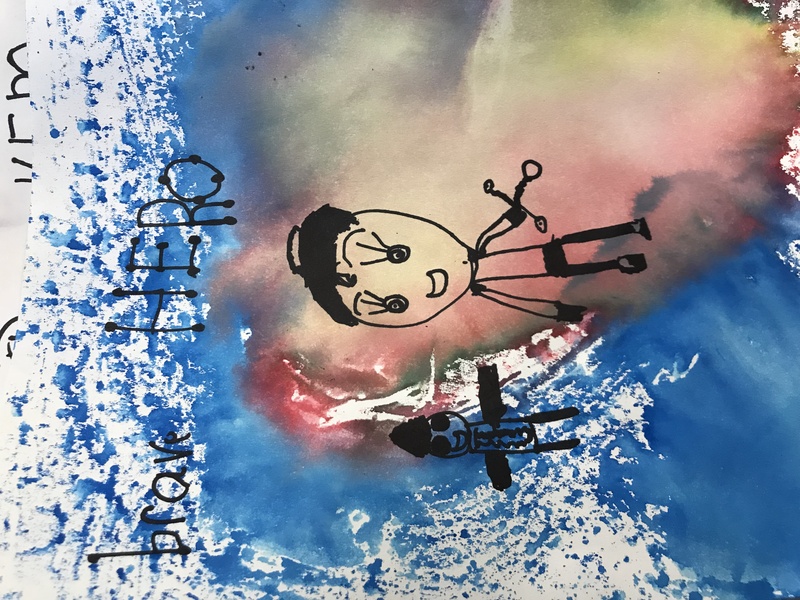 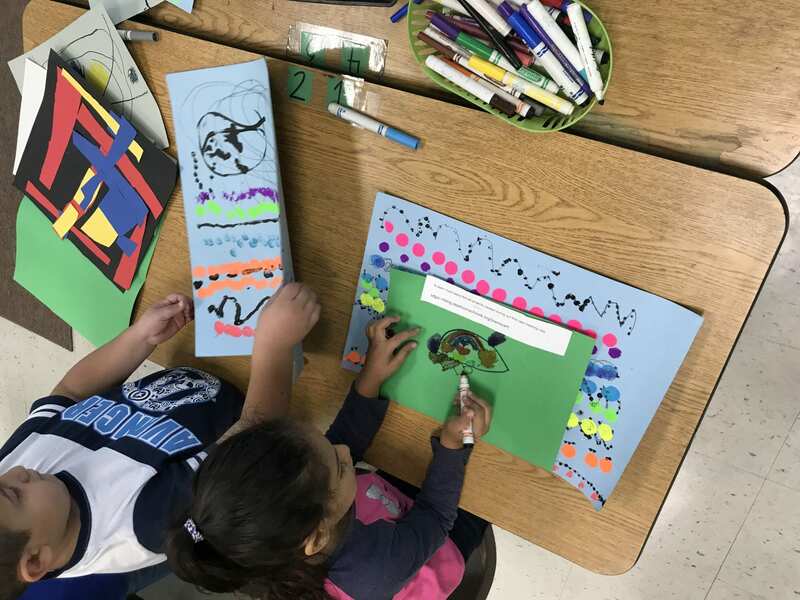 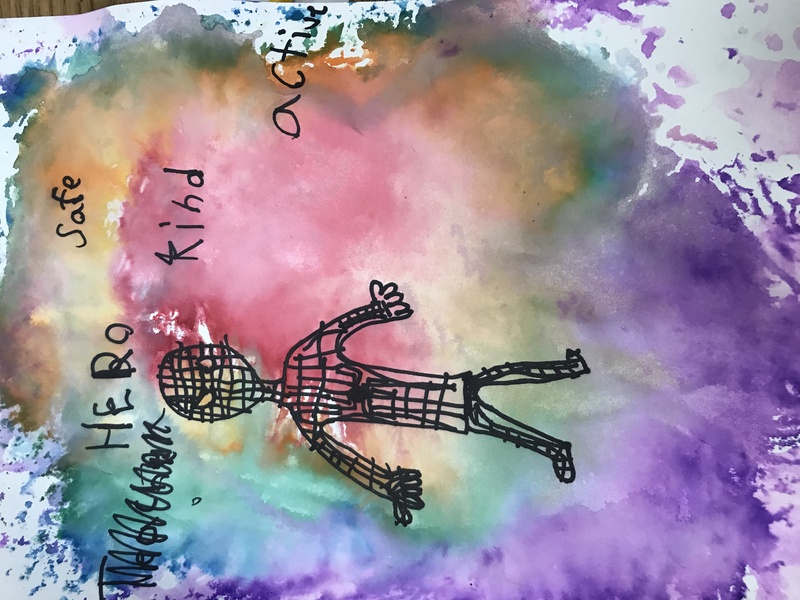 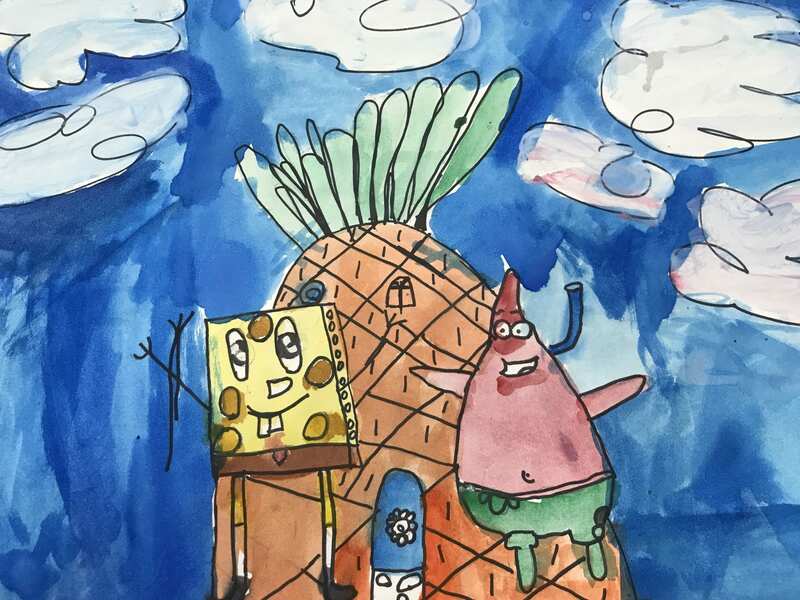 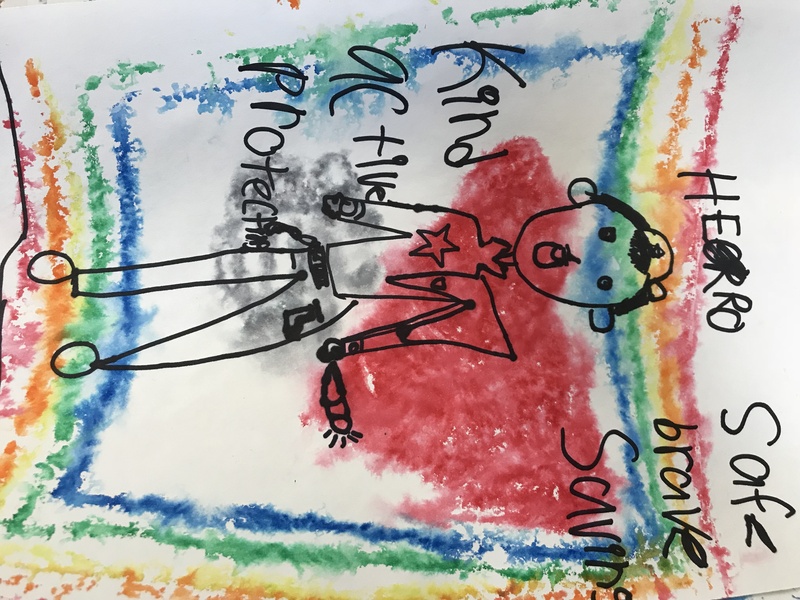 First grade artists created an artwork that showed “heroes around them”, which is the PTA reflections theme for this year. 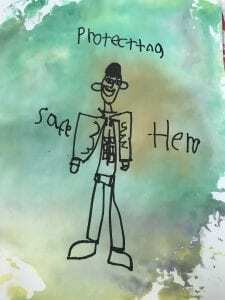 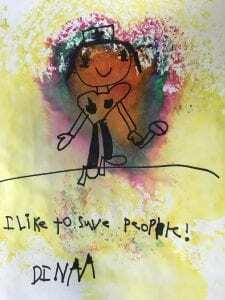 They began by drawing their heroes and then used a foil-printmaking technique to add color to the background. 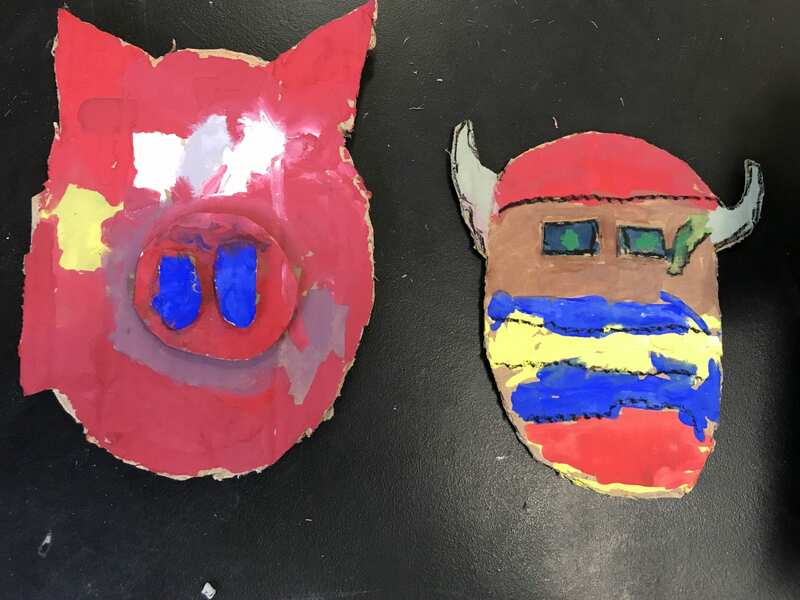 Third grade artists finished their cubism-inspired cardboard masks! 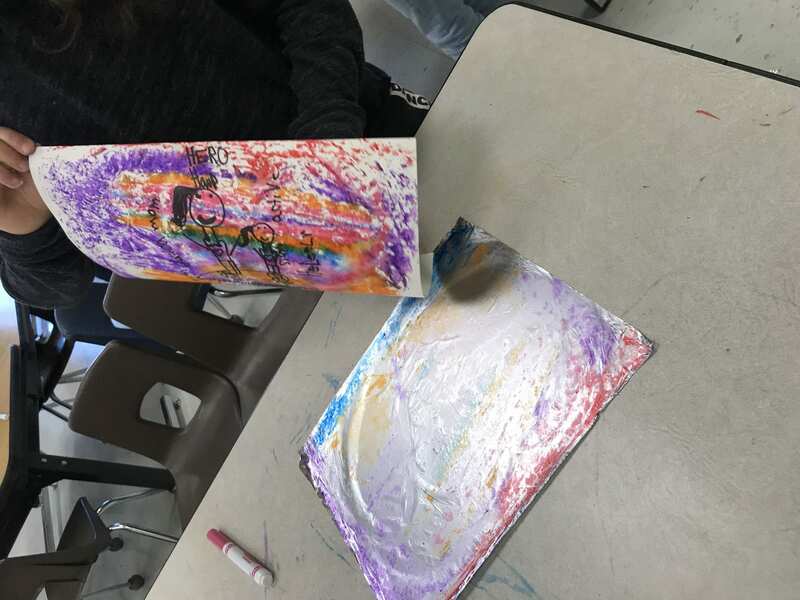 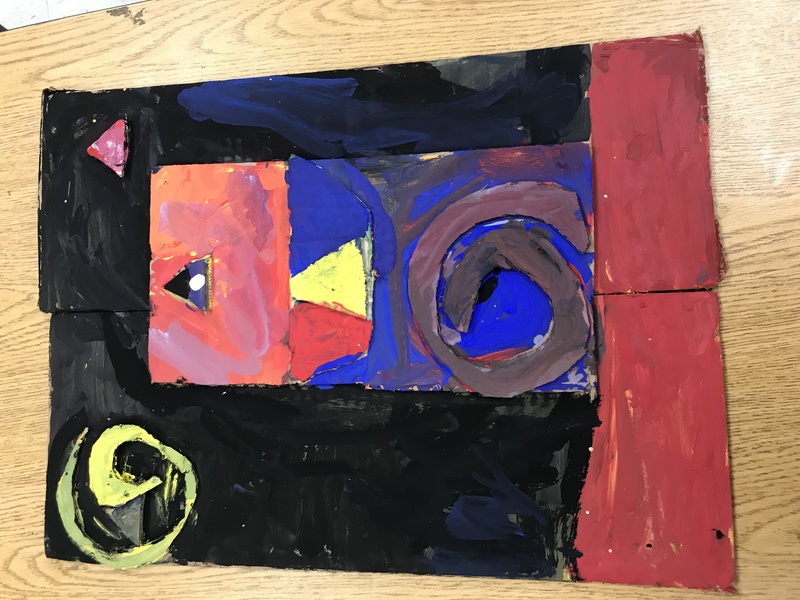 Fifth grade artists finished their abstract cardboard sculptures and then have started an American Gothic parody painting. 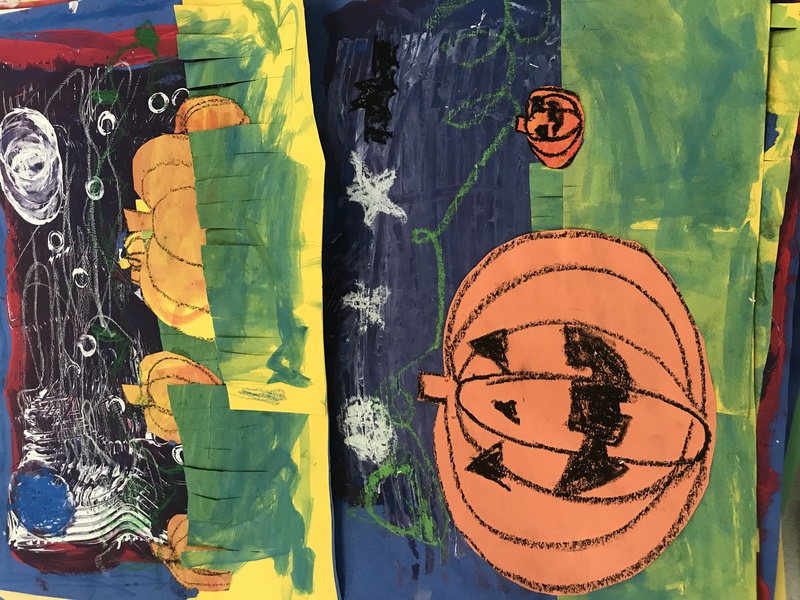 On Halloween artists at Lowrey took a break from their usual projects and created a few Halloween-inspired pieces! 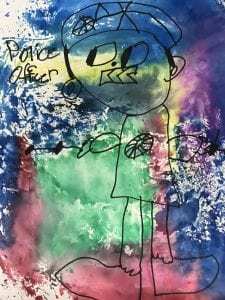 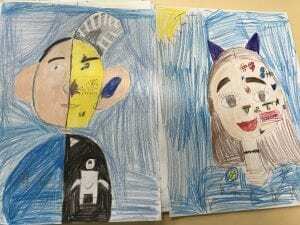 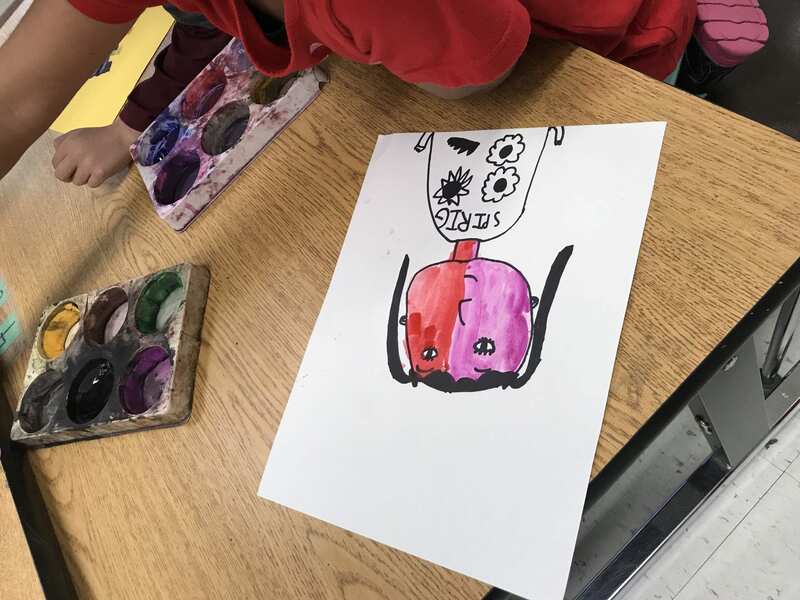 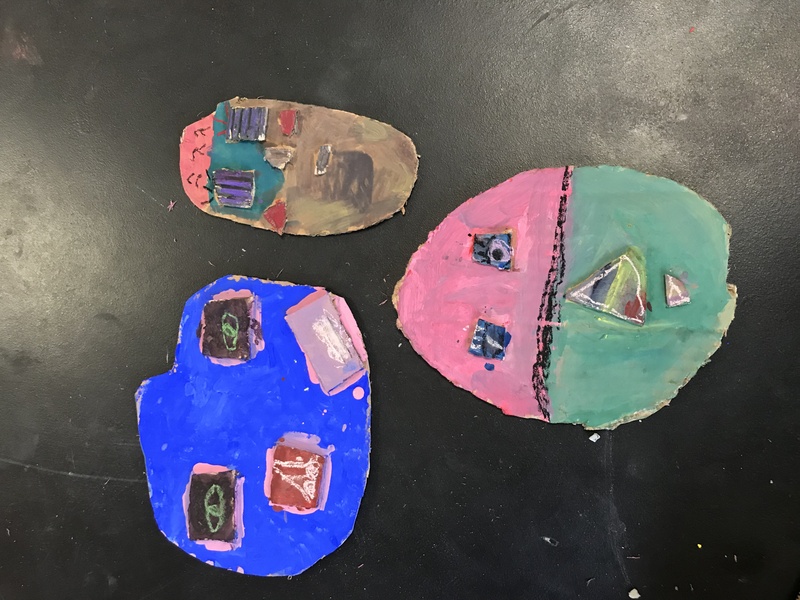 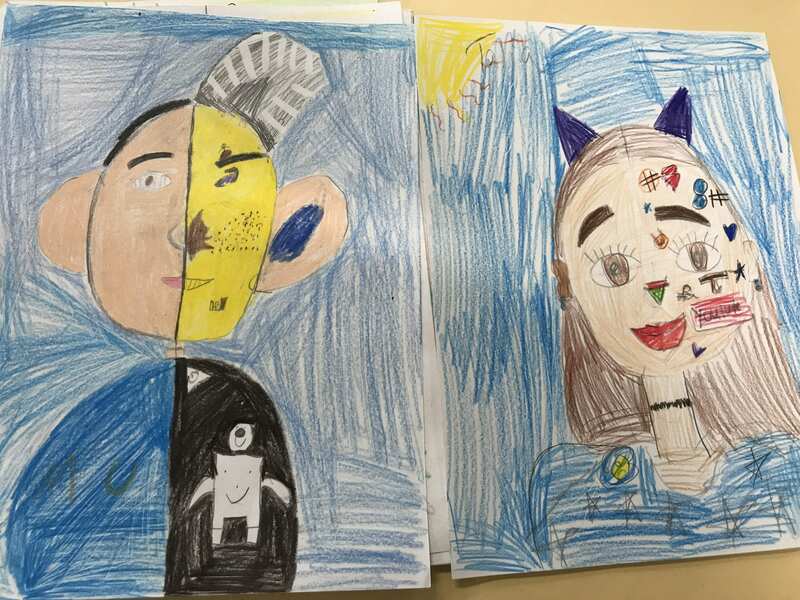 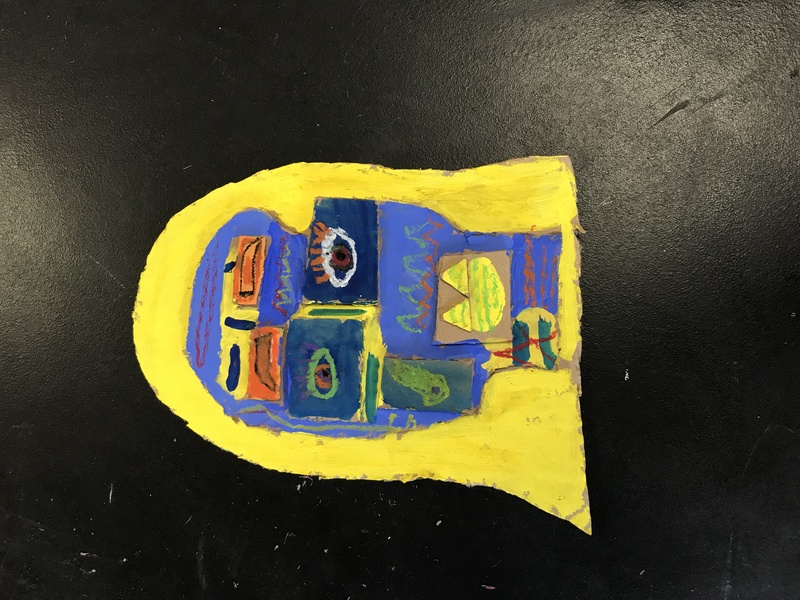 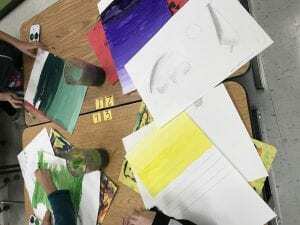 First grade artists created Picasso inspired self-portraits. 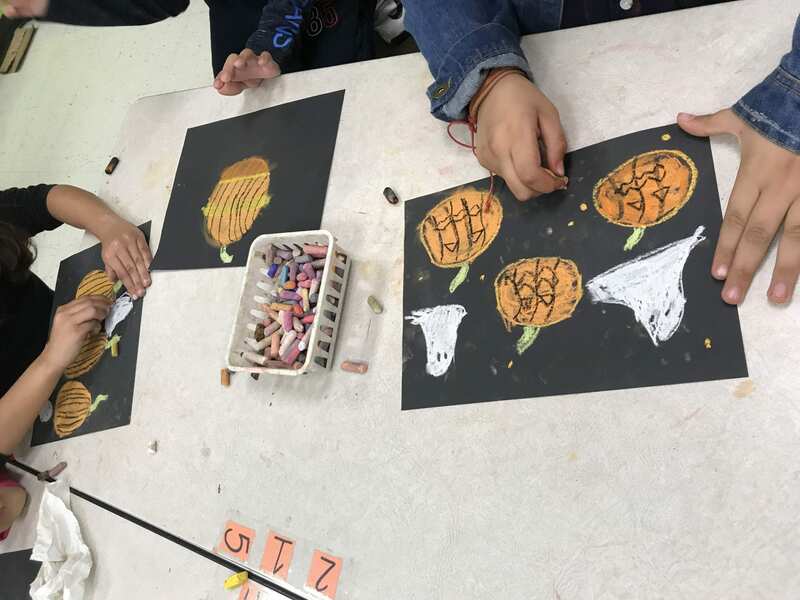 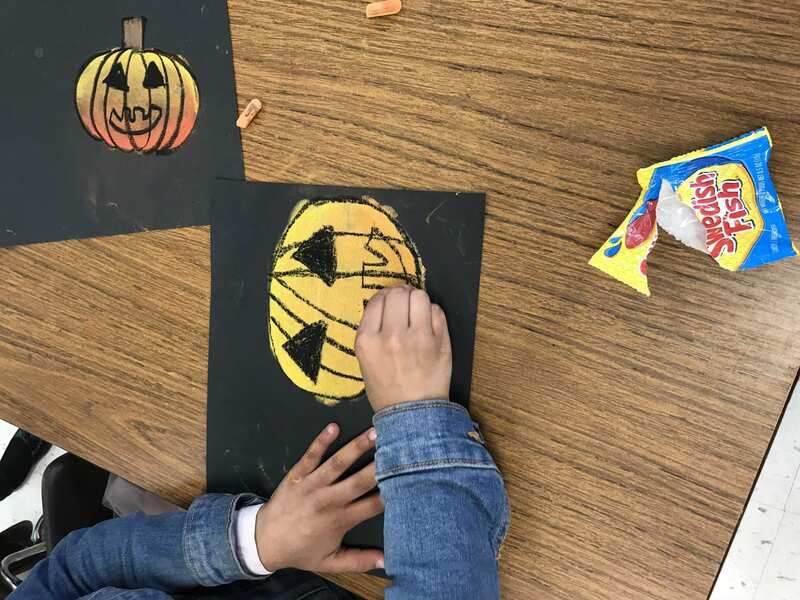 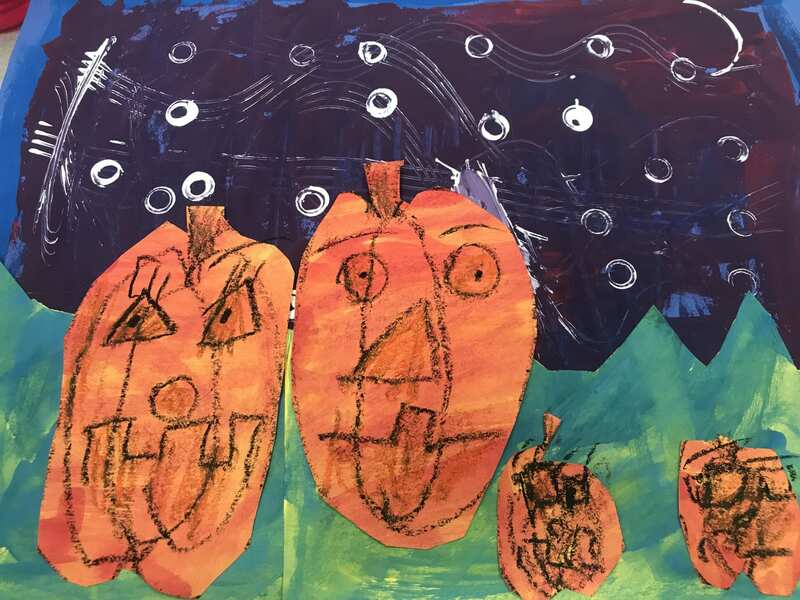 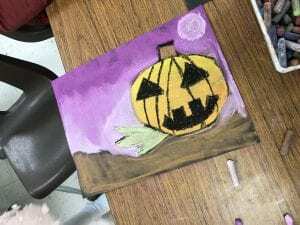 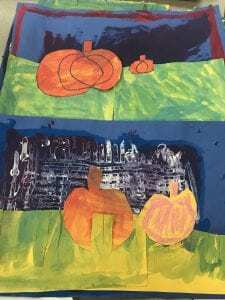 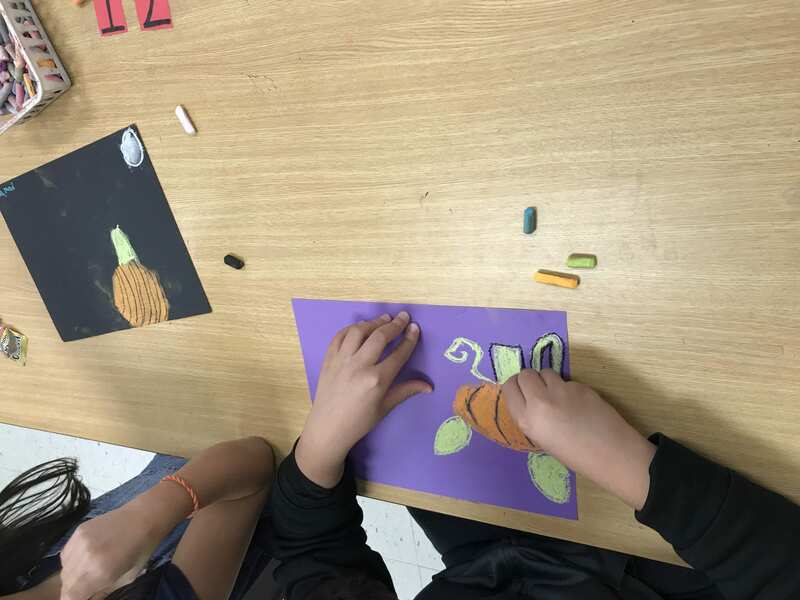 Third and fifth grade artists used chalk and oil pastels to create pumpkins (and other Halloween creatures). 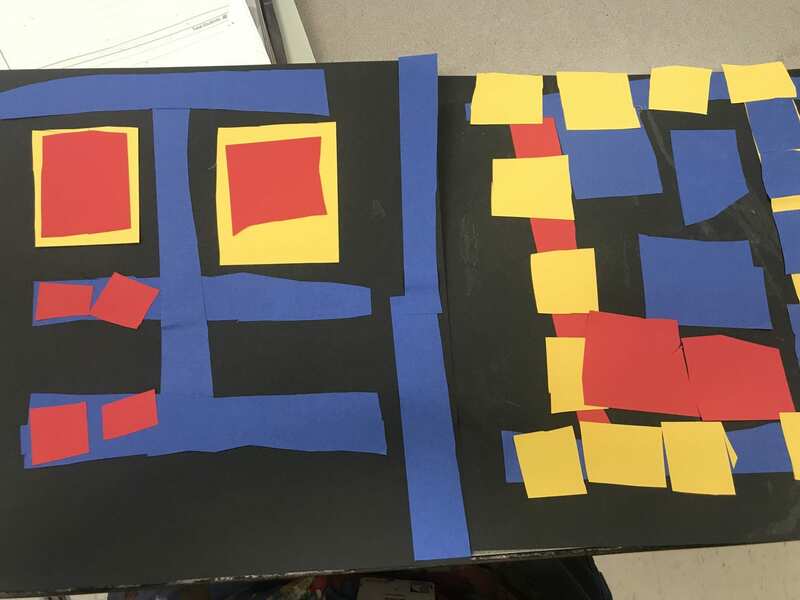 They experimented with blending, layering colors, and adding shadows to 3D objects. Kindergarten and Young 5 artists have been learning about the primary colors, red, yellow, and blue, during the month of October! 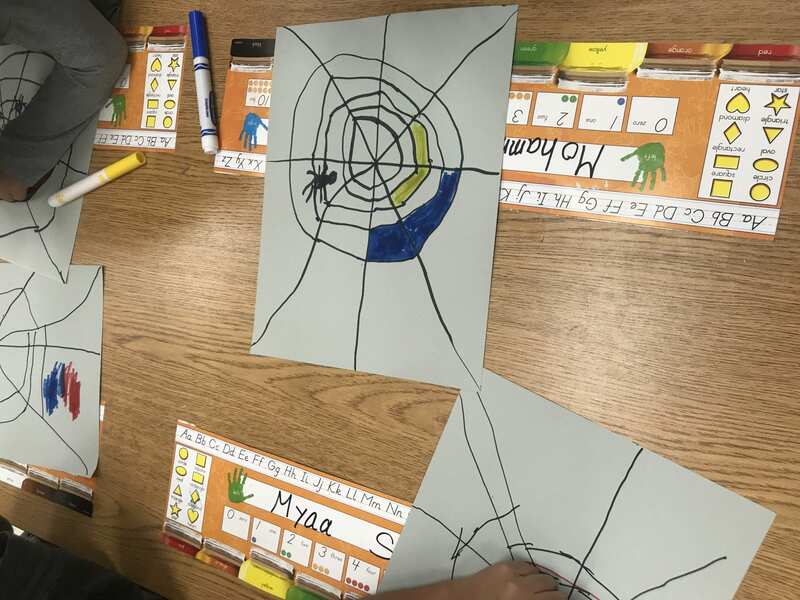 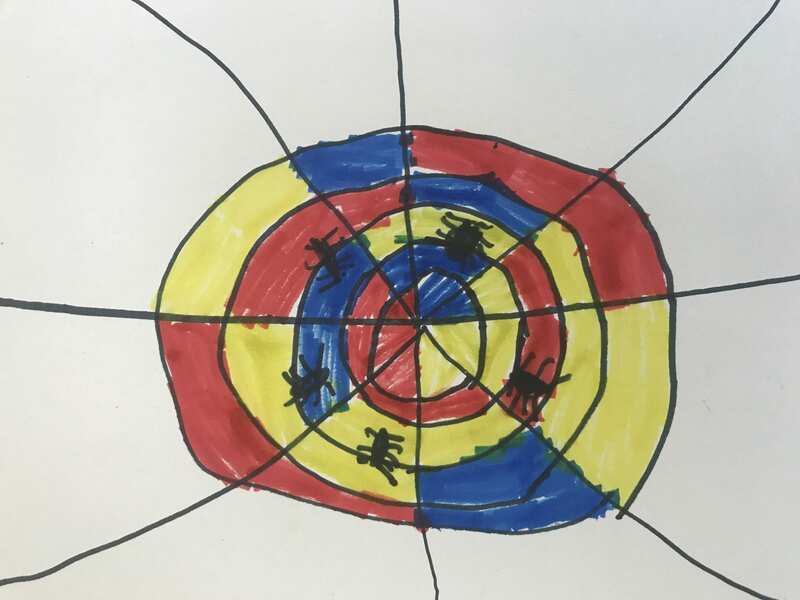 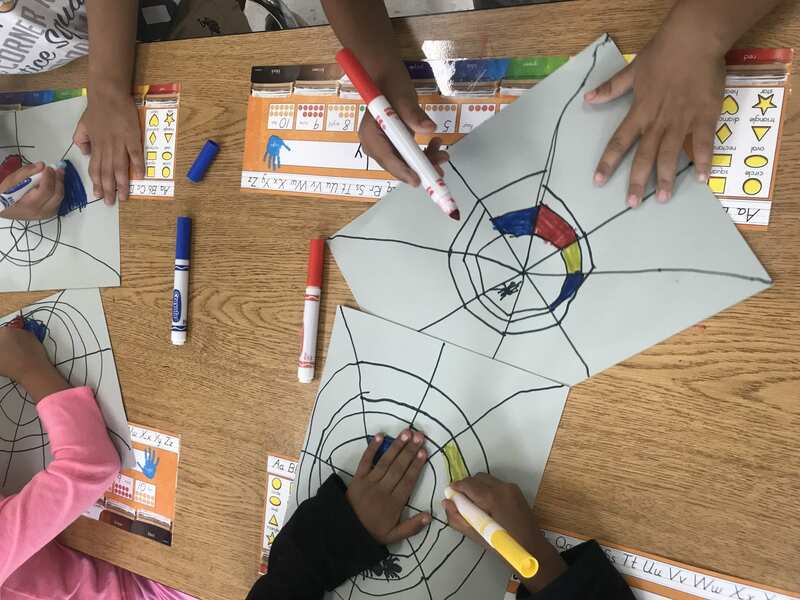 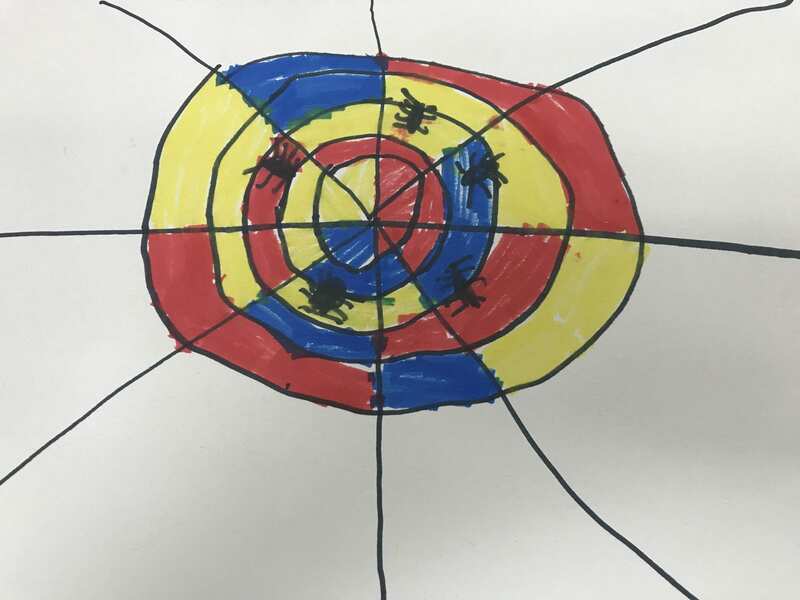 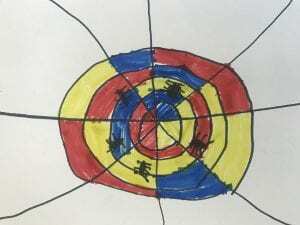 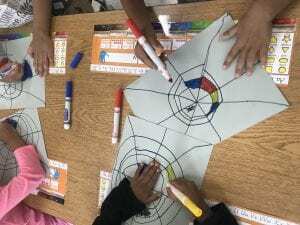 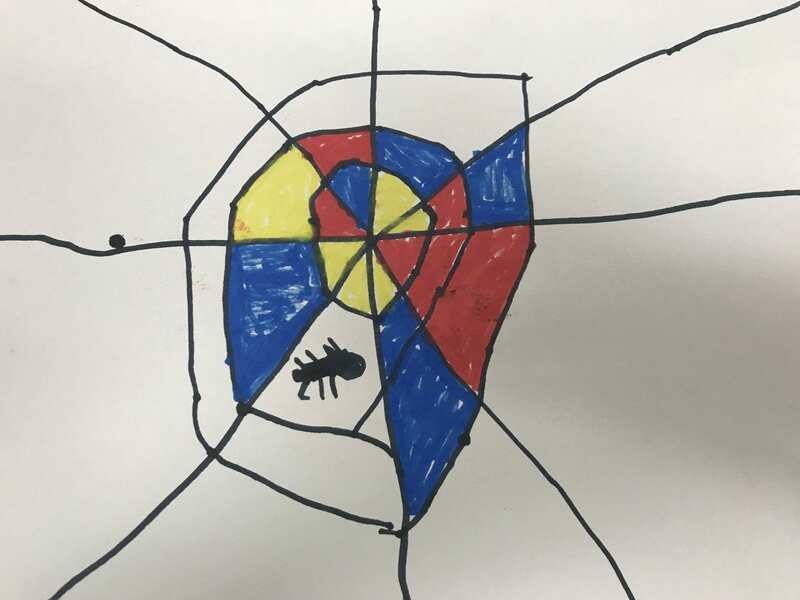 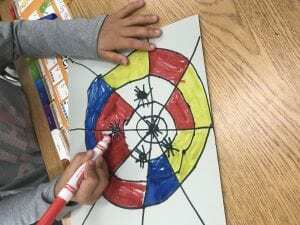 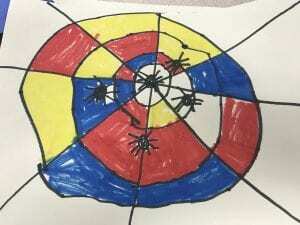 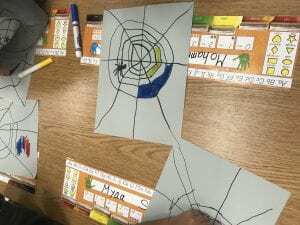 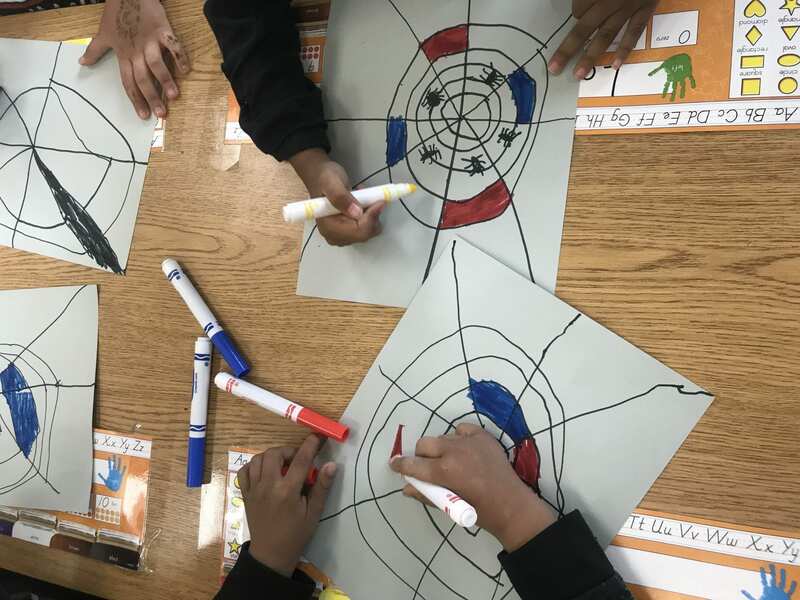 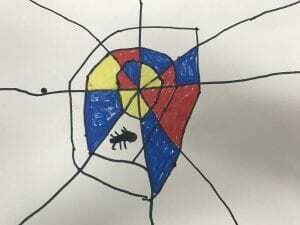 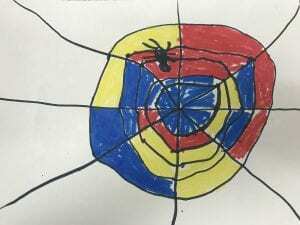 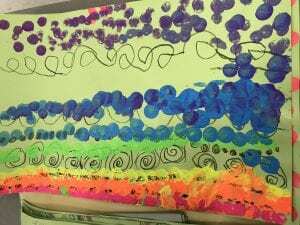 They drew a spider web with vertical, horizontal, and diagonal lines and then colored in their spider web with the primary colors. 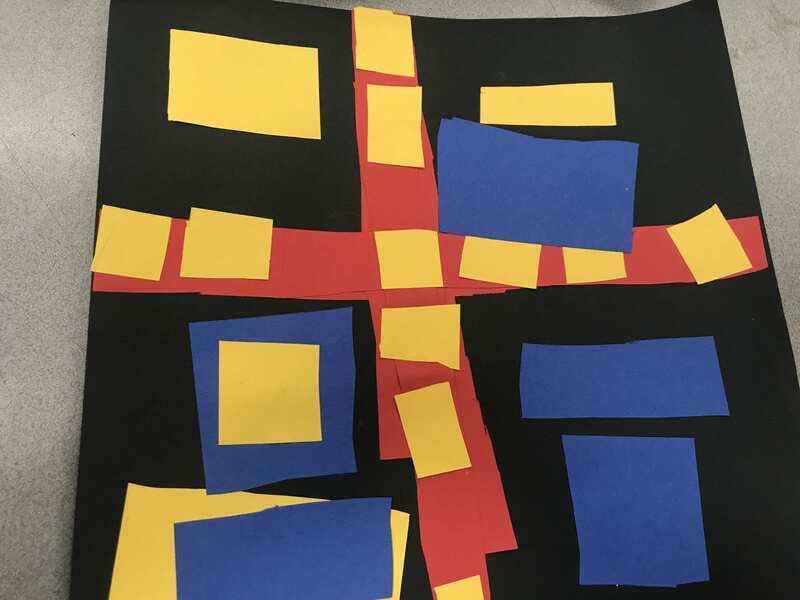 Then they looked at Piet Mondrian’s “Broadway Boogie Woogie” painting and created their own map-inspired collage using the primary colors. Then they were able to experiment with the primary colors and saw that when they were mixed together they create new colors! 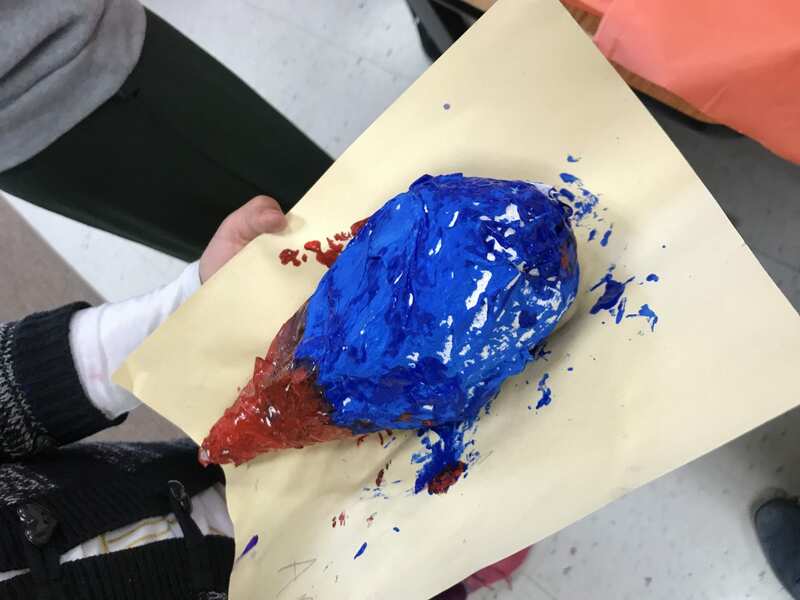 They mixed paint, oil pastels, and modeling clay. 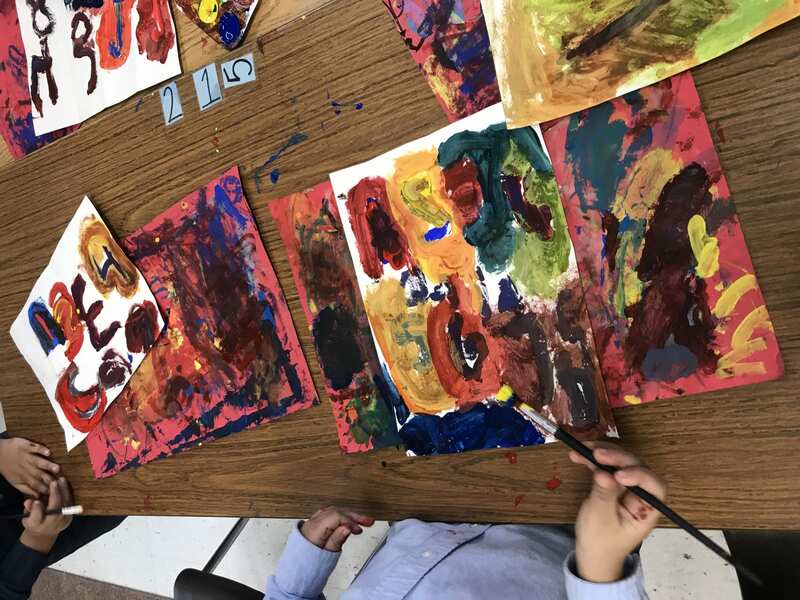 First grade artists mixed the primary colors of paint together, too! 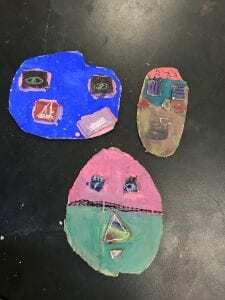 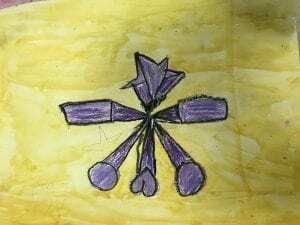 They created the three secondary colors, orange, green, and purple. 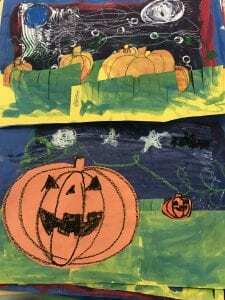 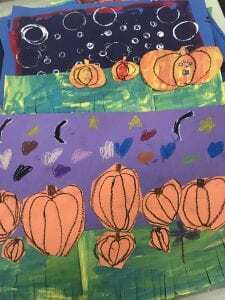 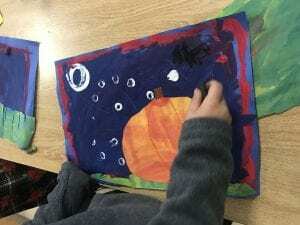 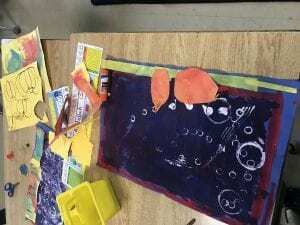 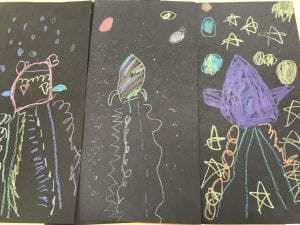 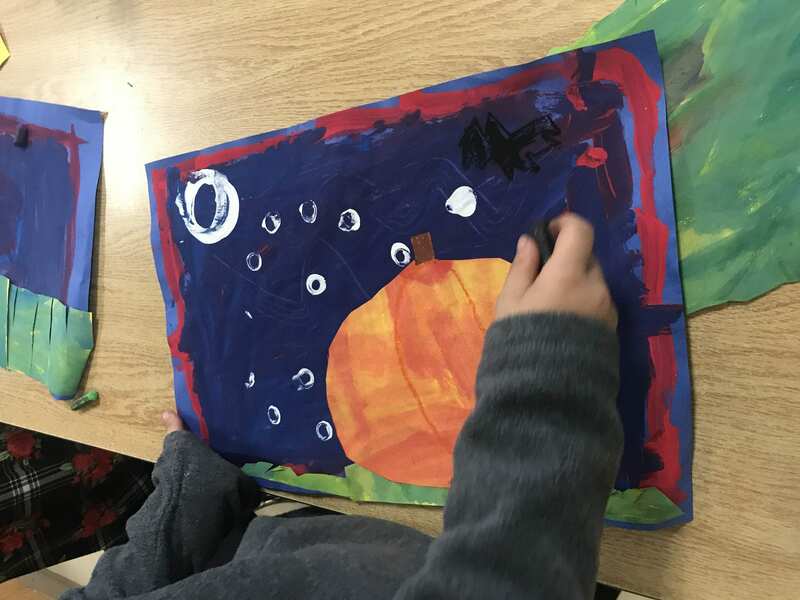 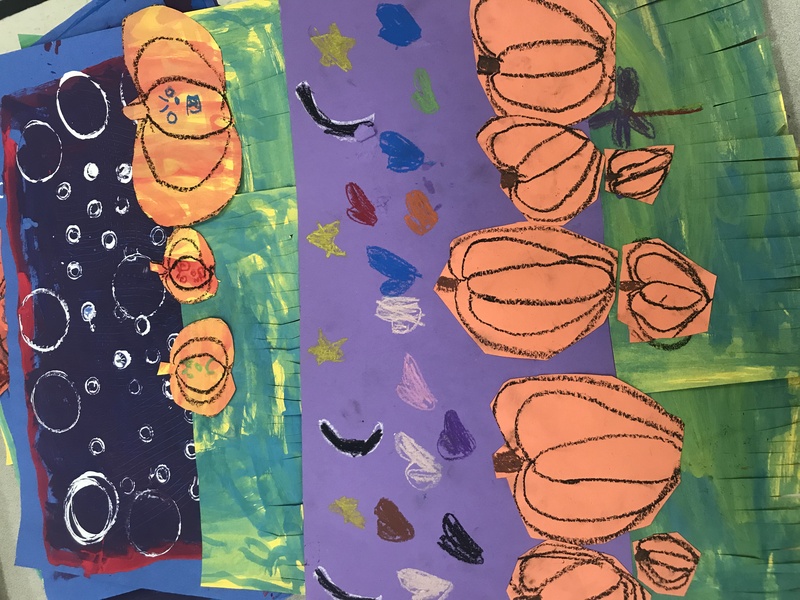 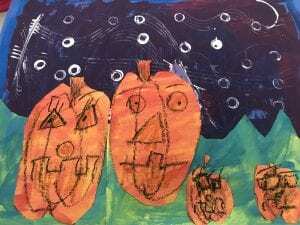 With their painted papers they created a collage that showed a night time sky, grass, and pumpkins! 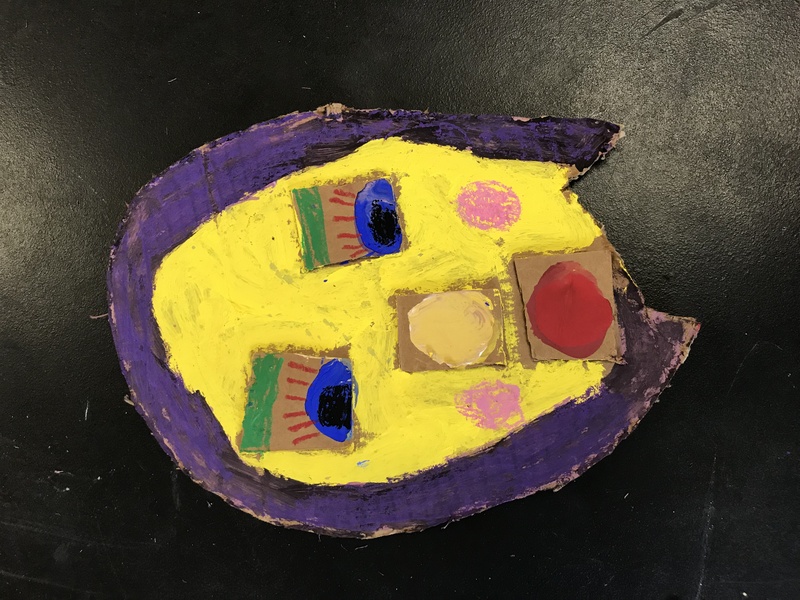 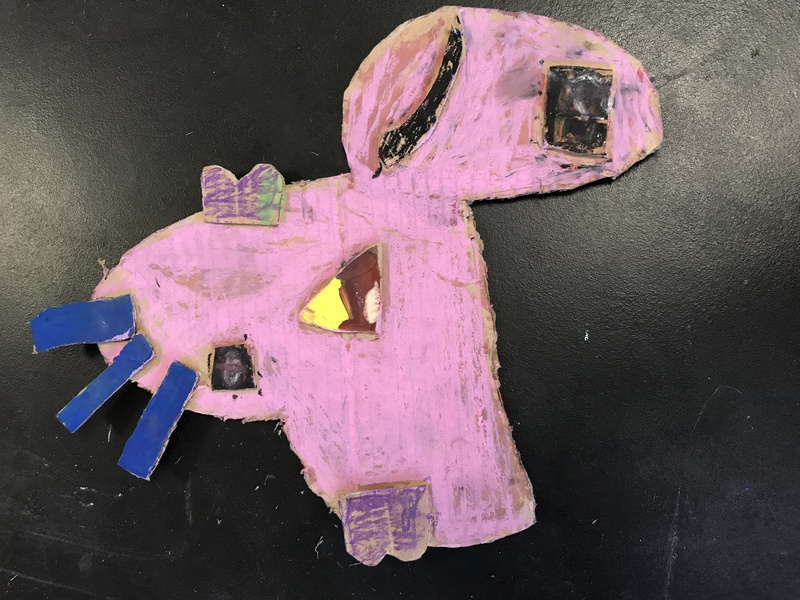 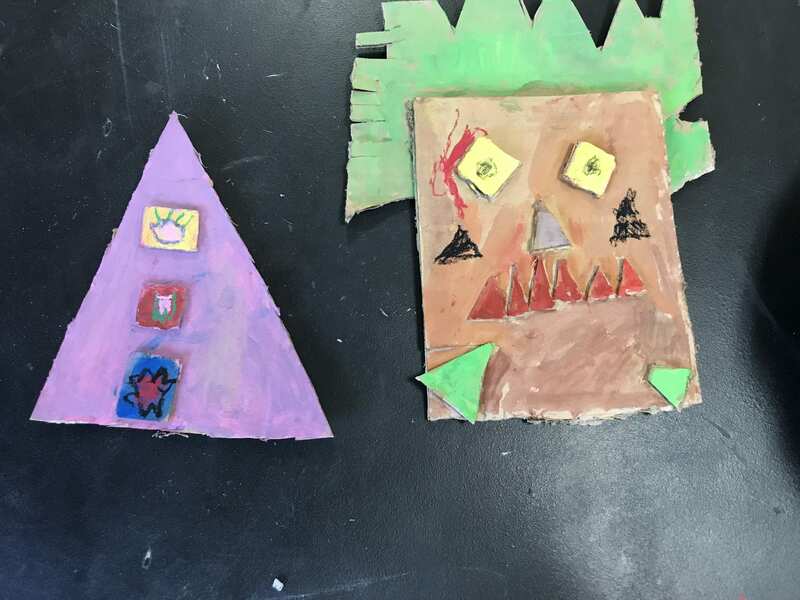 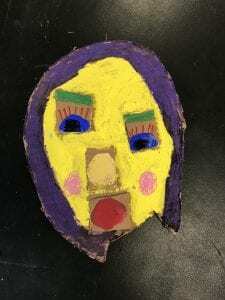 Third grade artists have begun to create cubism inspired masks out of cardboard. 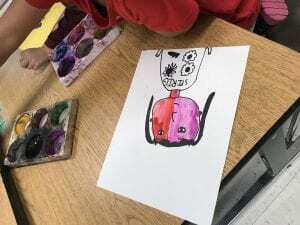 They looked at some cubism paintings and then sketched their own cubism mask design on paper. 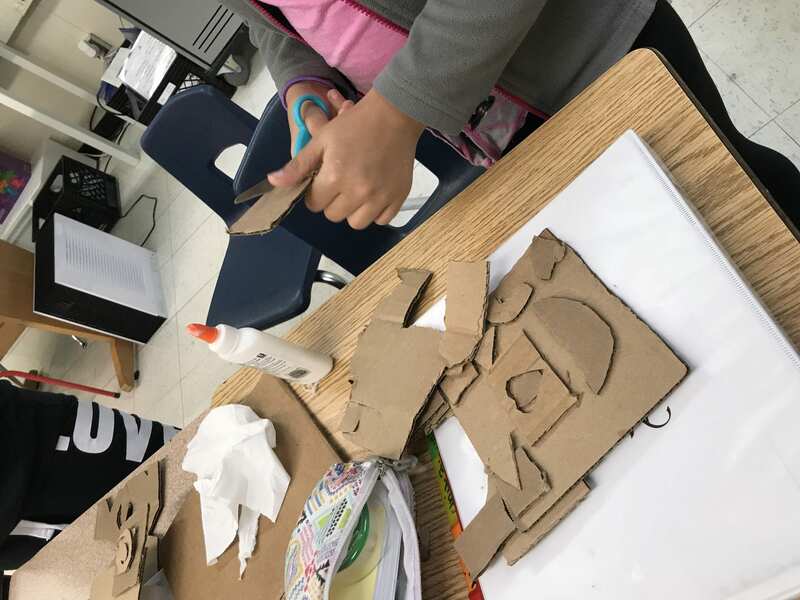 Then they worked on cutting out all of the shapes they needed from cardboard and gluing them together. 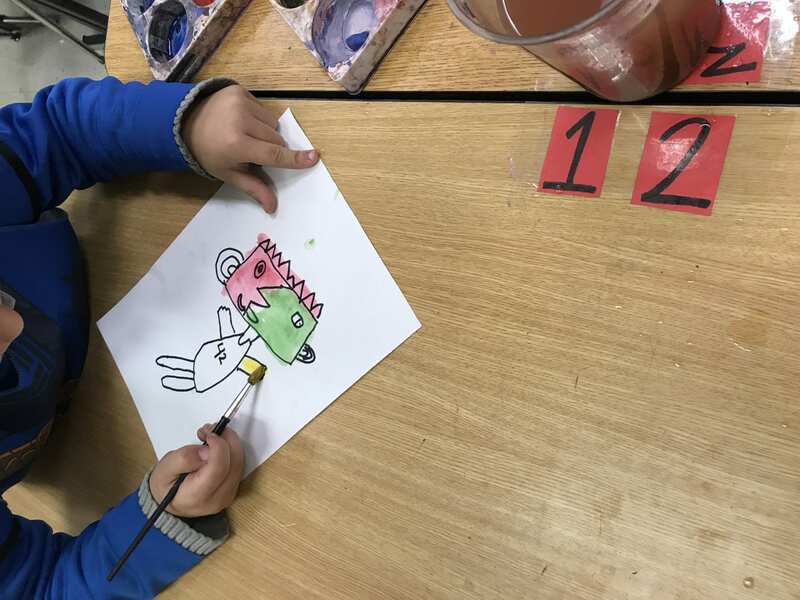 They are currently painting their masks to match their sketch. 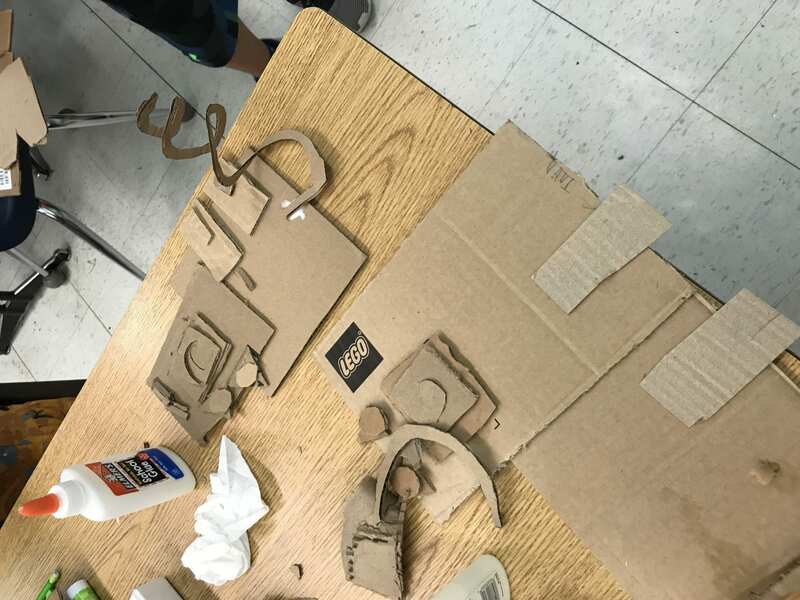 Stay tuned for photos of their progress! 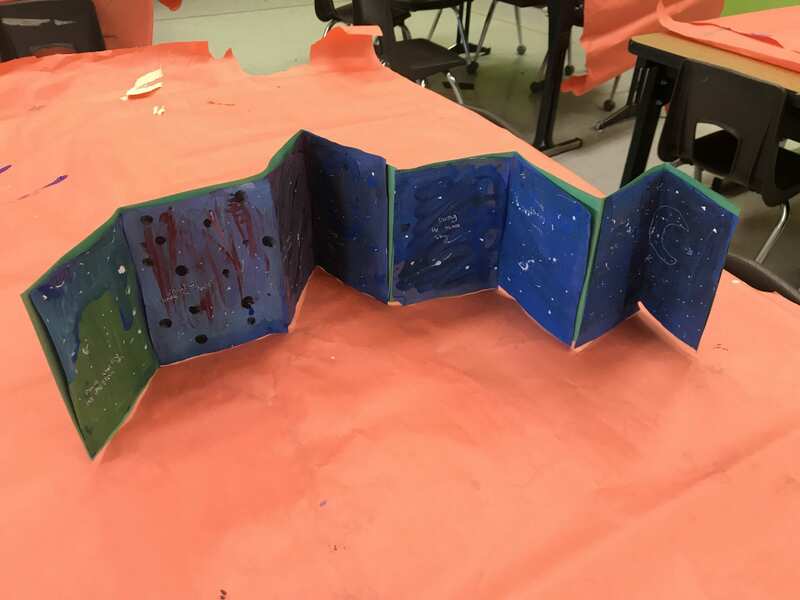 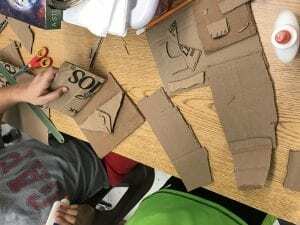 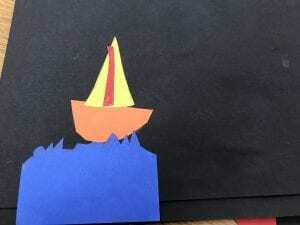 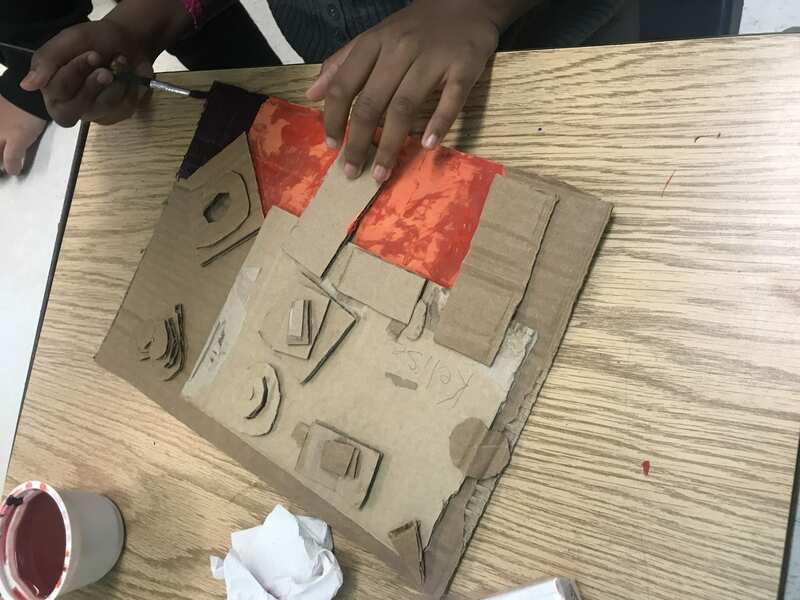 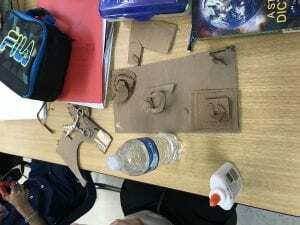 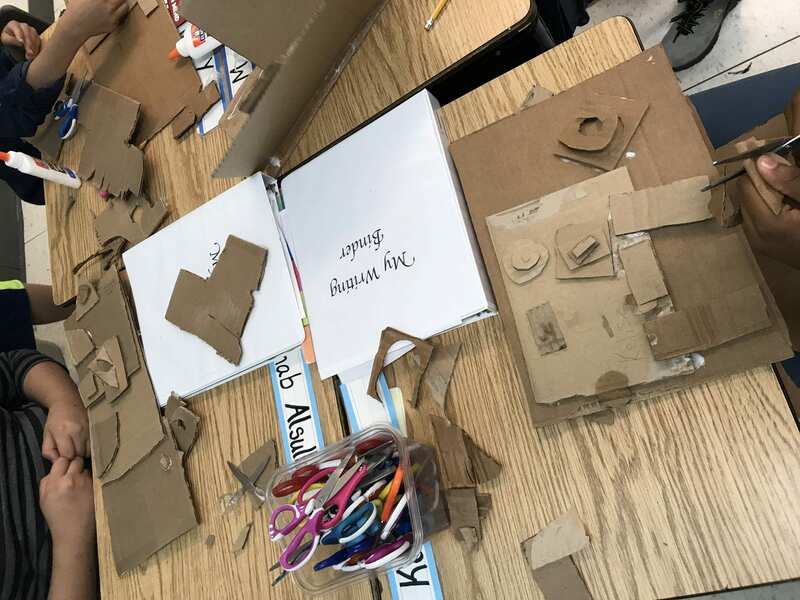 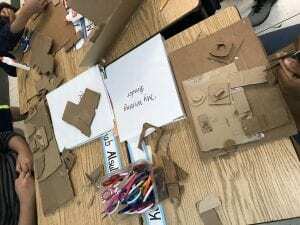 Fifth grade artists have also been working with cardboard! 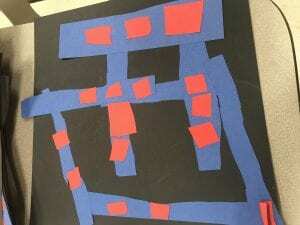 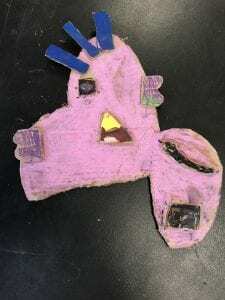 They have been creating abstract, low-relief sculptures that show the principle of balance. They learned about different ways to visually balance an artwork and looked at abstract artists’ artwork for some inspiration. They are finishing the painting step now to give their sculptures color and patterns. 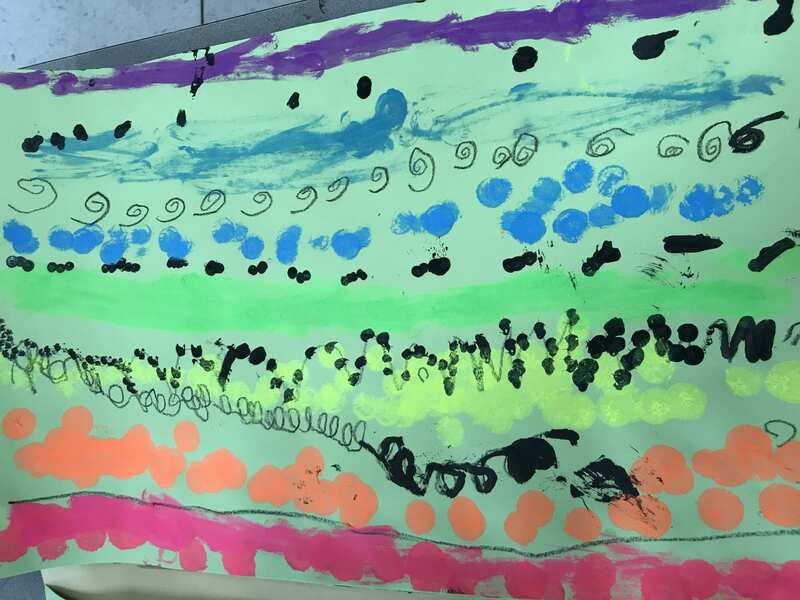 Kindergarten and Young 5 artists have been busy learning all about LINES in the art room during the month of September! 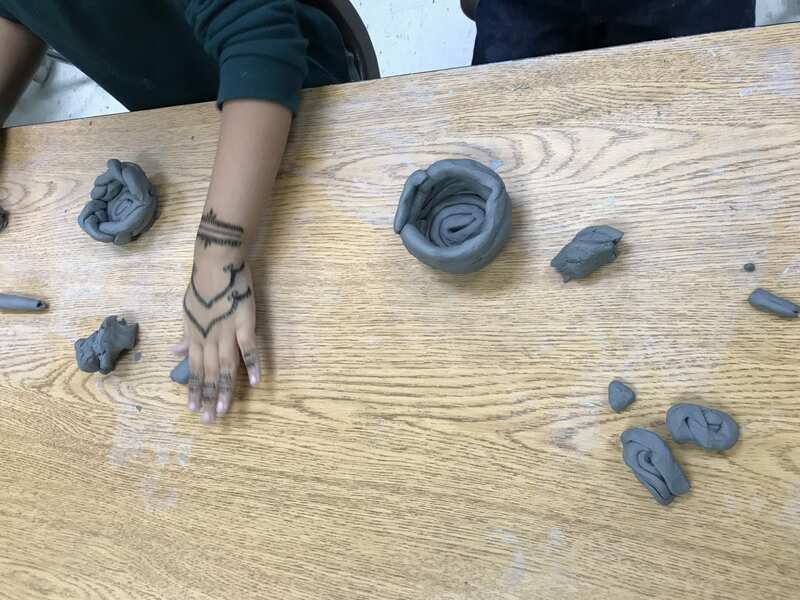 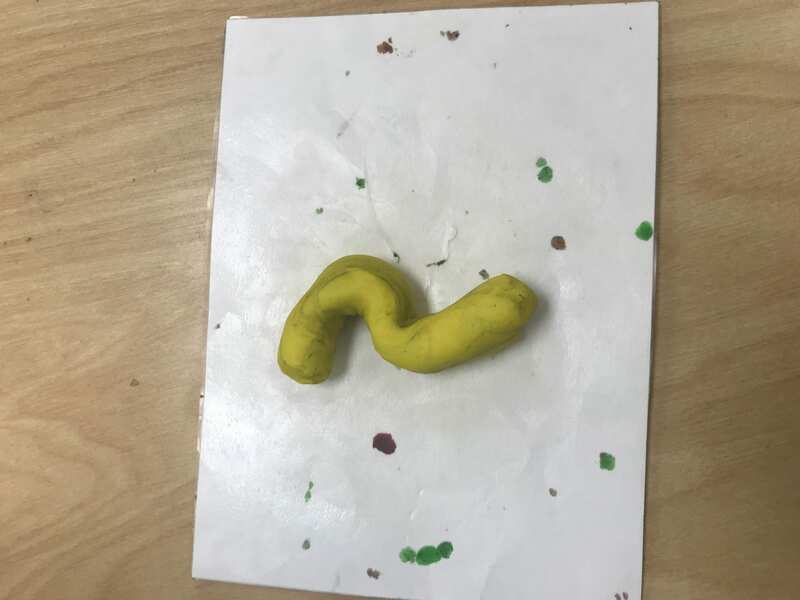 They began by learning the names of the lines then drew the lines and made lines out of modeling clay. 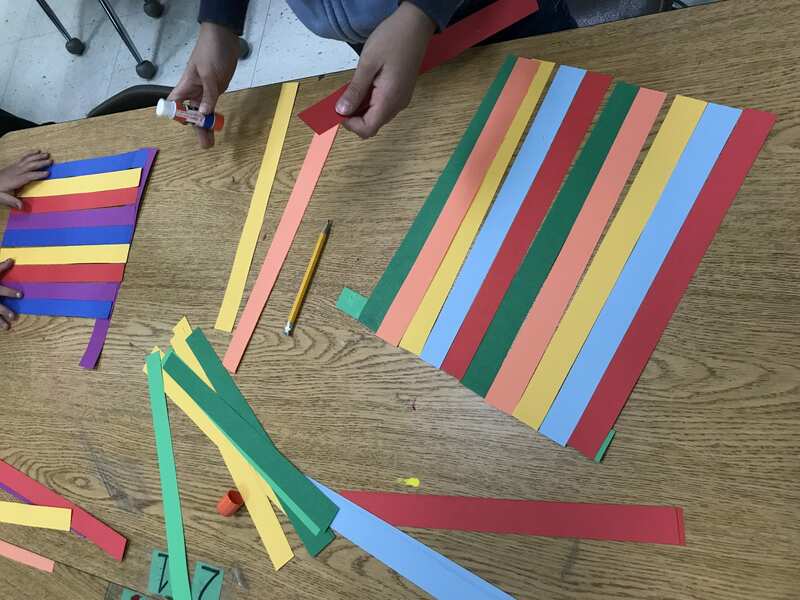 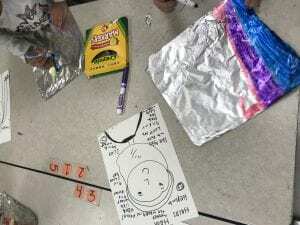 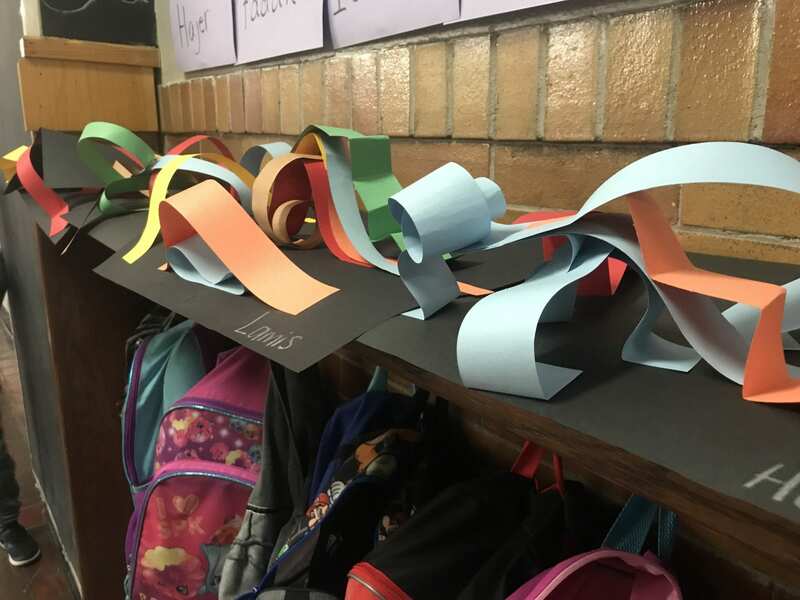 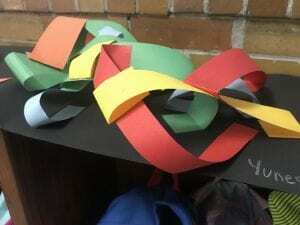 Then they made line sculptures by folding, rolling, bending, and gluing strips of paper to pop-out of their paper. 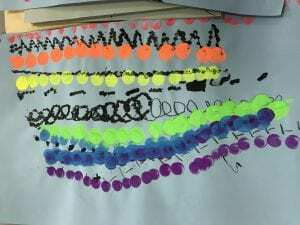 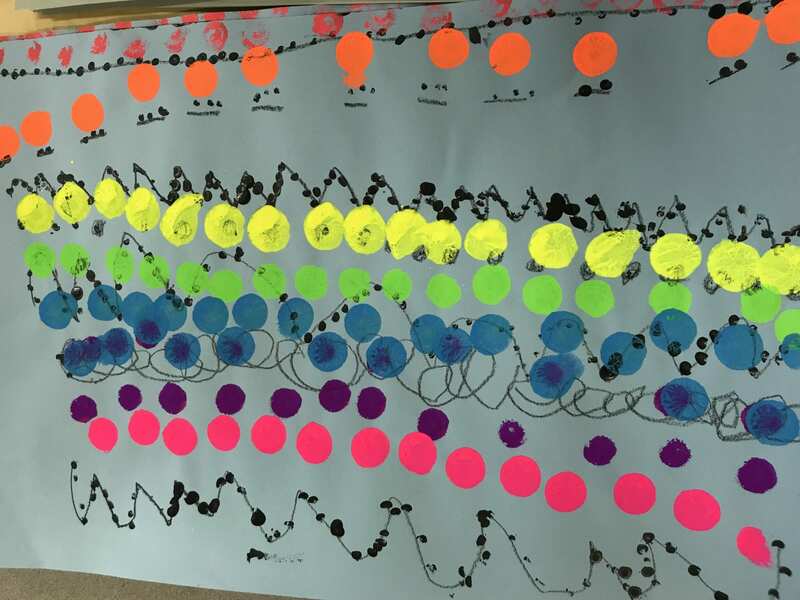 Then they used paint to print dots along their lines and stamped the rainbow colors between their lines. 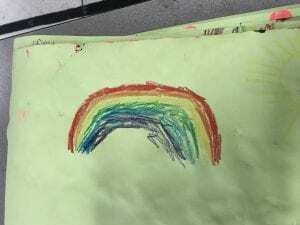 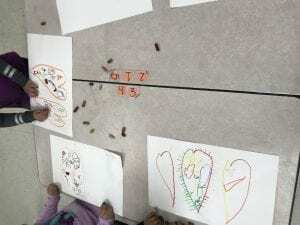 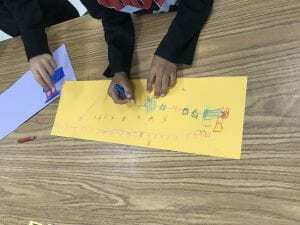 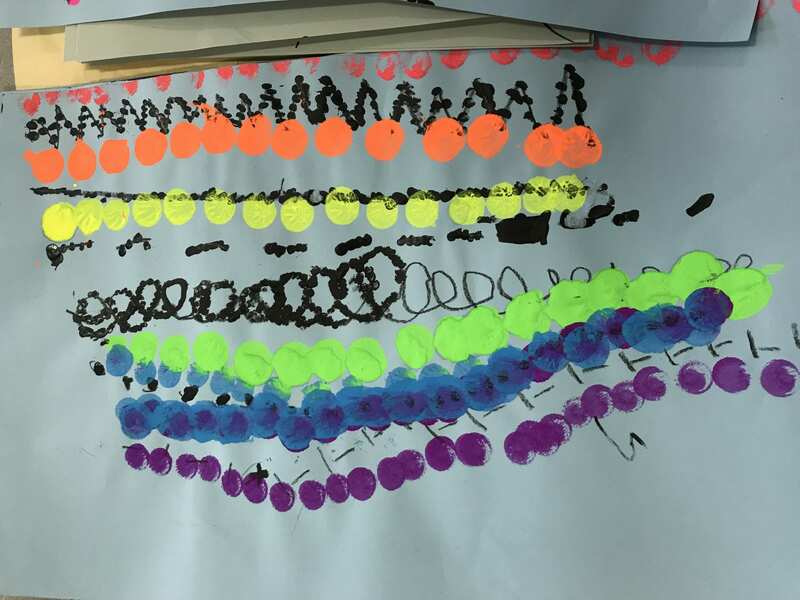 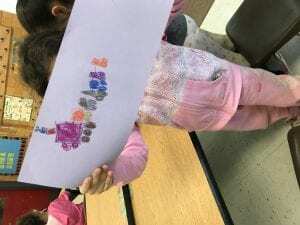 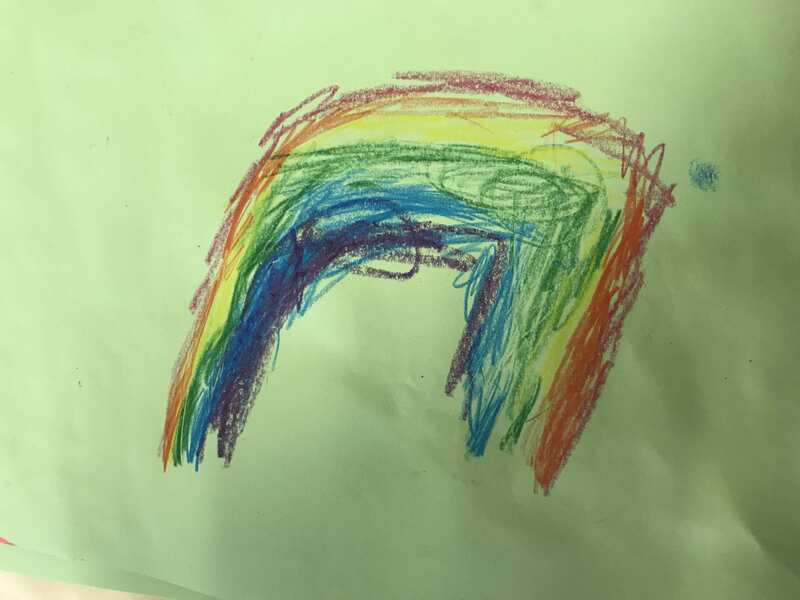 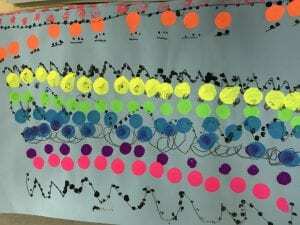 They learned about the color order of the rainbow, drew a rainbow and then used dot-stampers to show the rainbow order between their black lines. 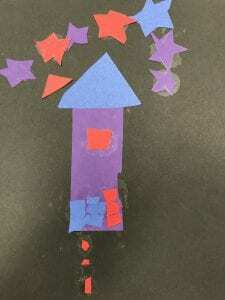 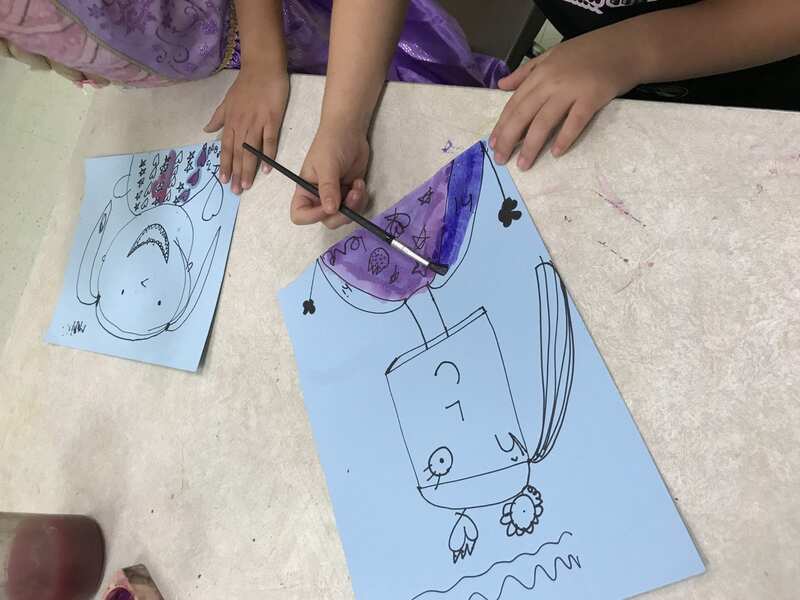 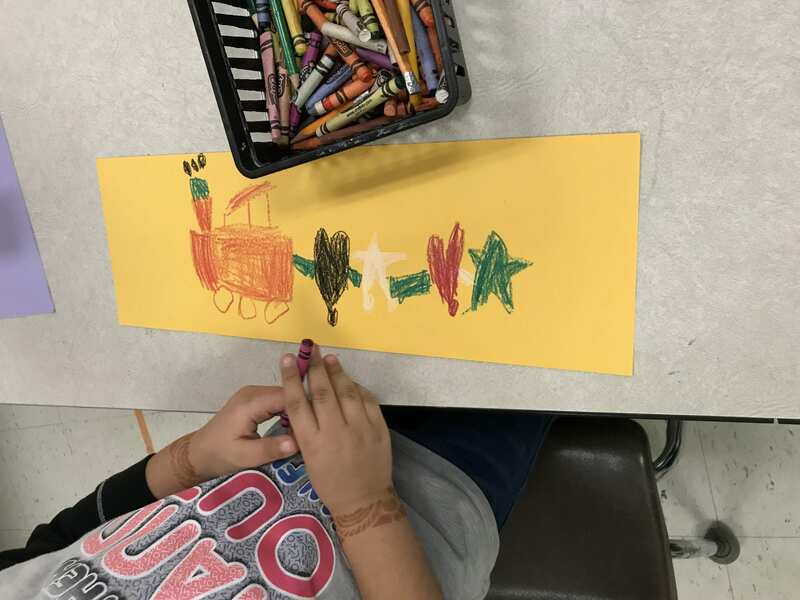 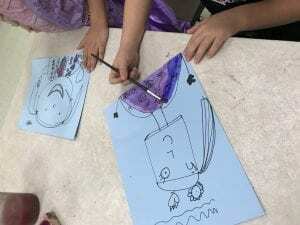 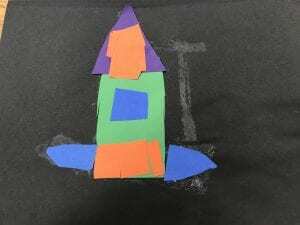 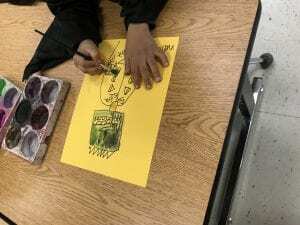 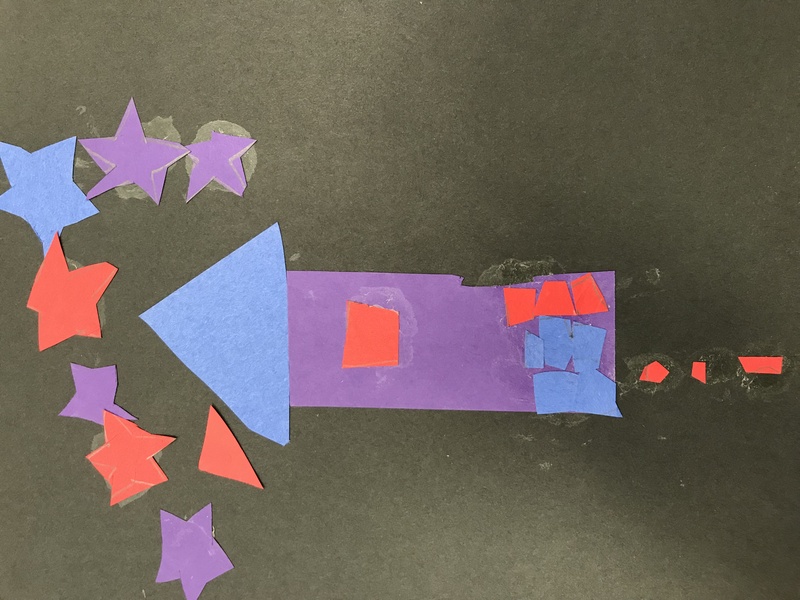 First grade artists reviewed some of their lines and shapes with a rocket ship drawing one day in art. 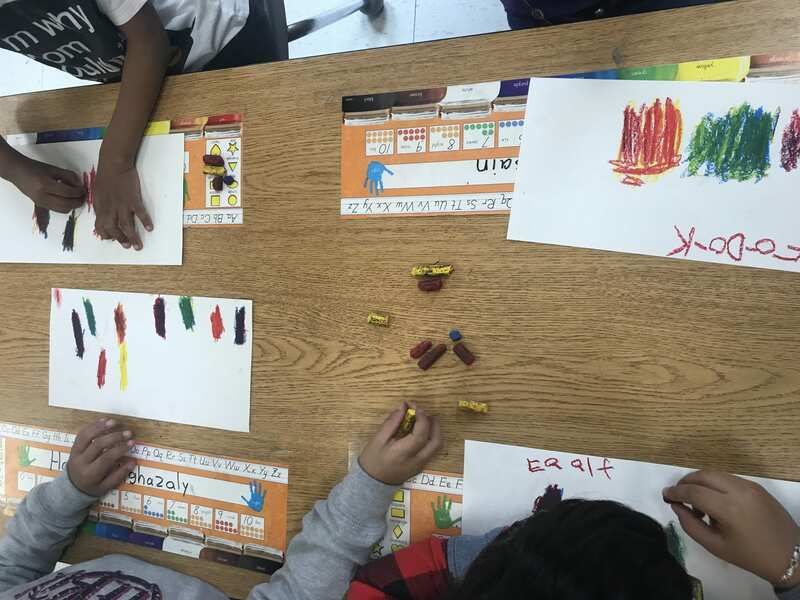 Then they began to learn about the primary colors, red, yellow, and blue! 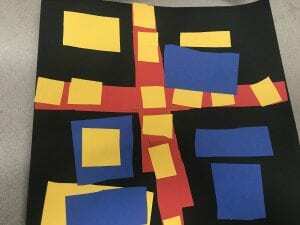 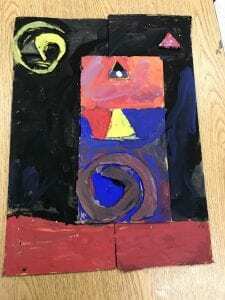 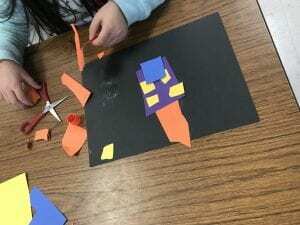 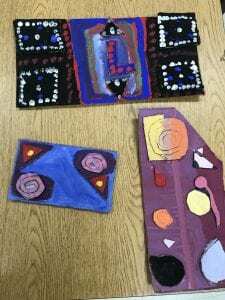 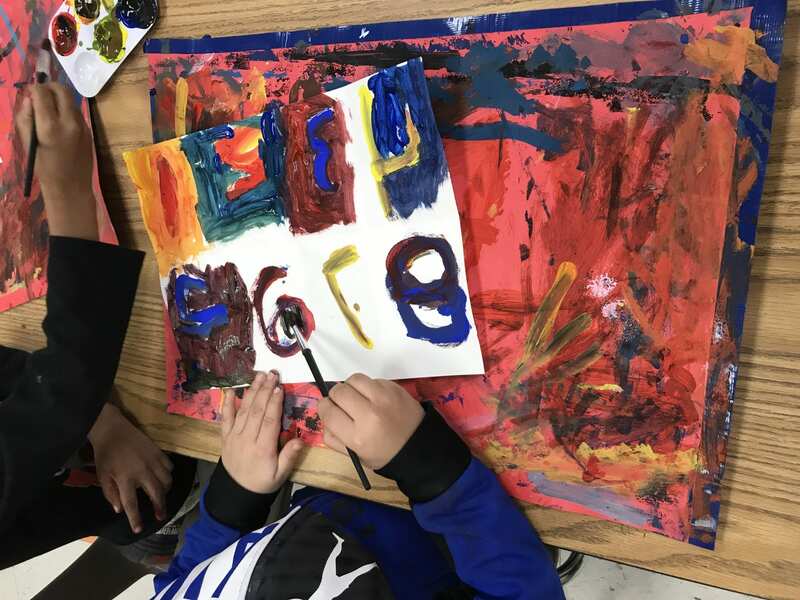 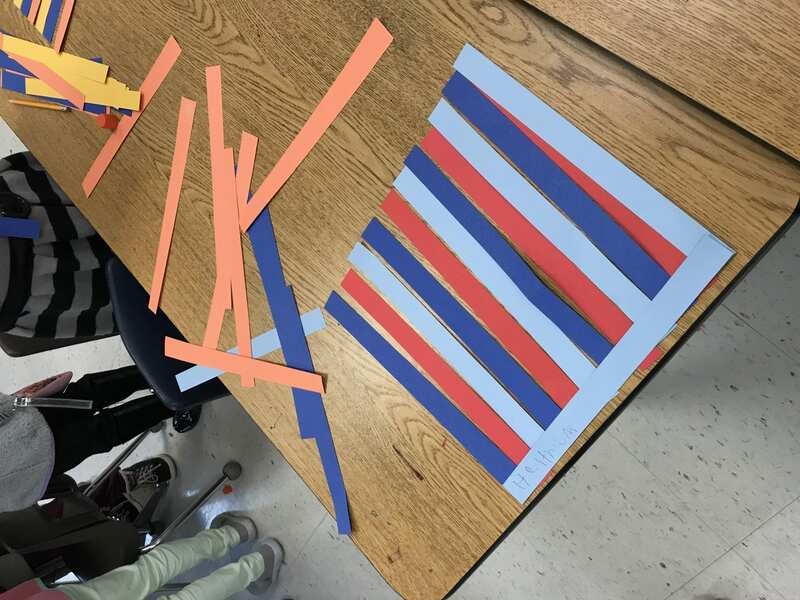 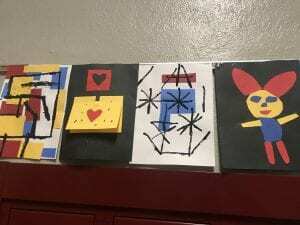 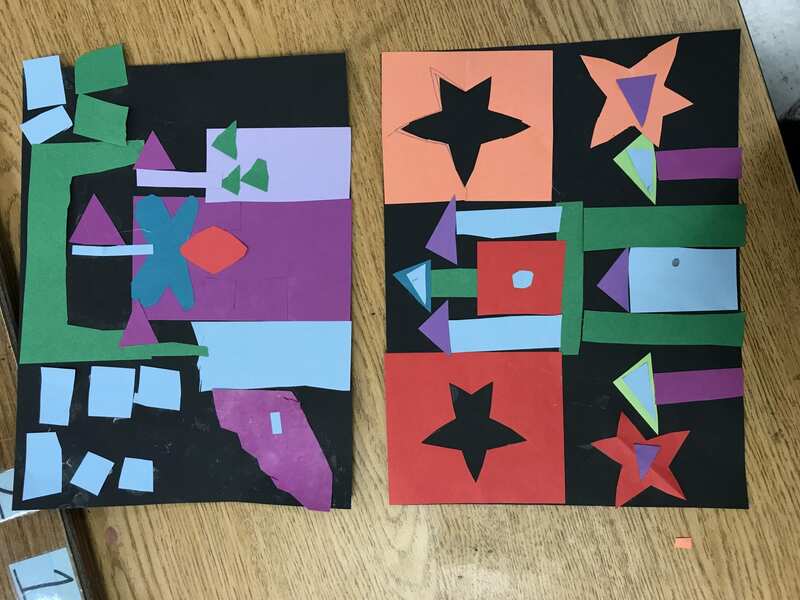 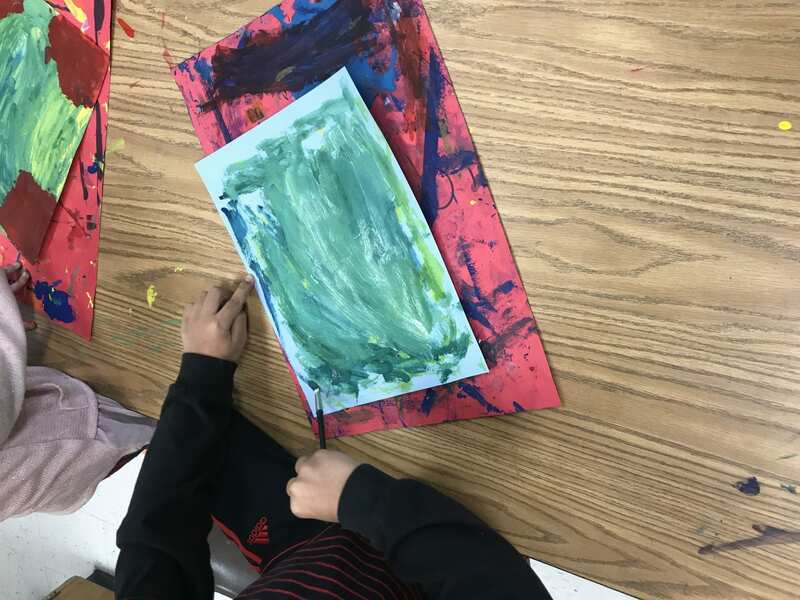 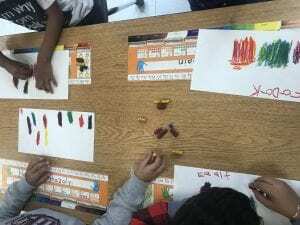 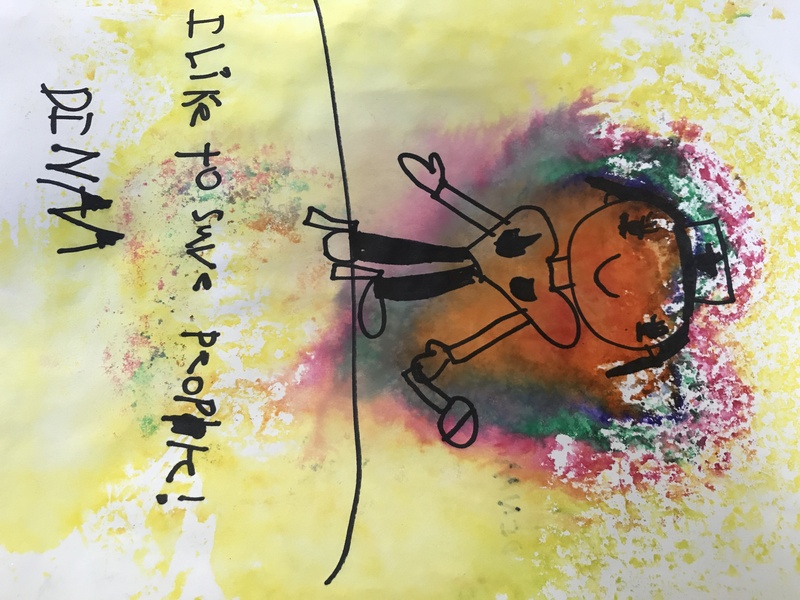 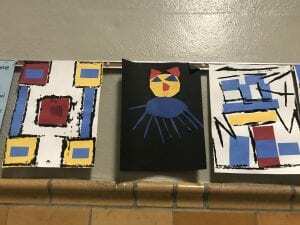 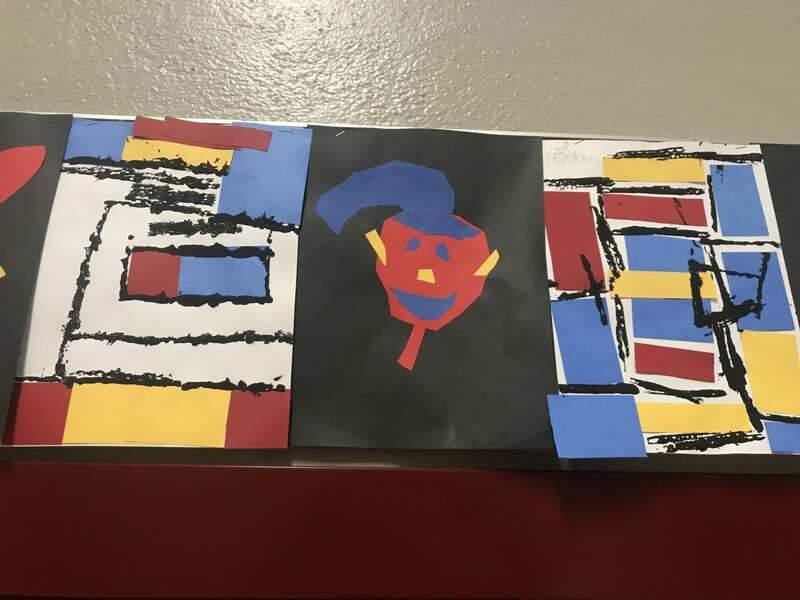 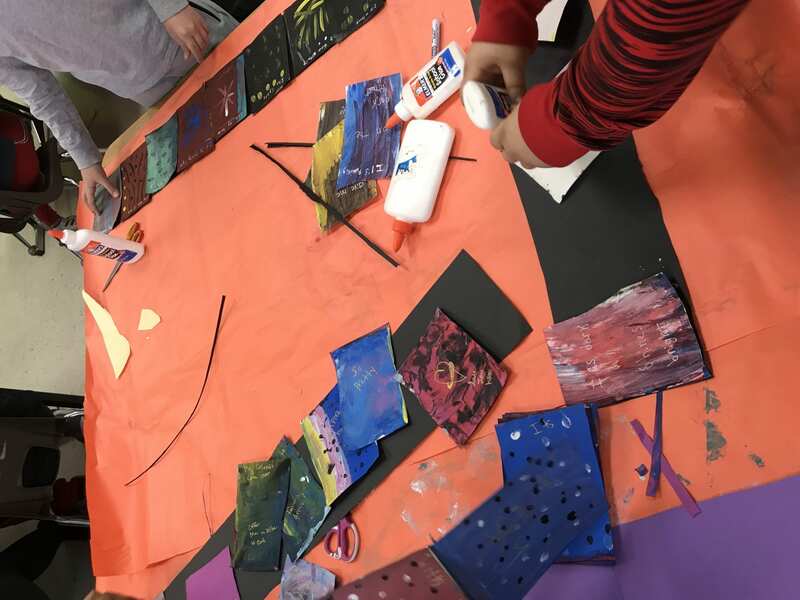 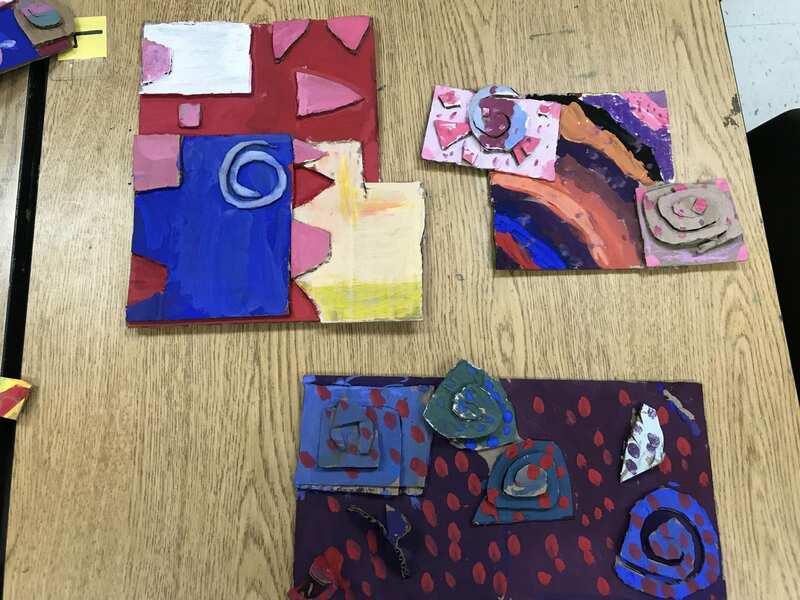 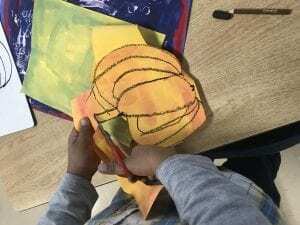 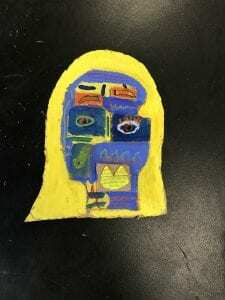 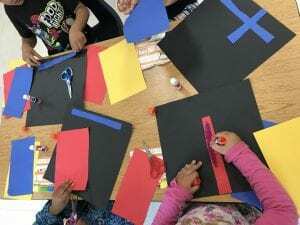 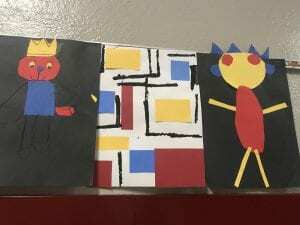 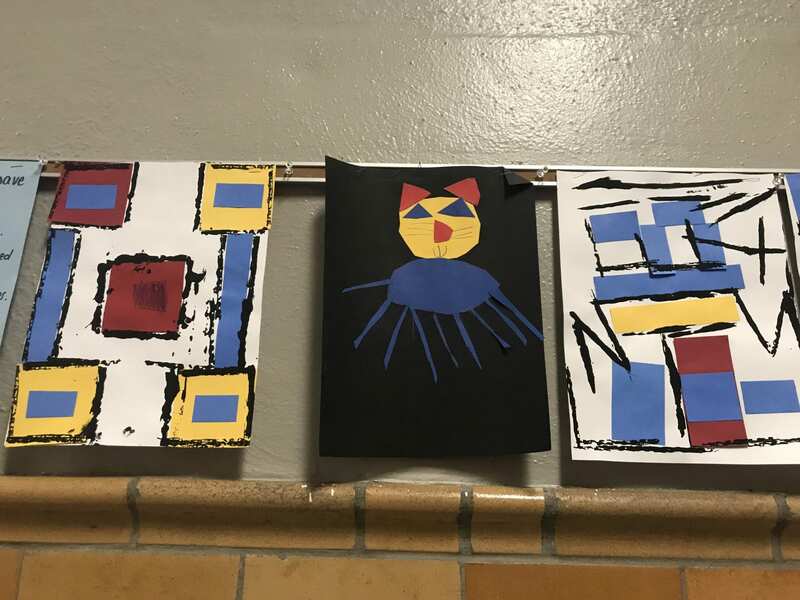 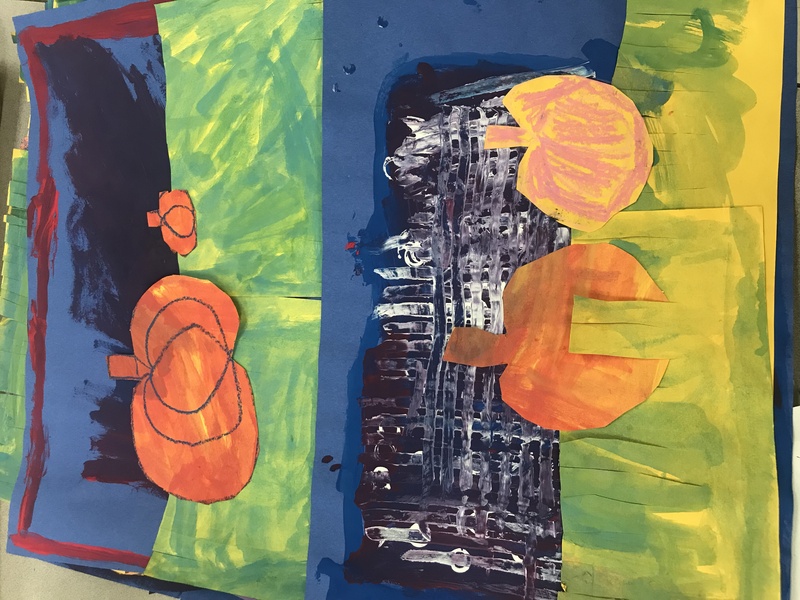 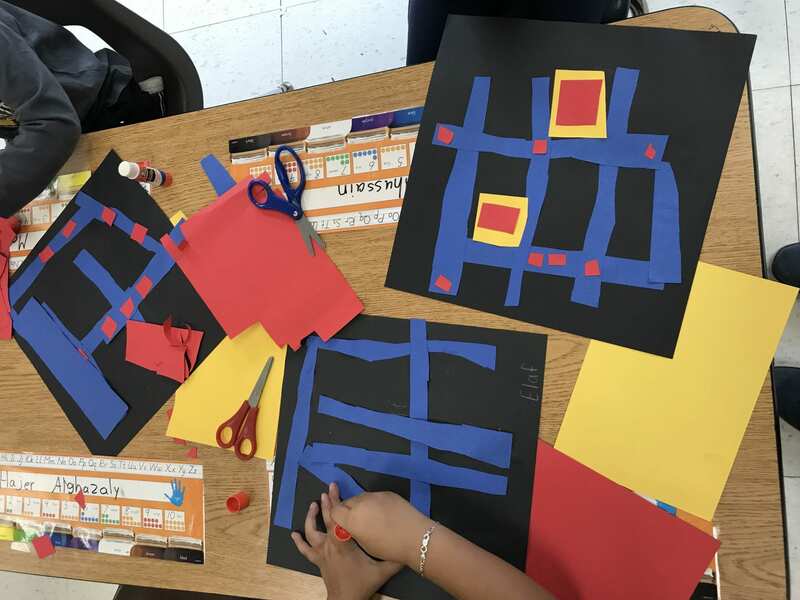 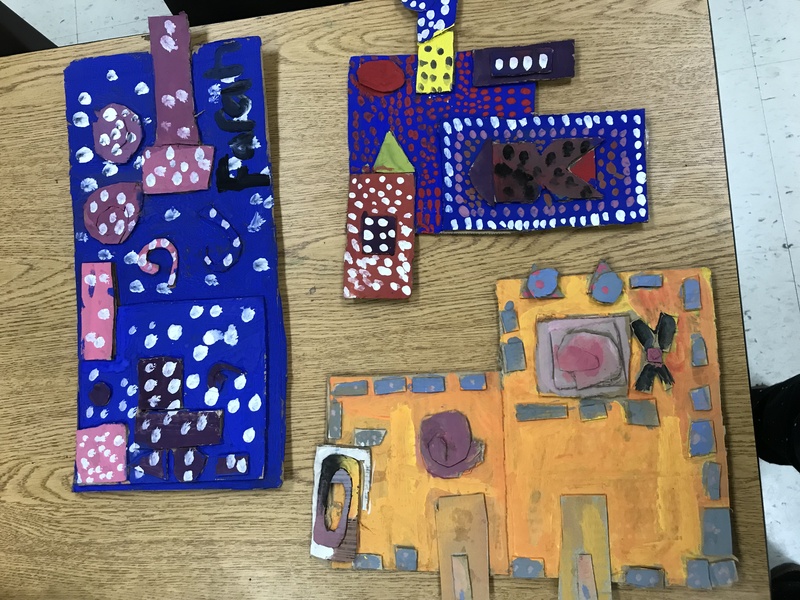 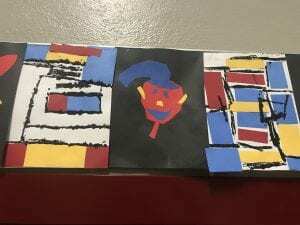 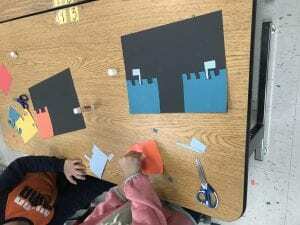 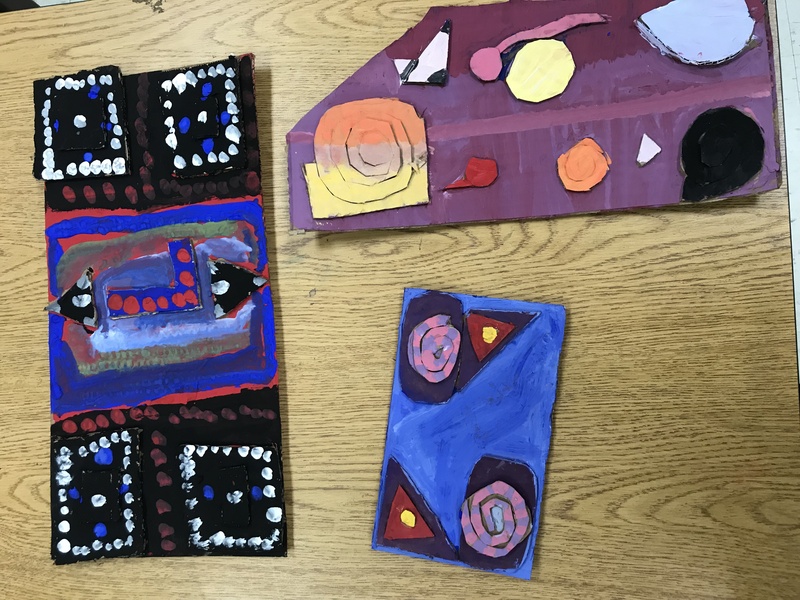 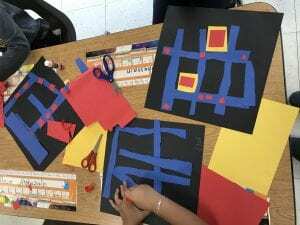 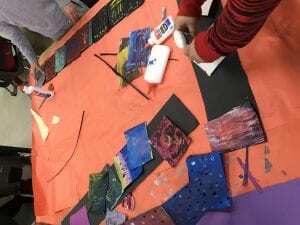 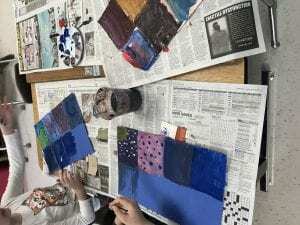 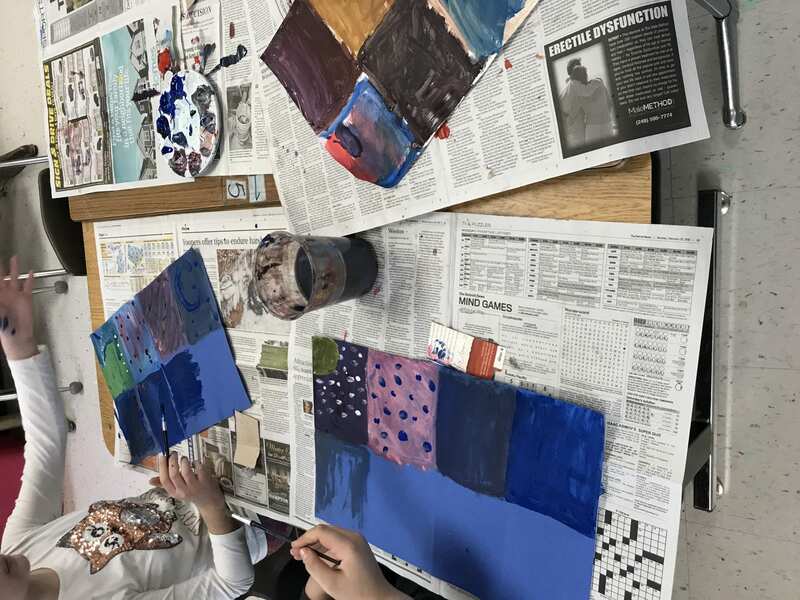 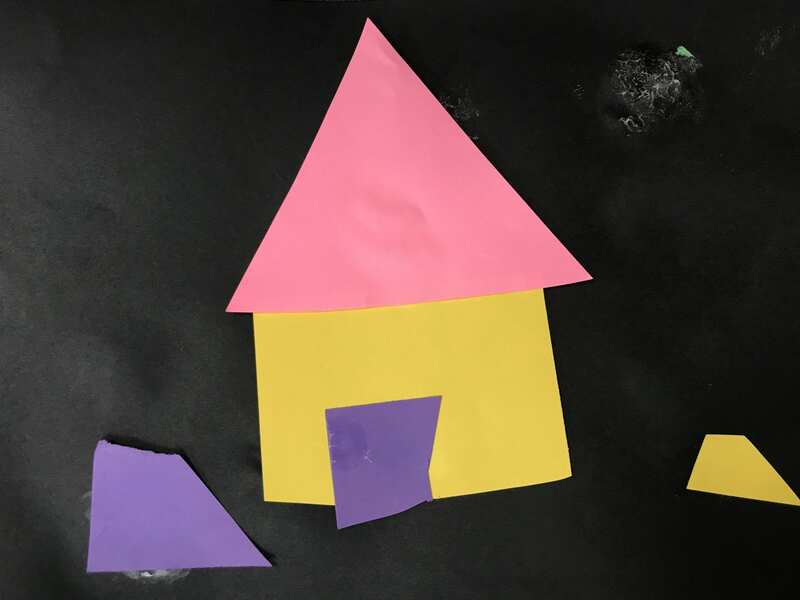 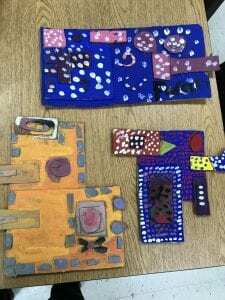 They created a Mondrian-inspired collage with primary color paper and black printed paint lines, and then a collage from their own imagination using the primary colors. Now they have begun to see what happens when they mix two primary colors together with paint. 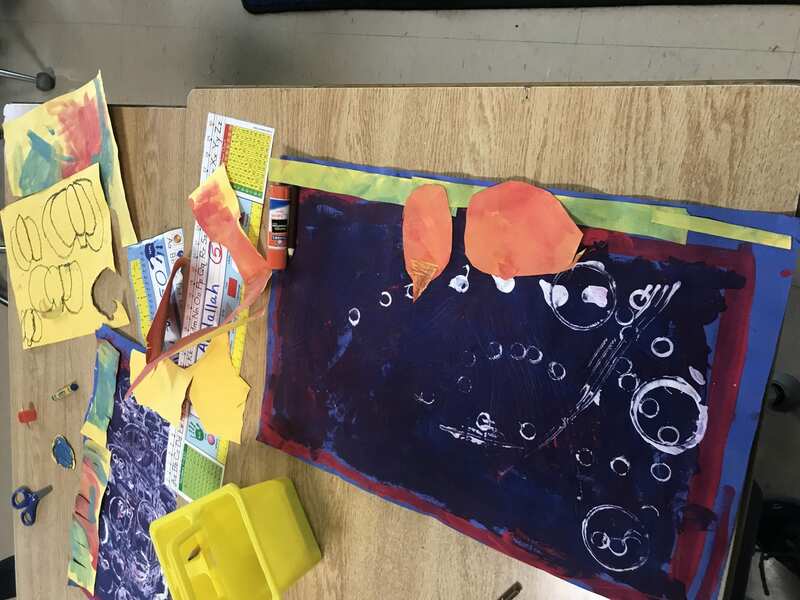 In the month of October they will continue to mix colors with paint and will make a new collage- stay tuned! 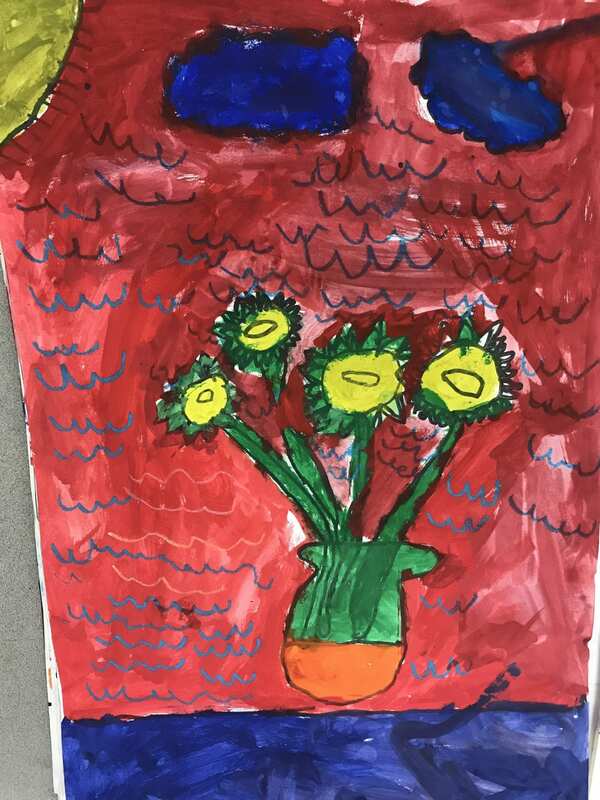 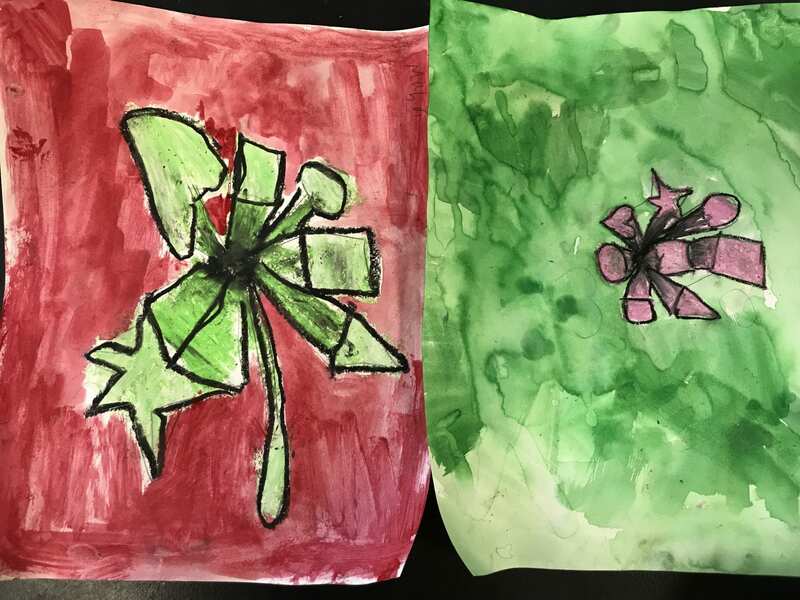 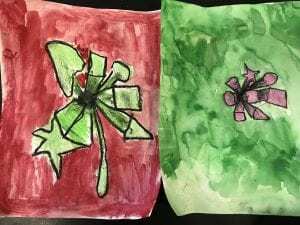 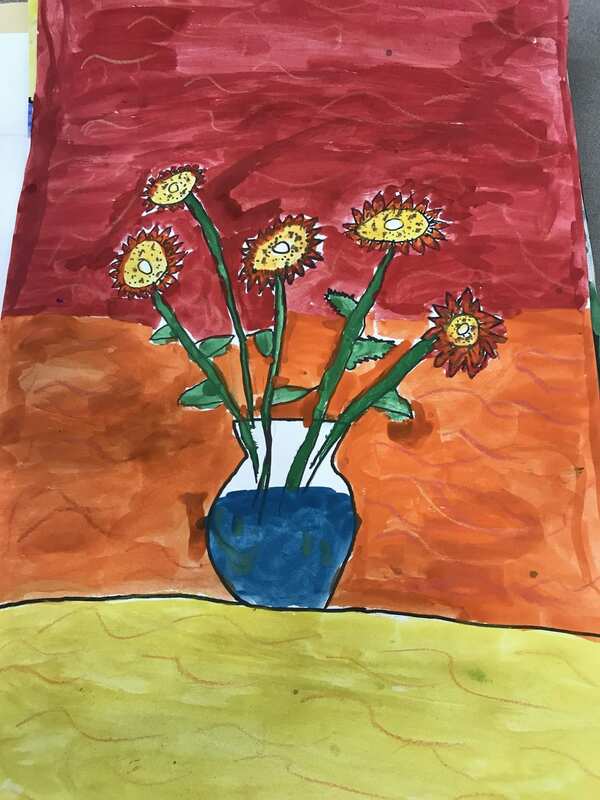 Third grade artists have been working on a flower still life painting. 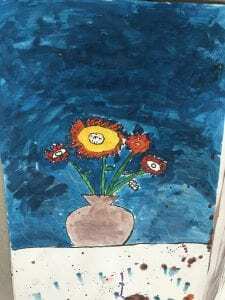 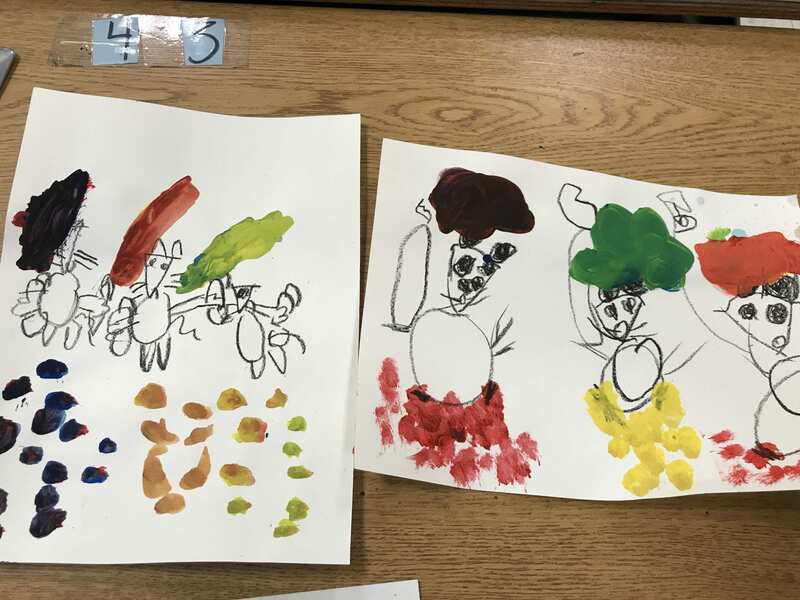 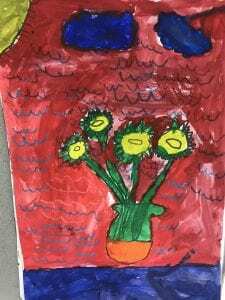 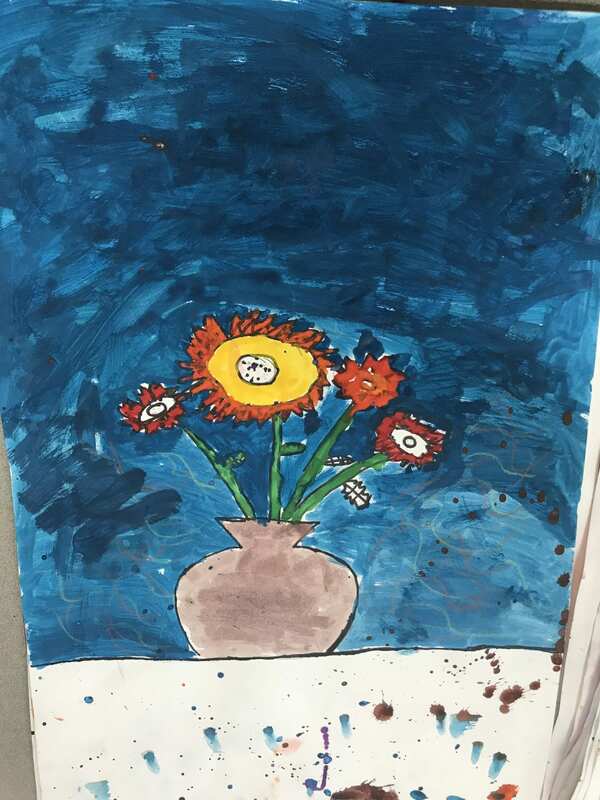 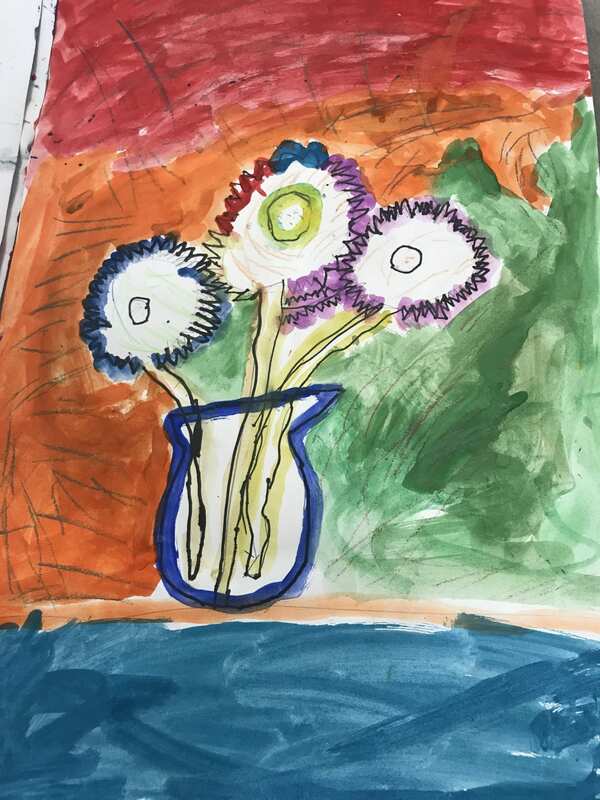 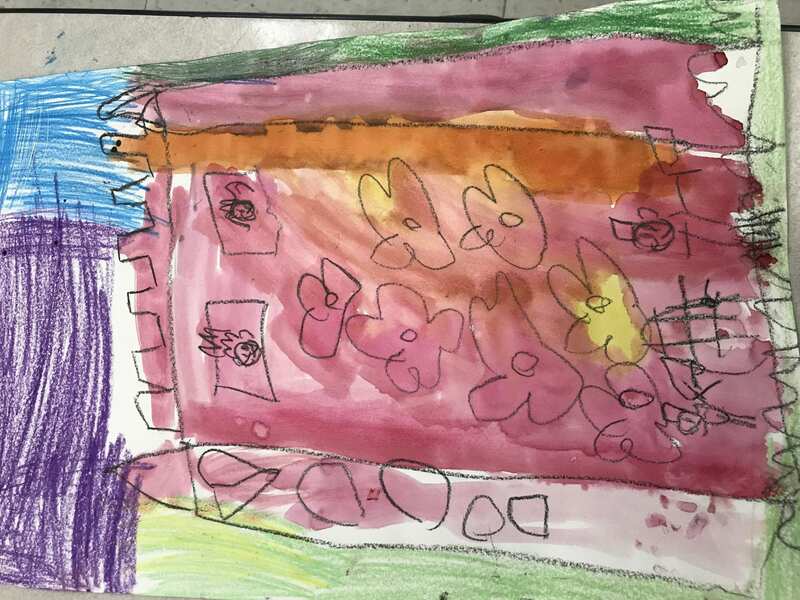 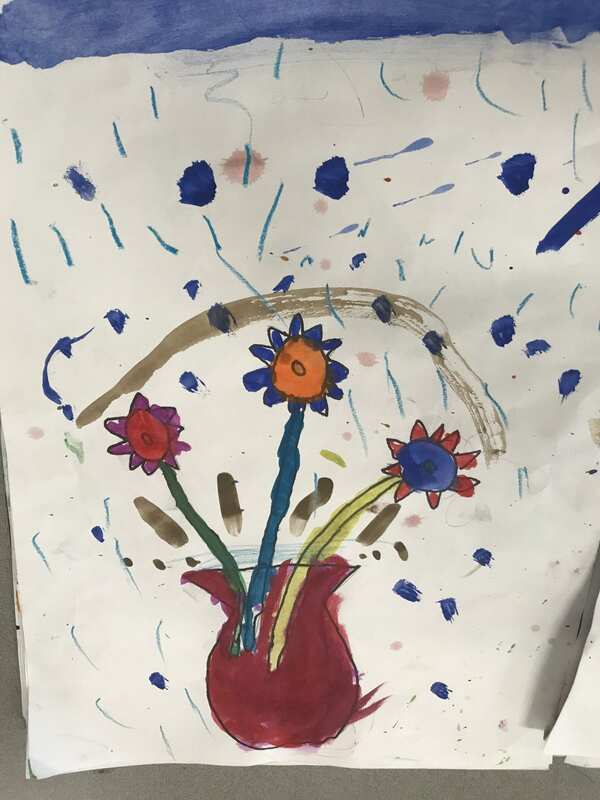 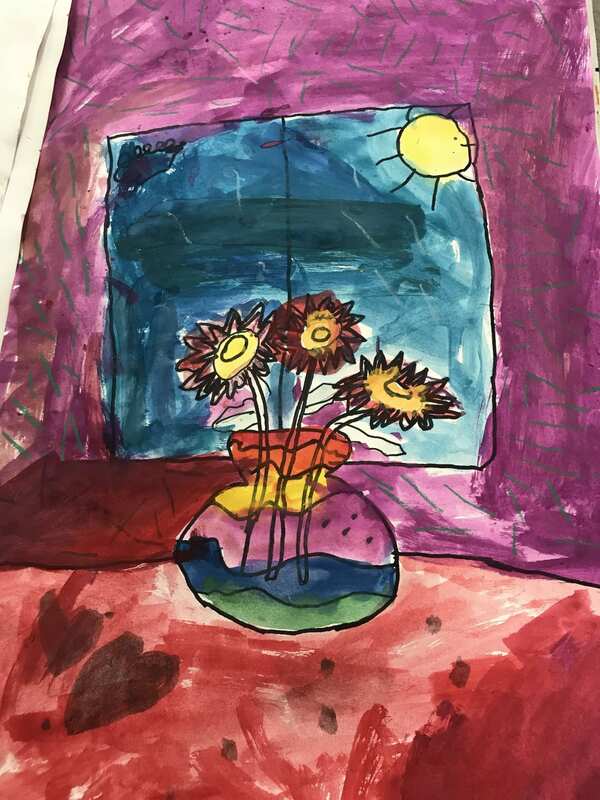 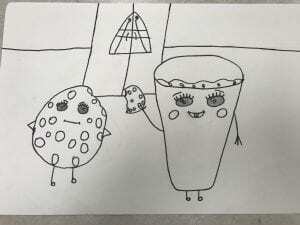 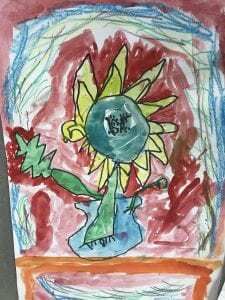 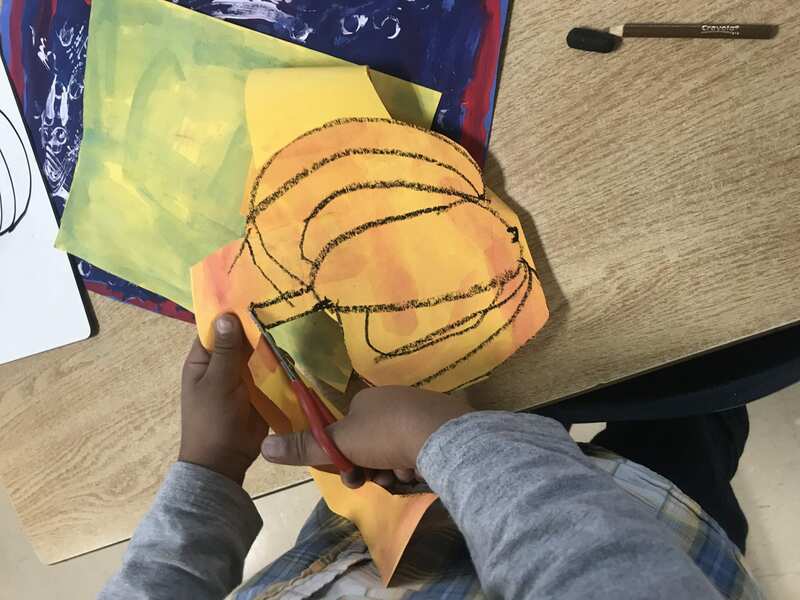 They drew the still life one day, looking at the flowers that were placed on their tables and then have been painting and adding details or texture with crayons. 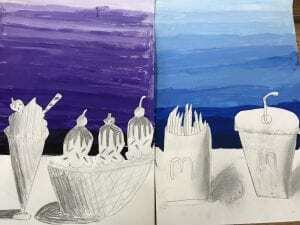 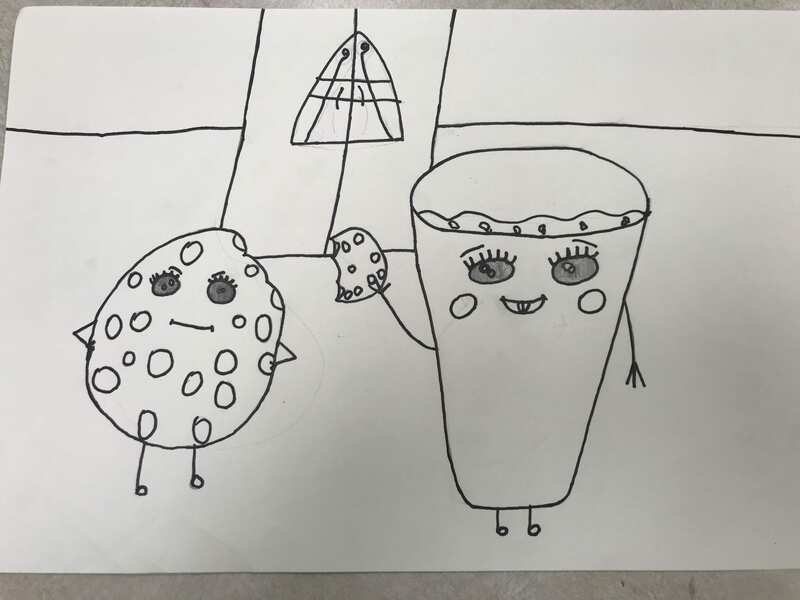 Fifth grade artists have been working on a still life drawing that shows both what they look like and some of their interests or talents. 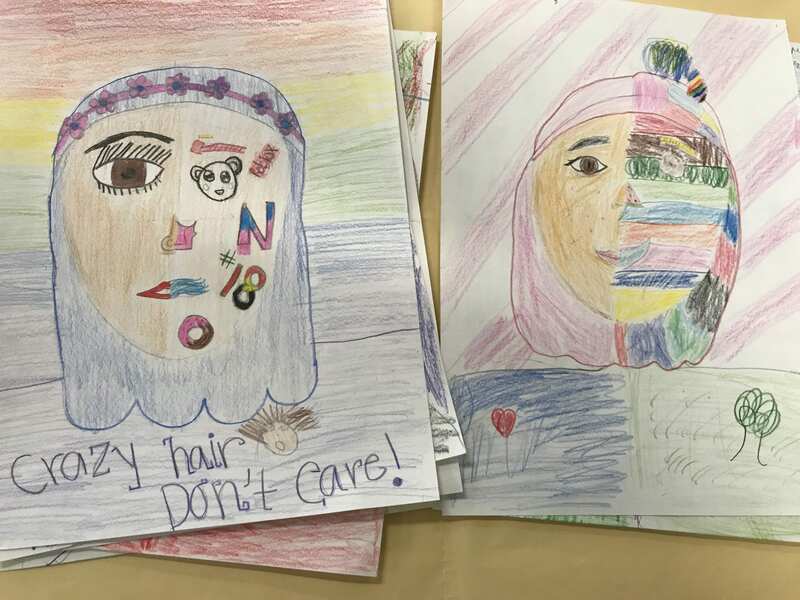 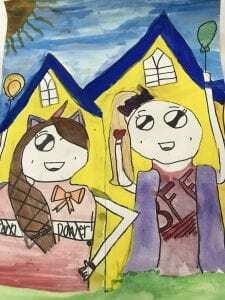 On the first day of art class at Lowrey each class read the book “You Be You” by Linda Kranz. 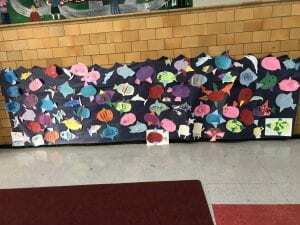 Each artist created their own unique fish like in the story. 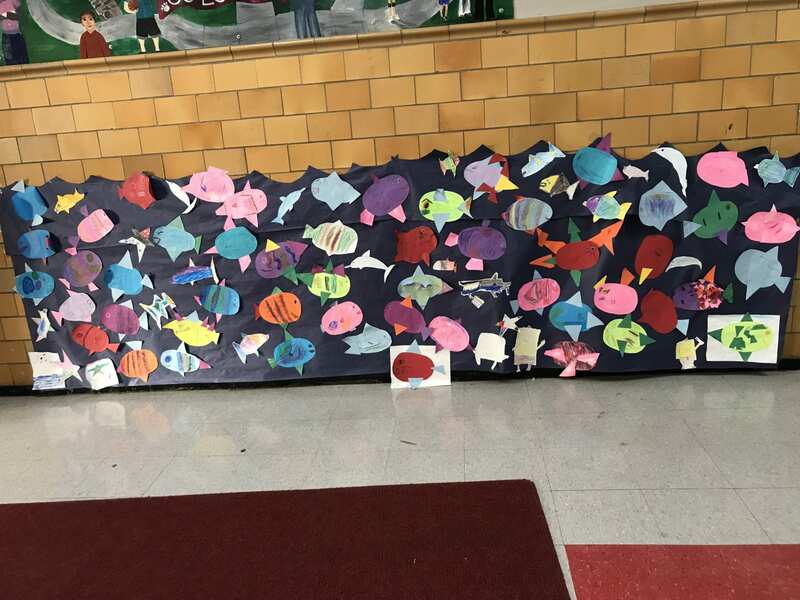 All of our fish are “swimming” together on one of the walls outside of the art rooms!